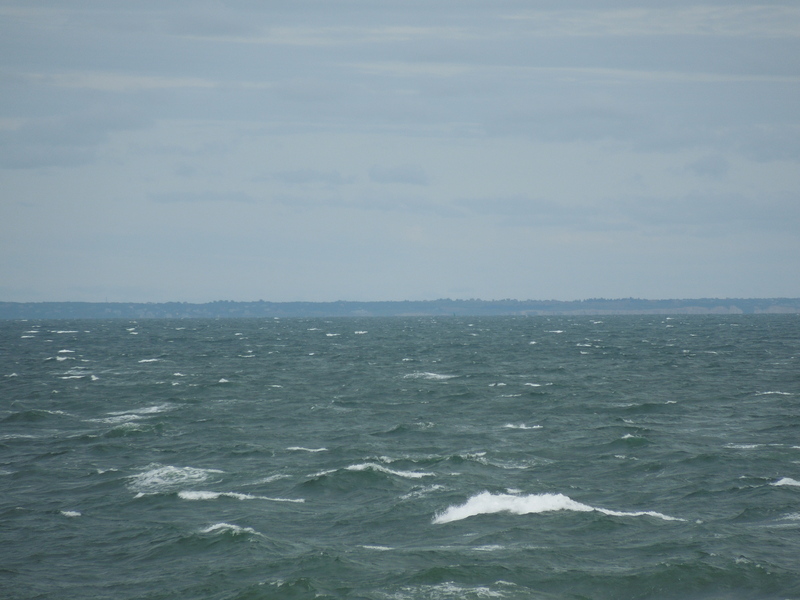 In my most recent posts, I’ve been talking about my trip to the East coast. This week, it’s all about art! 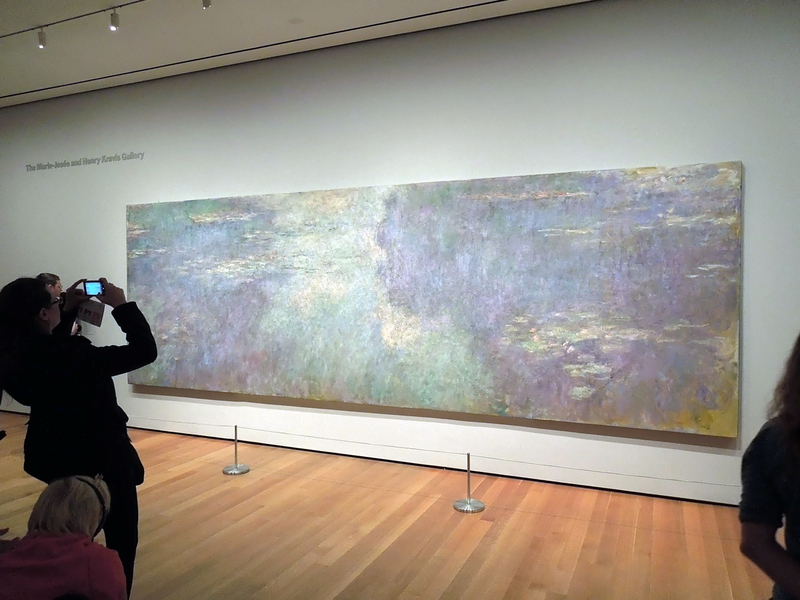 Whenever I’m in New York, I love to try and squeeze in a trip to MOMA (Museum of Modern Art), and this trip was no different. I met up with a couple friends to wander the galleries and see some of my favorite works of art, some well-known and others not so much. 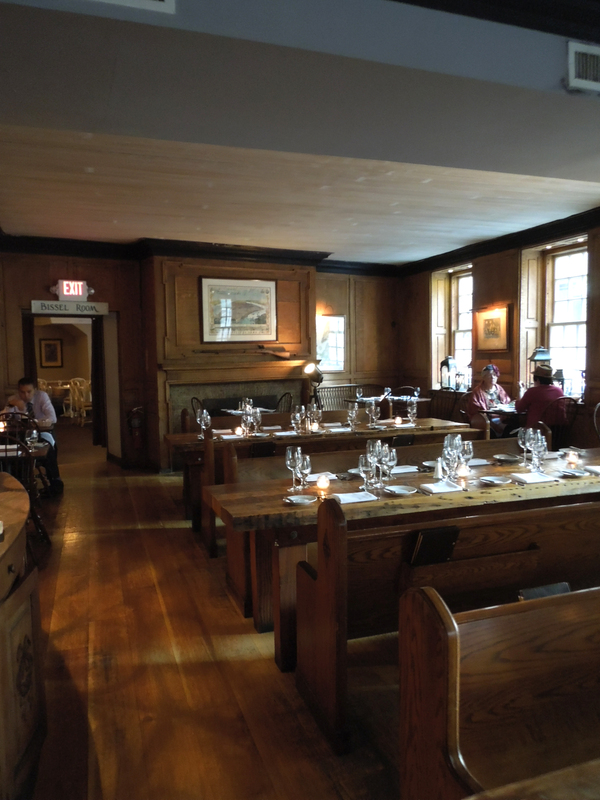 Here are a few of my must-see’s… Although nothing can replace a visit in-person, so consider this a little taste of whats there and encouragement to go see for yourself. 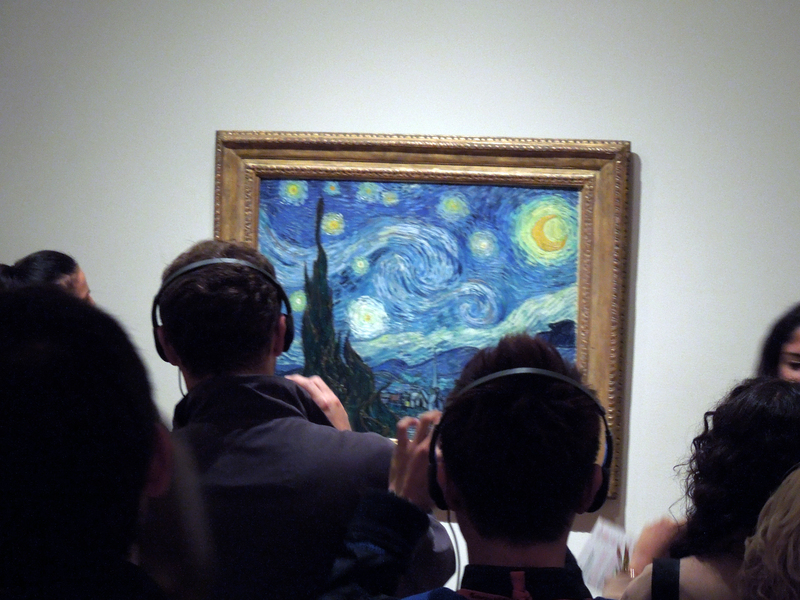 MOMA is filled with plenty of iconic works of art, including van Gogh’s “Starry Night,” which you’ve probably seen printed in just about every art textbook. It’s beautiful in person, and as you can see it was a hit with the crowds. I love the vibrant colors, playful swirls, and the way the tiny brush strokes blend together to create a windy motion that carries through the piece. 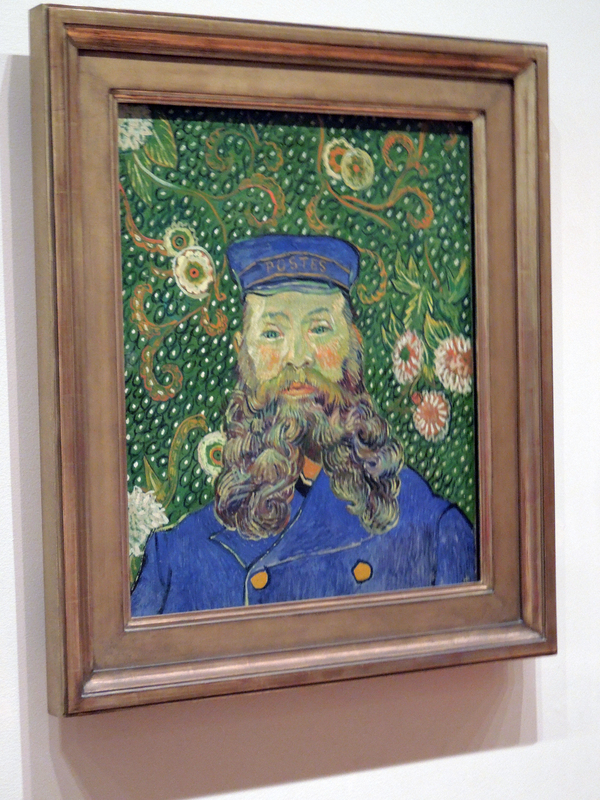 Here van Gogh translates that whimsical style into what could have otherwise been a rather serious portrait. 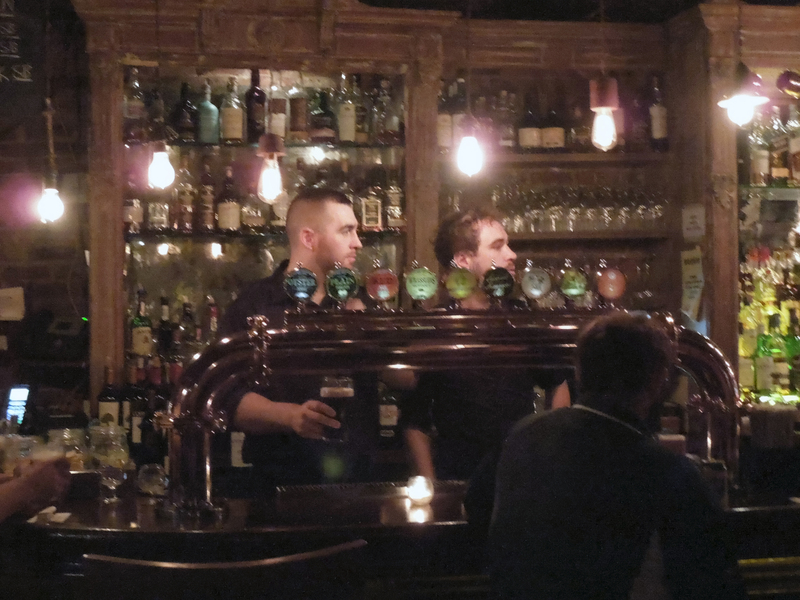 Roulin’s rosy cheeks make him seem alive; it’s as though you could make eye contact with him. Pablo Picasso is arguably one of the most talented of artists. 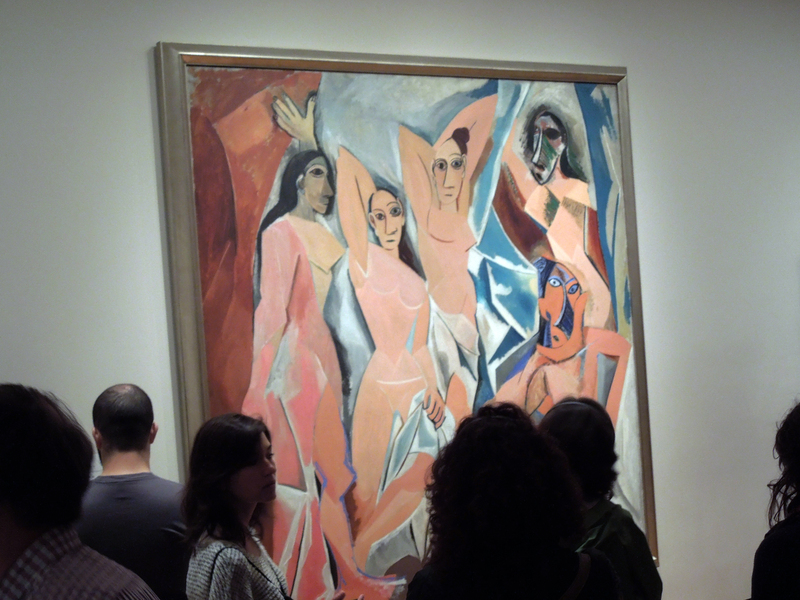 He’s know best for cubism, like you see here, where even the curviest of women’s bodies become sharp and geometric. But he also was an incredible sculptor, sketcher, and of course painter in styles most people may not even recognize as his own. 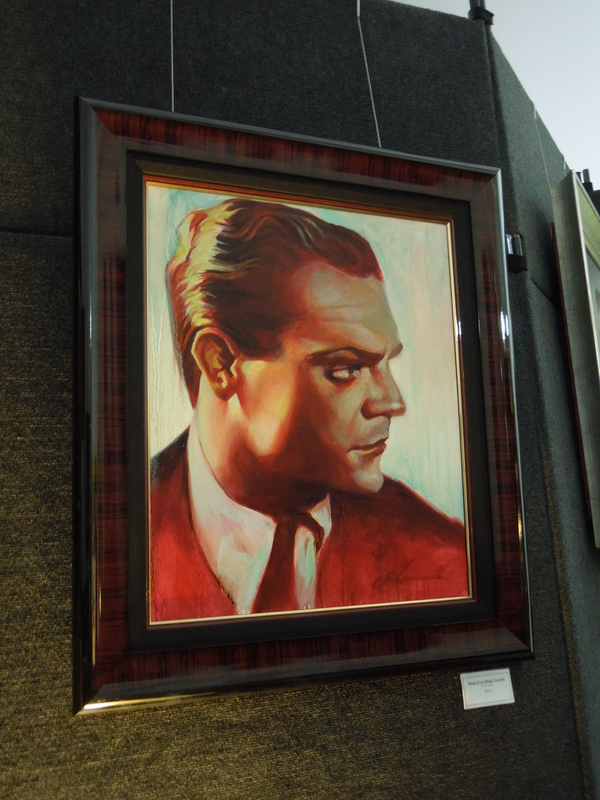 He can do realism just as well as his iconic cubist paintings and sculptures. 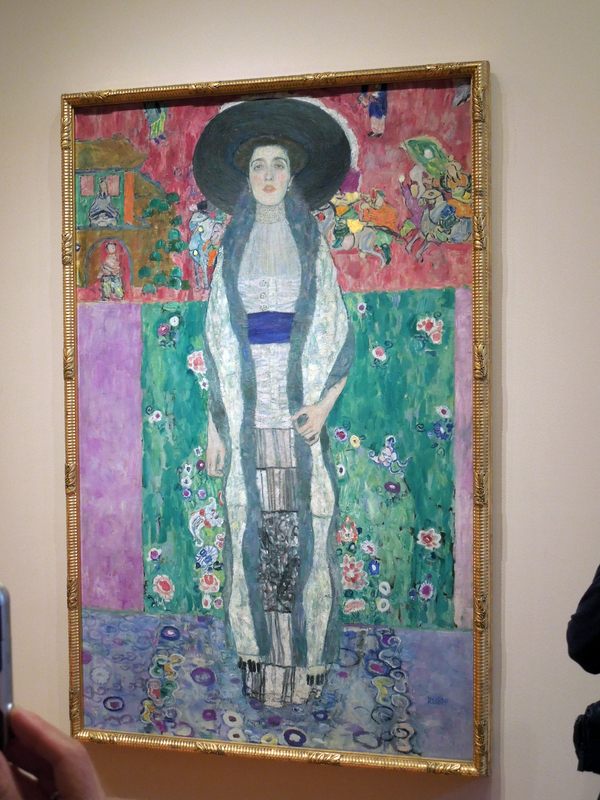 Klimt is an artist whose works I have rarely had the fortune of seeing in person, but they are astonishingly beautiful. 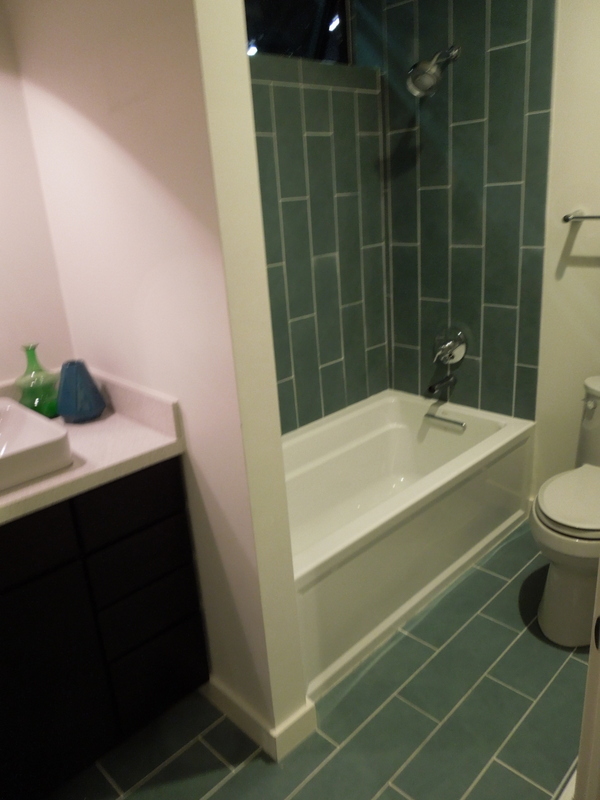 His vibrant, if not eclectic, combinations of colors are eye-catching to say the least. 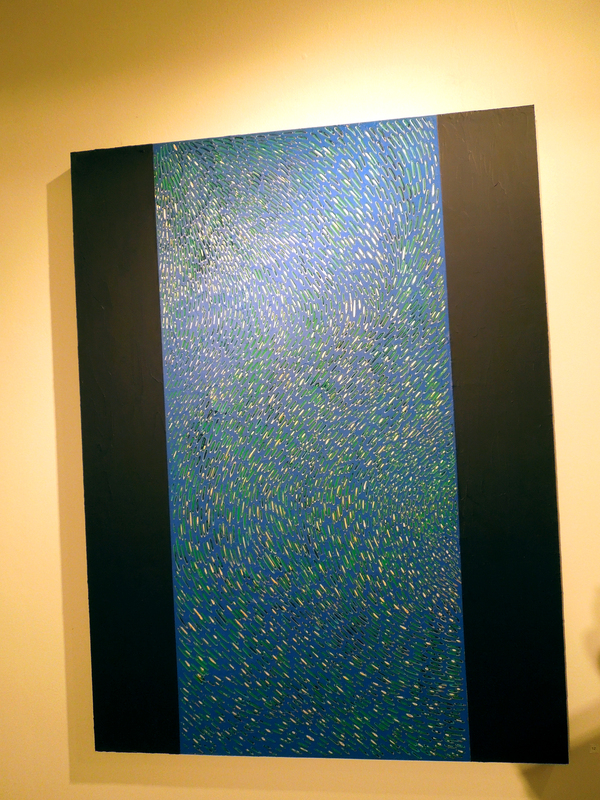 He also tends to incorporate metallic paint, which I have not seen done by anyone else as beautifully. And something about the way he portrays both of these women makes them seem calm, at peace, and almost relaxed. 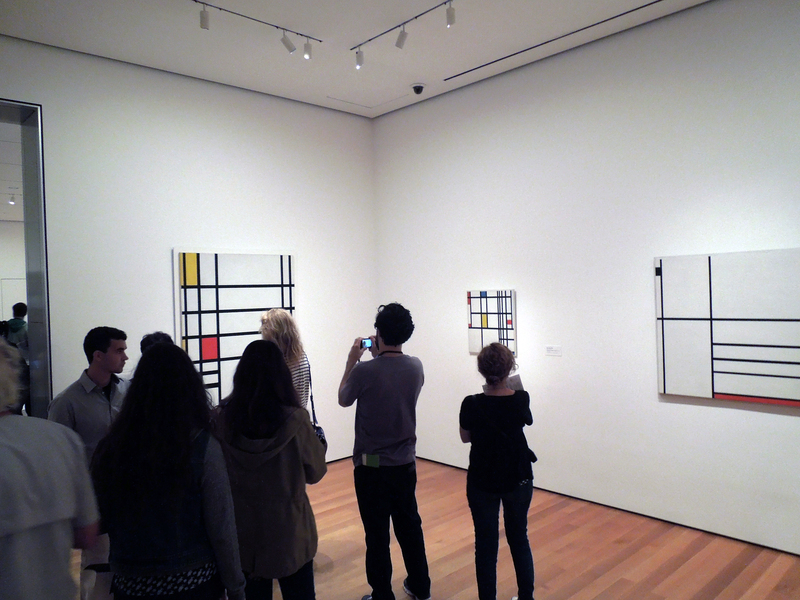 Mondrian’s work is still highly idolized, and I see many things today, from furniture, to artwork, to clothing, derived from his designs. They are simple, reserved, yet intriguing. 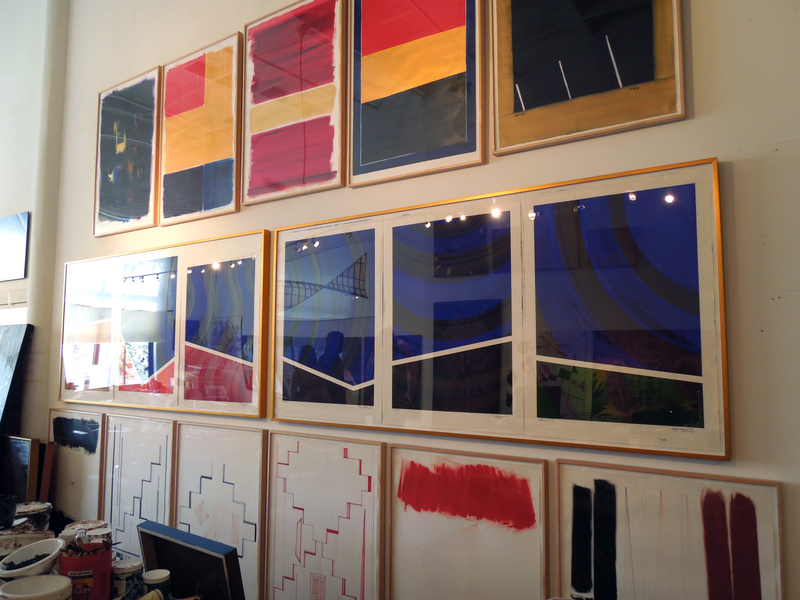 I often feel like looking at his work is like looking through a window to the inner workings of color. 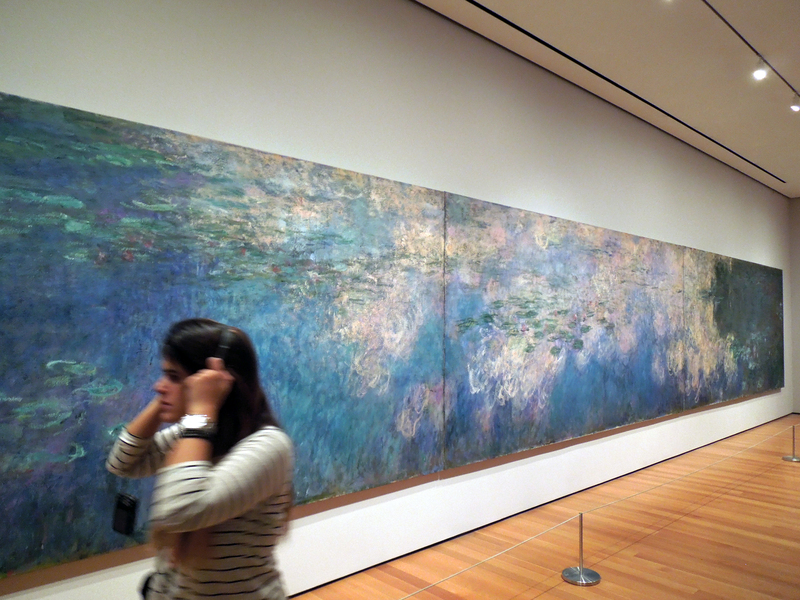 I always enjoy perusing Monet’s works. 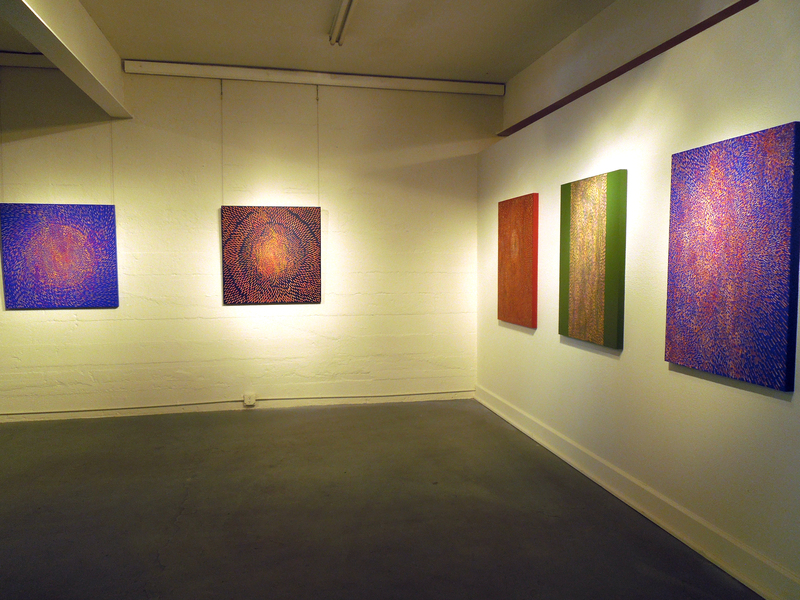 They are soothing and beautiful, and often I wish I could take a nap inside of one of his paintings. He had a tendency to paint the same scenes repeatedly, and so I love seeing his different takes on the same images. Many times you can almost see the progress of his loss of sight in his paintings by comparing an earlier painting to a later one of the same scene. Here you can see a stark difference in the vibrancy and clarity of one of his “Water Lilies” to the next. 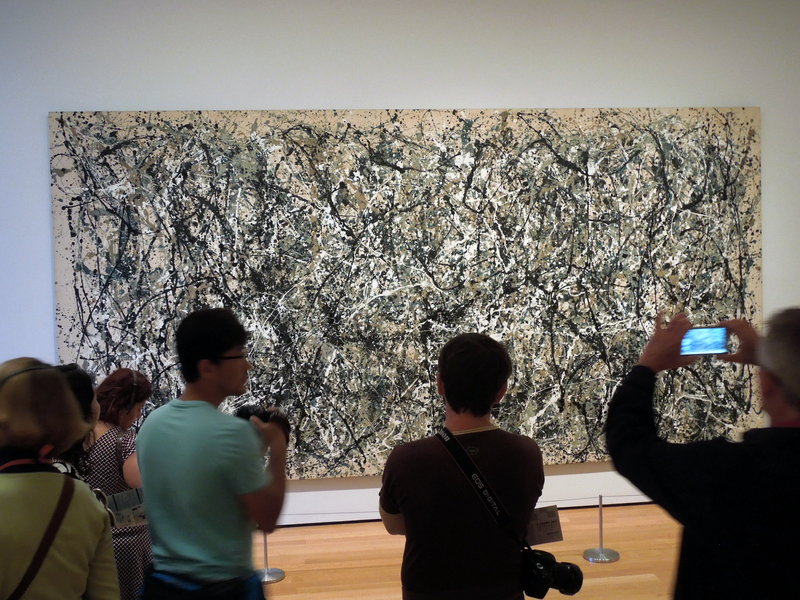 I always love looking at Jackson Pollock’s work as well. It’s truly unique; nothing else ever looks quite like a true Pollock. And when you get up close, the drips and streams seem to go over and under each other, creating a maze of paint trails. 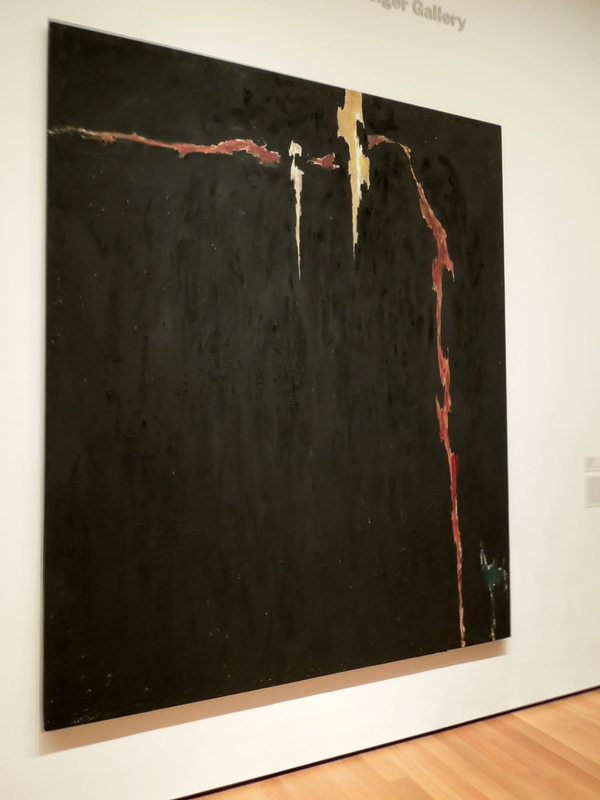 This painting always grabs my attention when I visit MOMA, although its hard to articulate exactly why. There’s a gorgeous, impenetrable depth to the blackness in this painting, and the lighting-like colors seem to be peeking through the darkness. 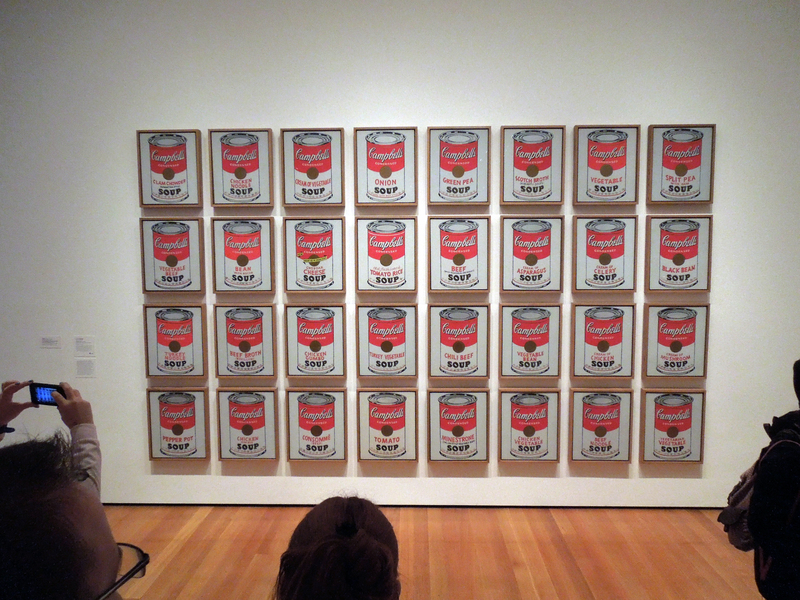 An iconic work of pop art, you must take a moment to look at Warhol’s soup cans. We see them duplicated everywhere even still, and so maybe his comment on the manufacturization of art is still being heard. A Hollywood icon is the subject of this image. 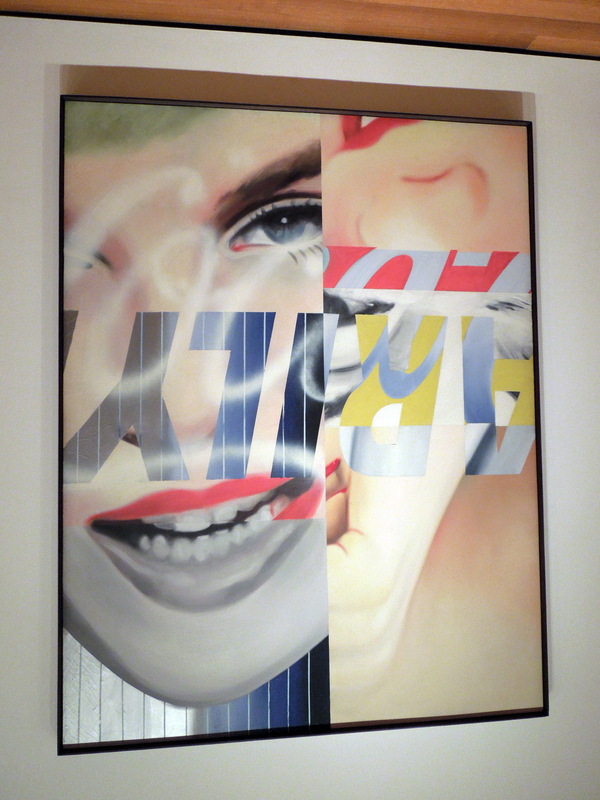 In a way, she herself became pop art through the pop art of others. 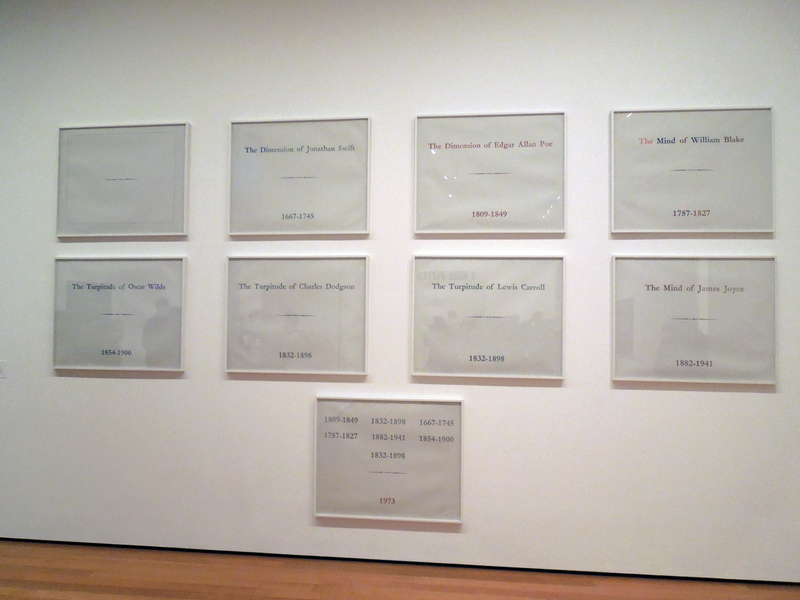 I found this series by Broodthaers to be playful and a little cheeky. 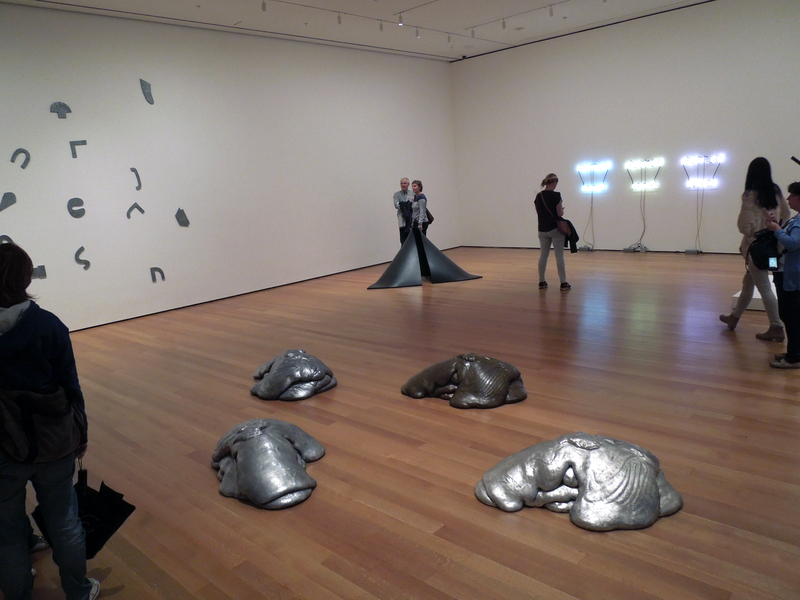 This room in MOMA was super fun to wander through. One of the great things about modern sculpture is that much of it is meant to be experienced and questioned. There was a special exhibit of design and architecture while I was there, which of course I had to spend a little time in! I always love to see the originals of pieces still being sold today. Even though this table is familiar to us now, I like to try to put myself in the shoes of someone seeing it for the first time. 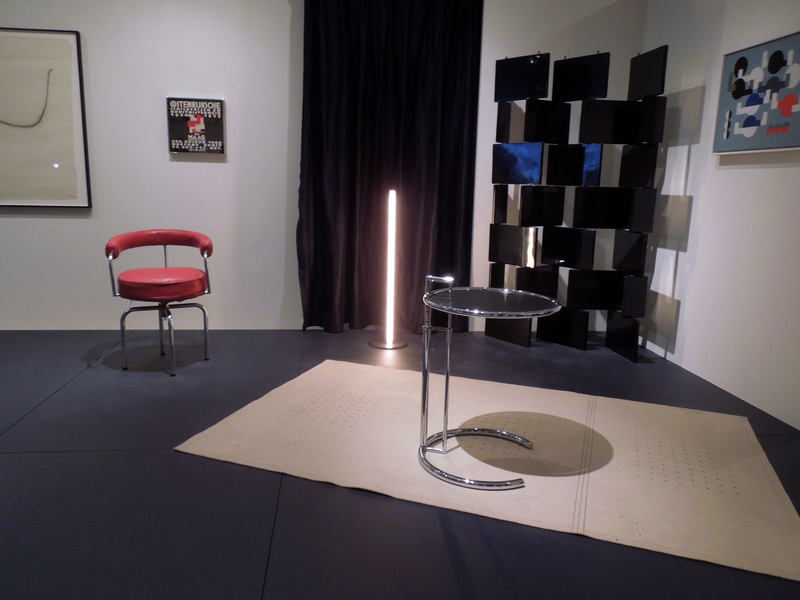 And since Knoll Textiles are alive and well today, I enjoyed getting a little taste of what they were like in the 40’s. 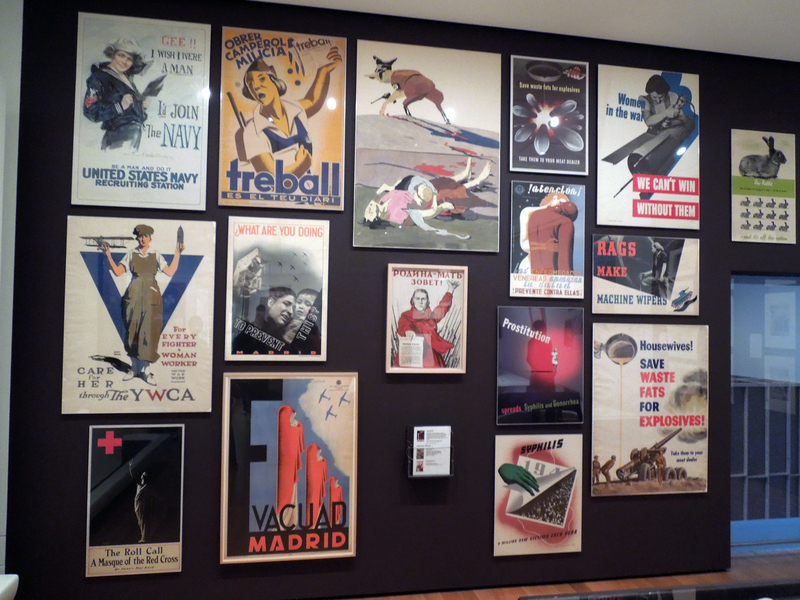 I found these war propaganda posters incredibly interesting, if not a little funny. Oh, how far we’ve come! 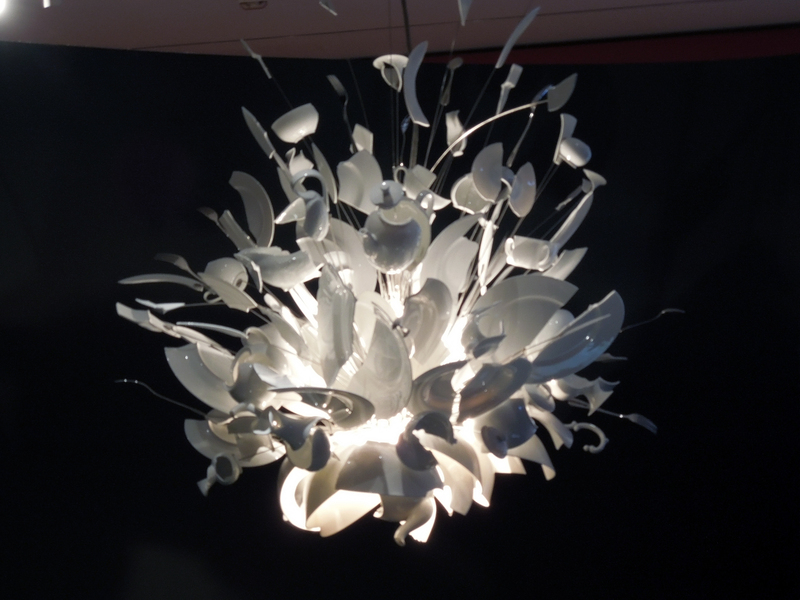 I wish I could remember who was the artist responsible for this chandelier. It truly looks like the cacophony of broken pieces was frozen mid-explosion. 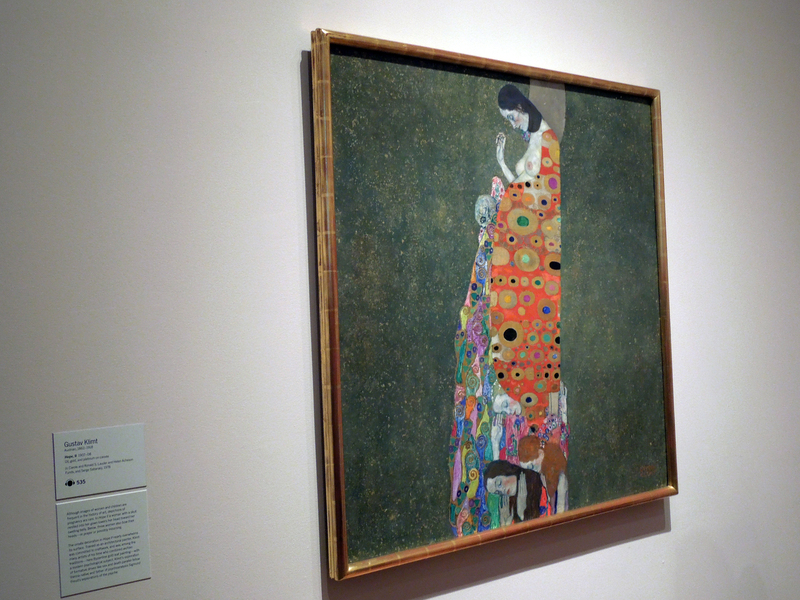 Do you have a favorite modern artist or work of art? Who/what is it? As you may know, I recently finished a pretty intense design program. I’ve been loving my new found freedom! So what’s the first thing I did with it, you might ask? Well, I jumped straight onto a plane for an epic vacation on the other side of the country. First order of business: girls weekend with some high school friends. It was too quick, but we had a fantastic time together, catching up and just enjoying each others company. Since we’d visited New York City together in the past, we decided to mix it up this time around and spend a day in the Hamptons. 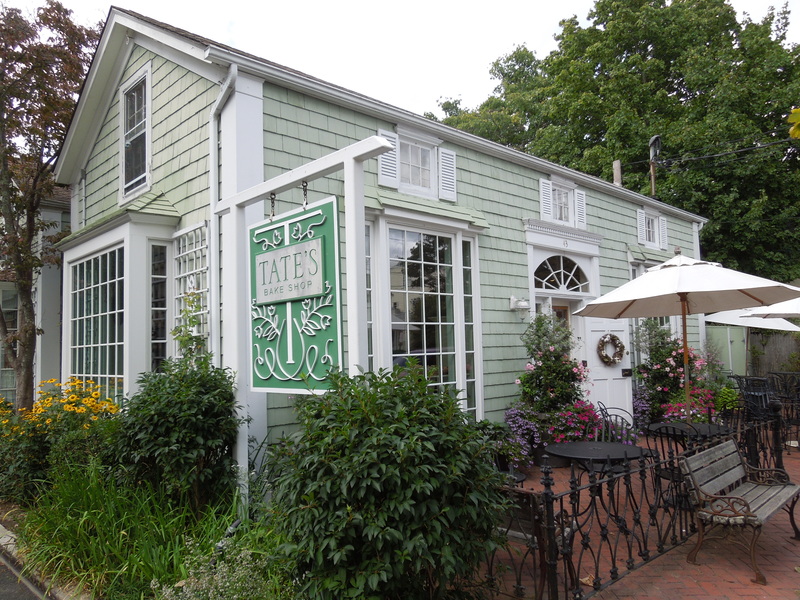 First stop: Tate’s Bake Shop in Southampton, for the most delicious baked goods! My favorite was the cookie dough cupcake. 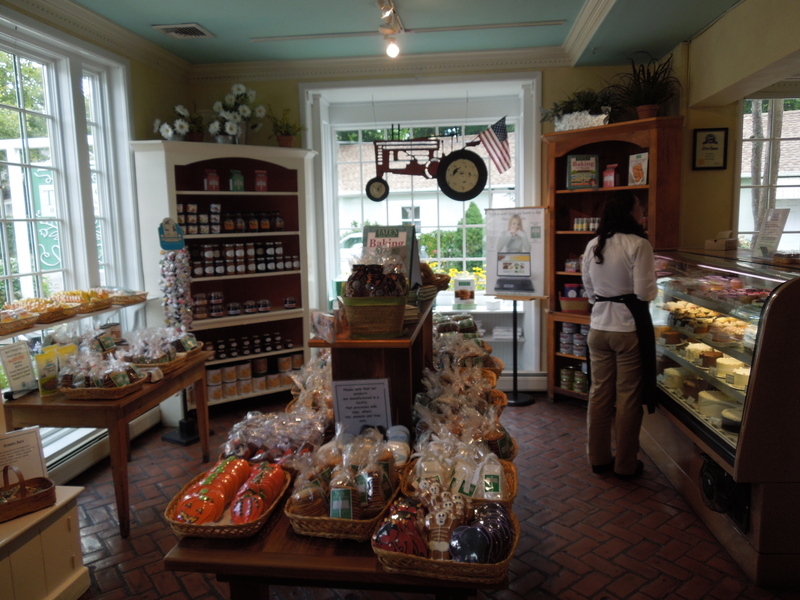 And the setting for such a bake shop was just adorable, in what surely used to be someone’s house long ago. It was easy to feel right at home. 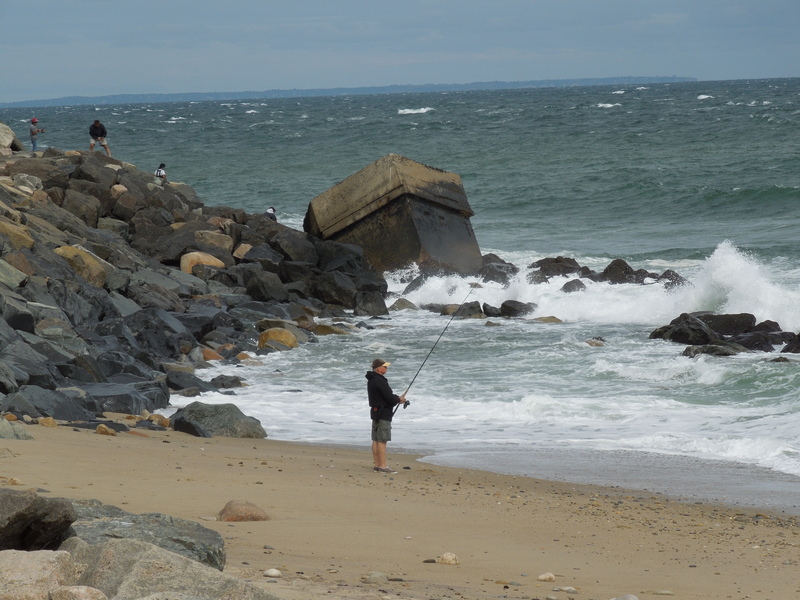 Of course we made time for a quick walk on one of the windy beaches. 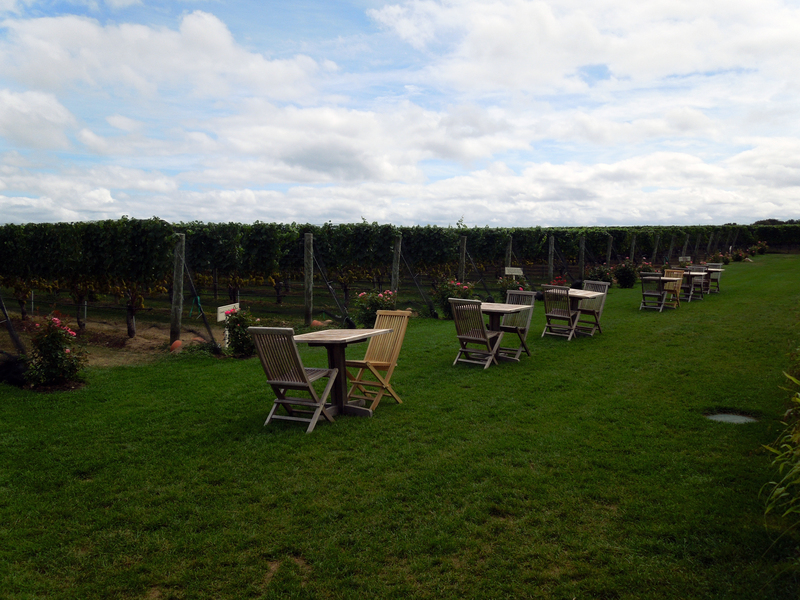 Before lunch, we stopped at Wolffer Estate winery in Sagaponack for some wine and girl-chat time. What a beautiful setting to be with friends! 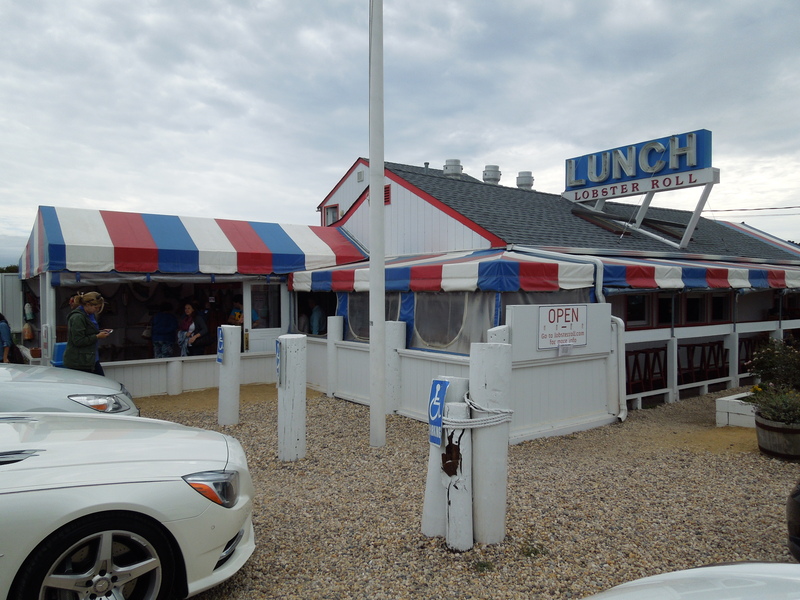 Lunch was sea food at a Hamptons icon in Amagansett, where they happily boasted the names of all the celebrities who have lunched there. 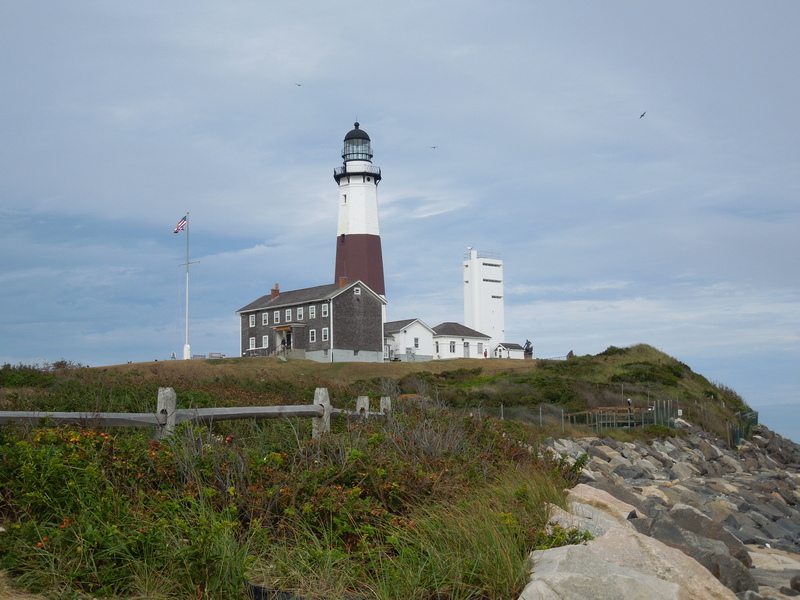 Next we made our way all the way up to the top of the Island and took a walk on the ocean around the Montauk Point Lighthouse. 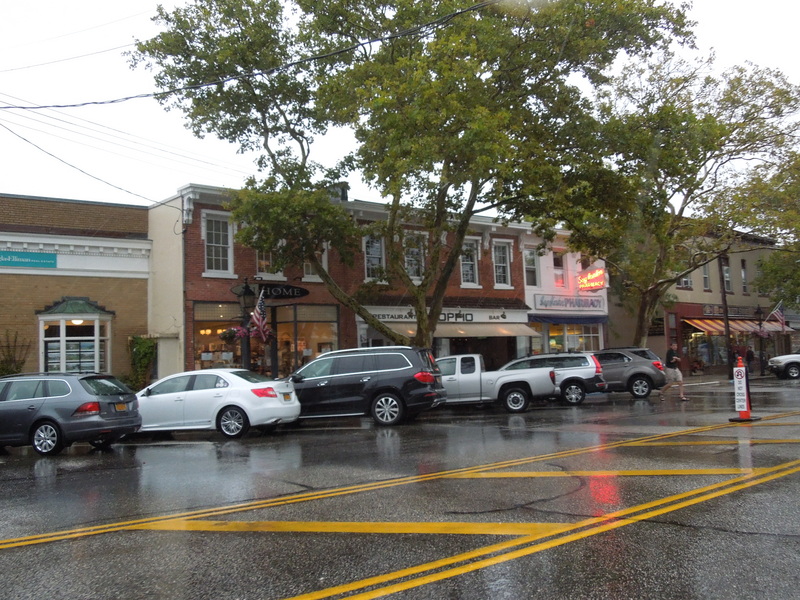 While we were in Amagansett, I couldn’t resist urging the girls to pull over for a little shopping. 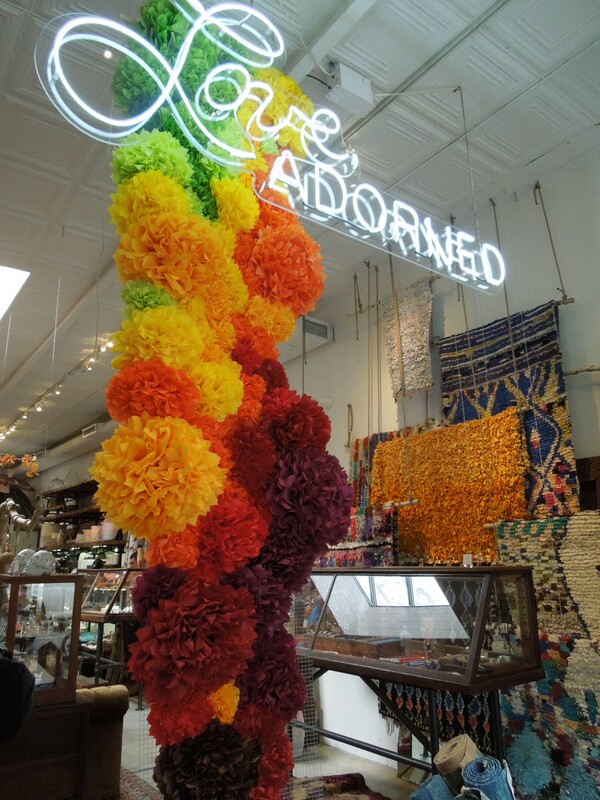 Love Adorned is one of my favorite shops in SoHo, so I had to see what their Hamptons location was like! 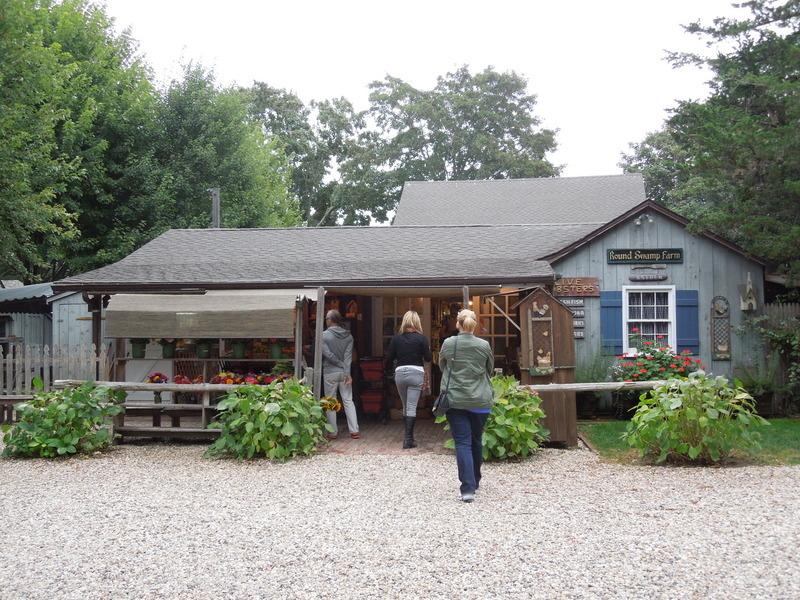 I’m always up for a good farm stand, and the Round Swamp Farm country market in East Hampton was above and beyond. I would do most of my grocery shopping here if I lived nearby. 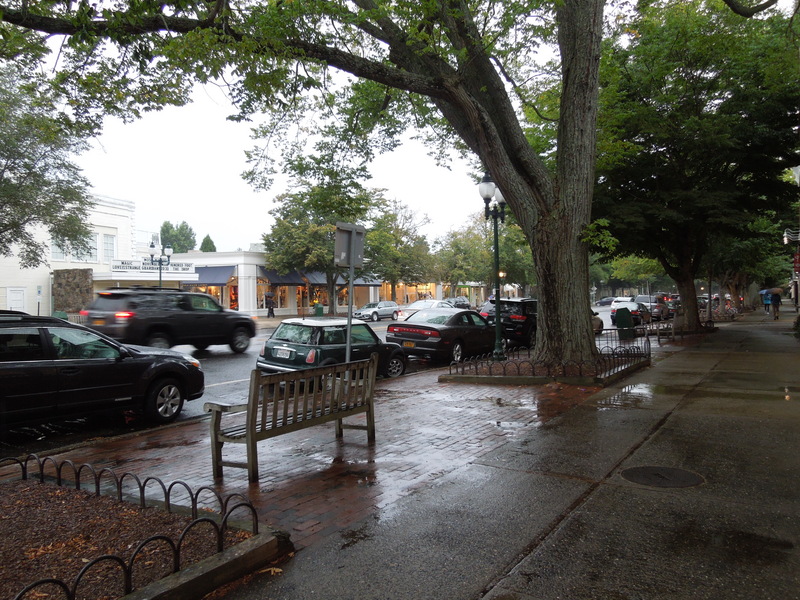 Since we weren’t quite hungry for dinner yet (having just stuffed ourselves with lobster rolls, fried clams, and chowder) and it was beginning to rain, we did a little more browsing and shopping in East Hampton. 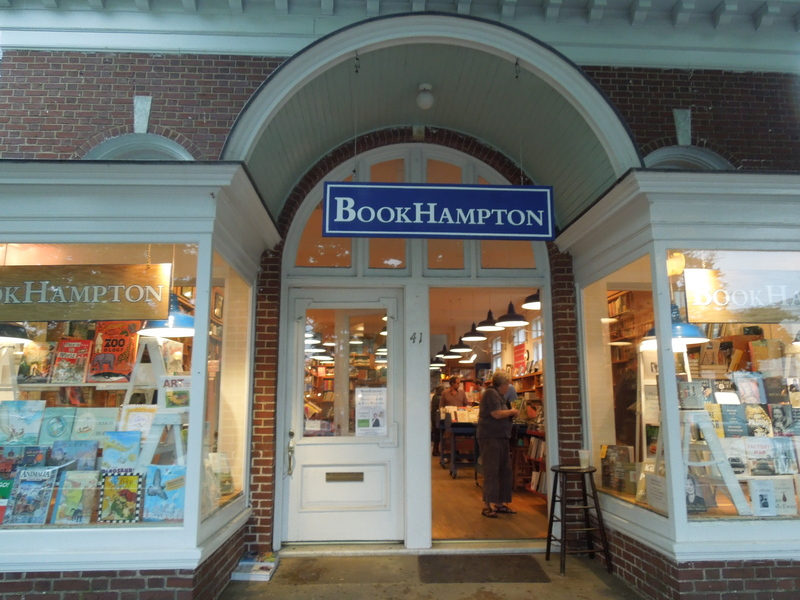 I loved Book Hampton. 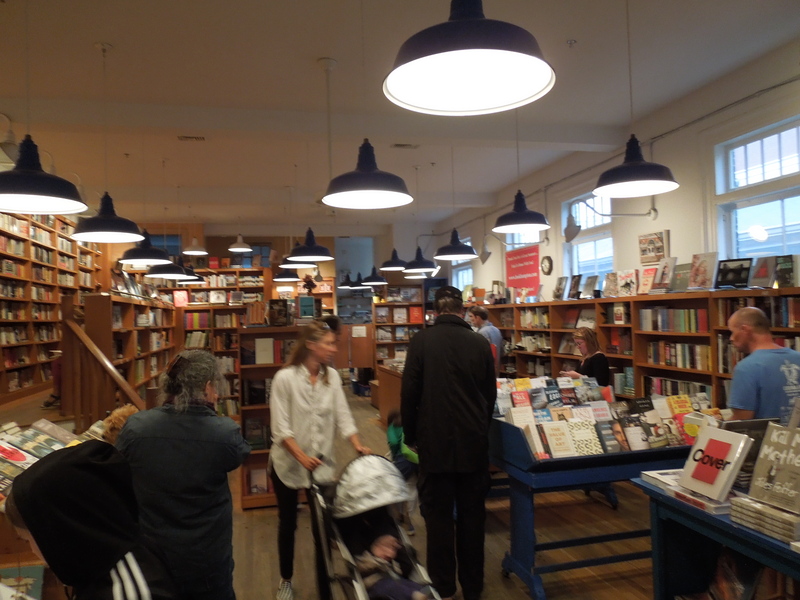 It was comfortable, cozy, and was the kind of book shop you could take your time in, especially on a rainy day like it was. 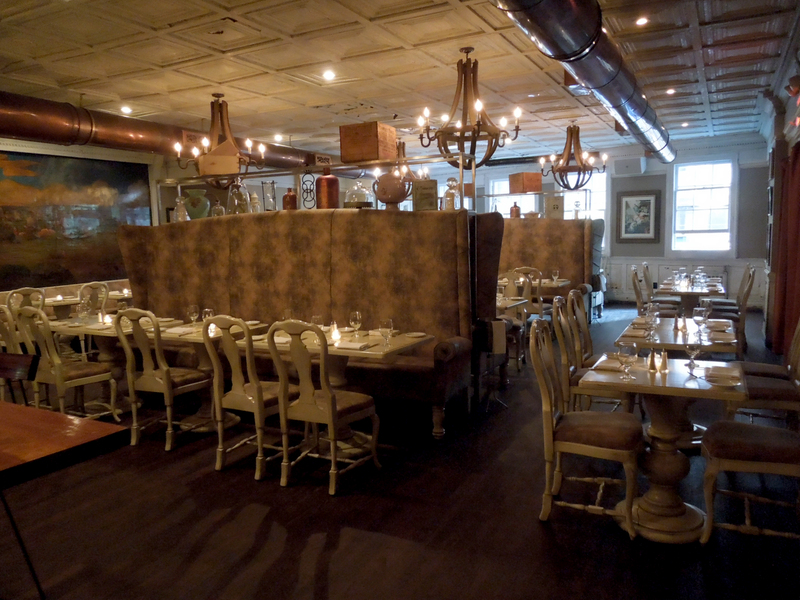 And finally, we ended our day with drinks and The American Hotel followed by an incredibly delicious dinner at Tutto Il Giorno in Sag Harbor. 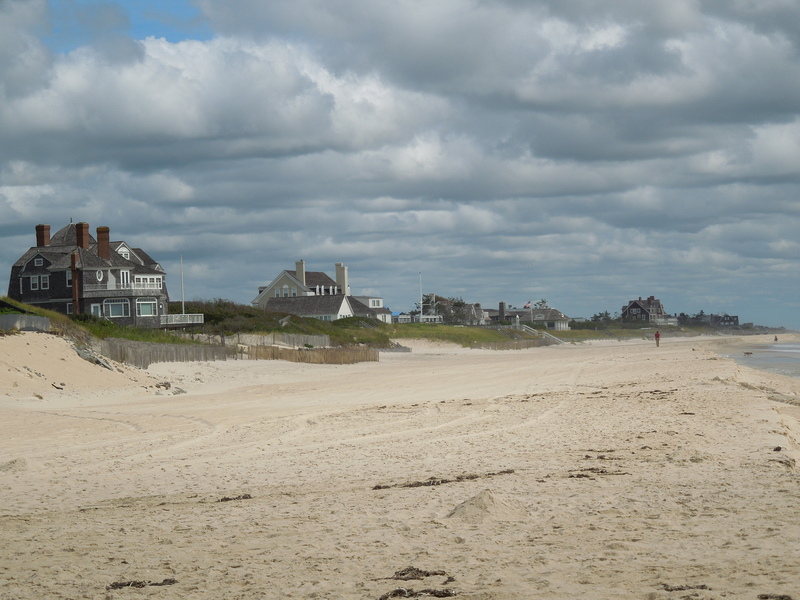 What a wonderful, leisurely day it was wandering through the Hamptons with great friends and my new found homework-less freedom! 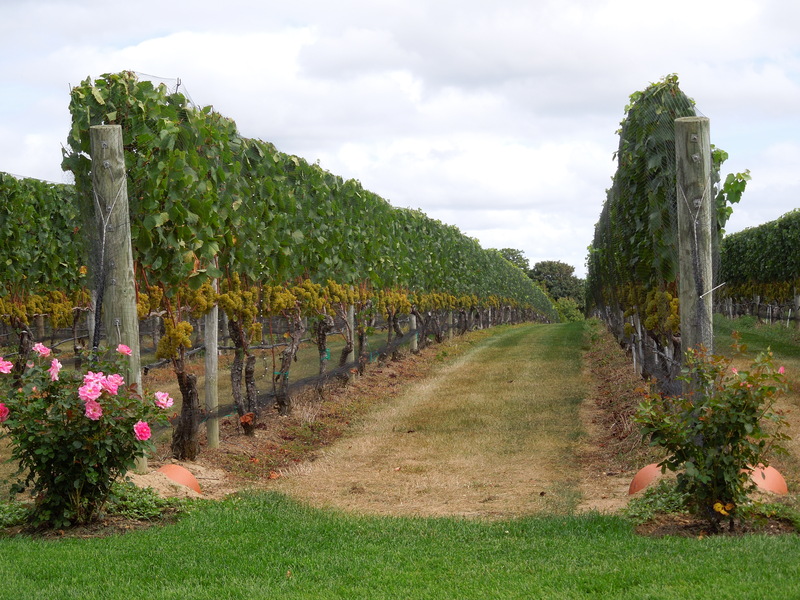 Have you been to the Hamptons? What is your favorite spot there? 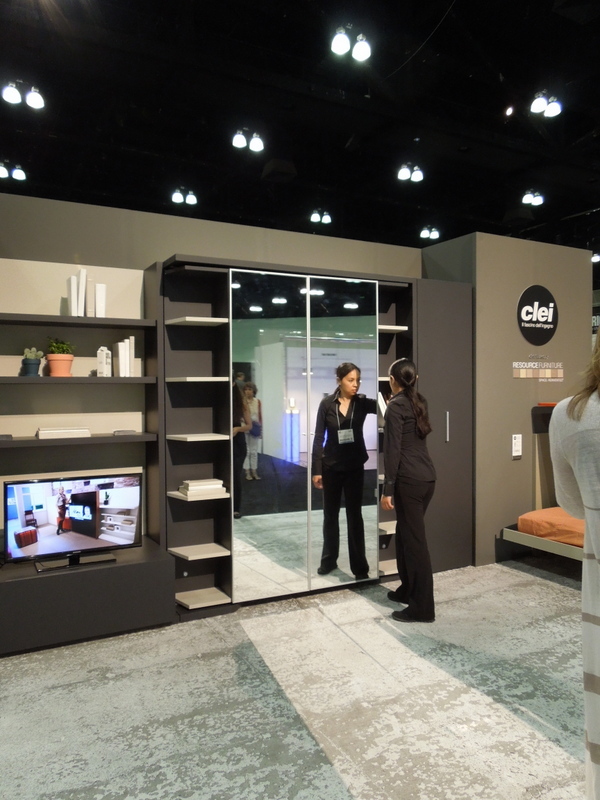 Last weekend, Dwell was in town at the LA Convention Center, showing off the latest in home decor trends. I’ve been meaning to see this show for several years, and somehow there’s always something unexpected that gets in the way. 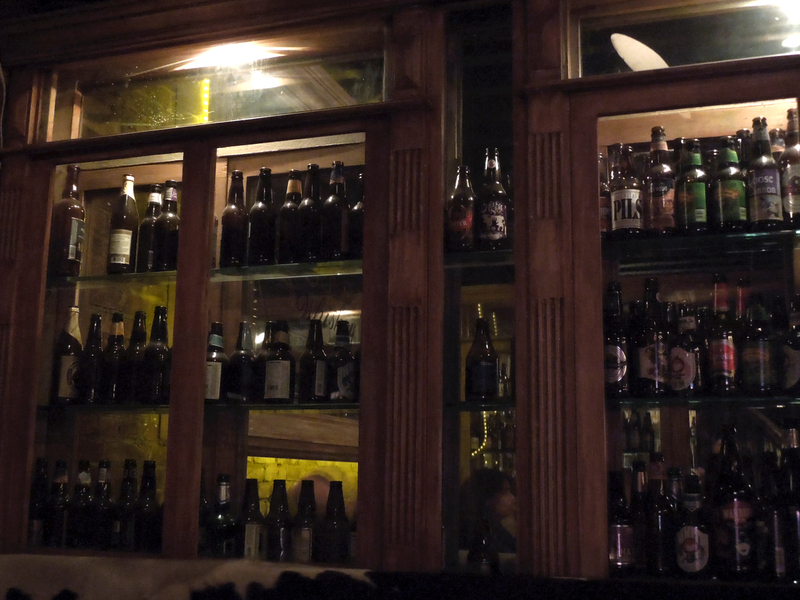 Well this year, I was lucky enough to finally make it there with a coworker… a little work research, so to speak. 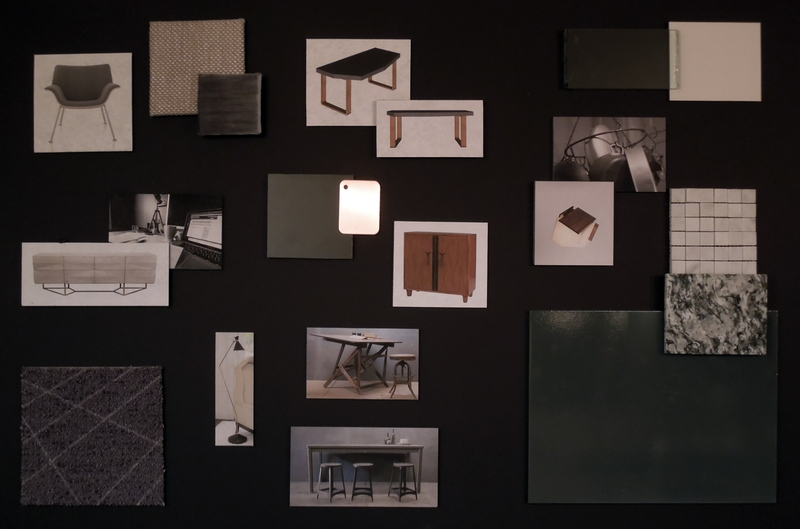 Here are a few of my favorite things from the show. This was one of the first booths we saw there, VIT. 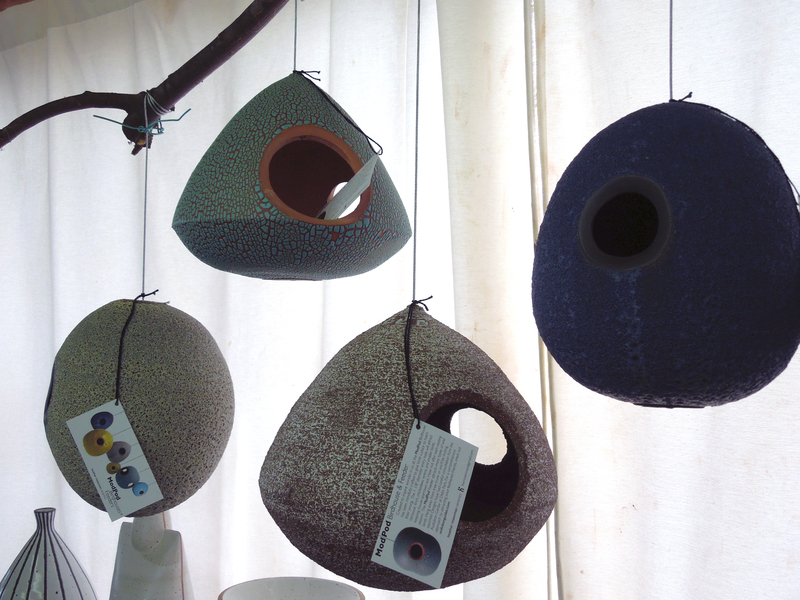 I just love the colorful modern glazed finish on such organic shapes. 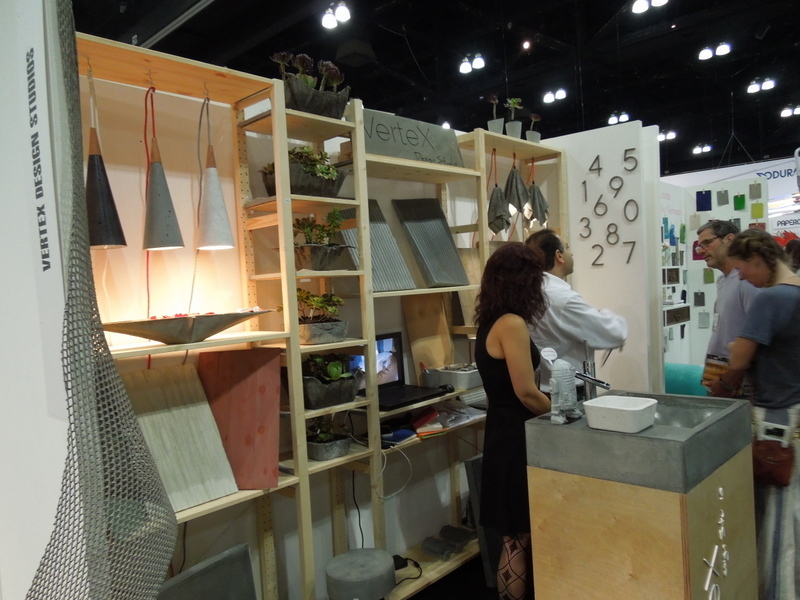 Vertex Design Studios had some fantastic concrete-made decor. 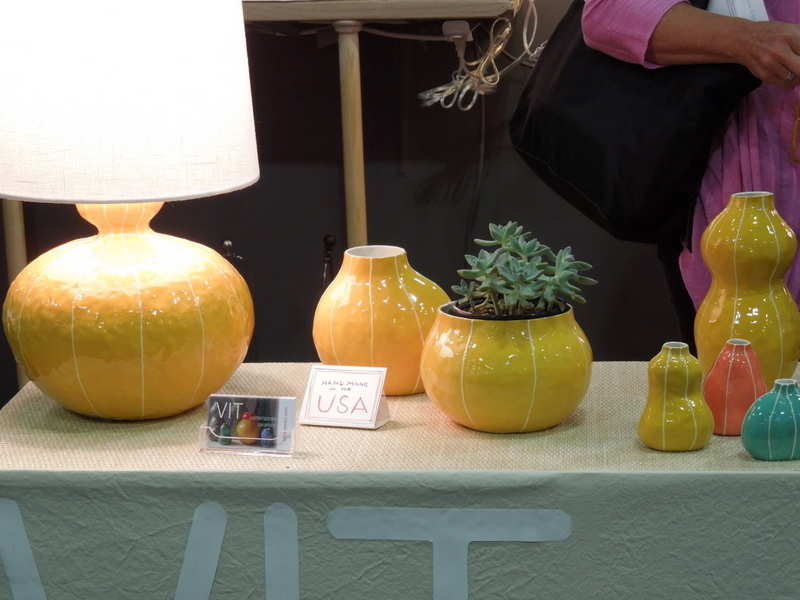 These pendant lights were my favorite! 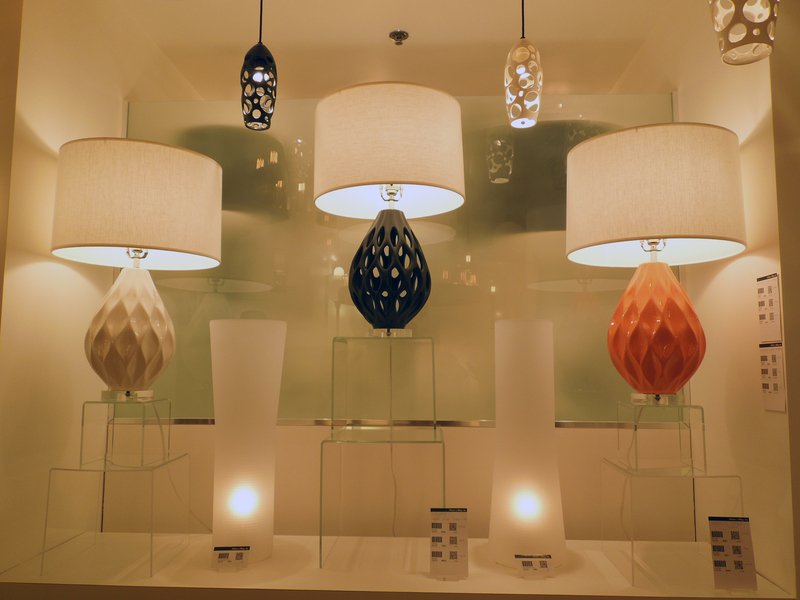 Cerno is a local company that designs and manufactures lights. 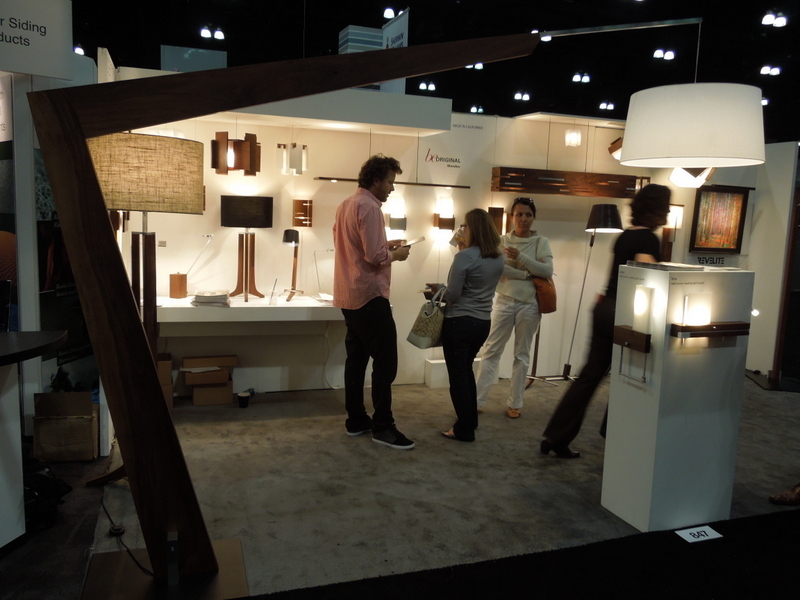 I just loved their use of wood, and take a look at this incredible large-scale cantilevered lamp in the foreground. I love its angles, and it was big enough to just walk right under! 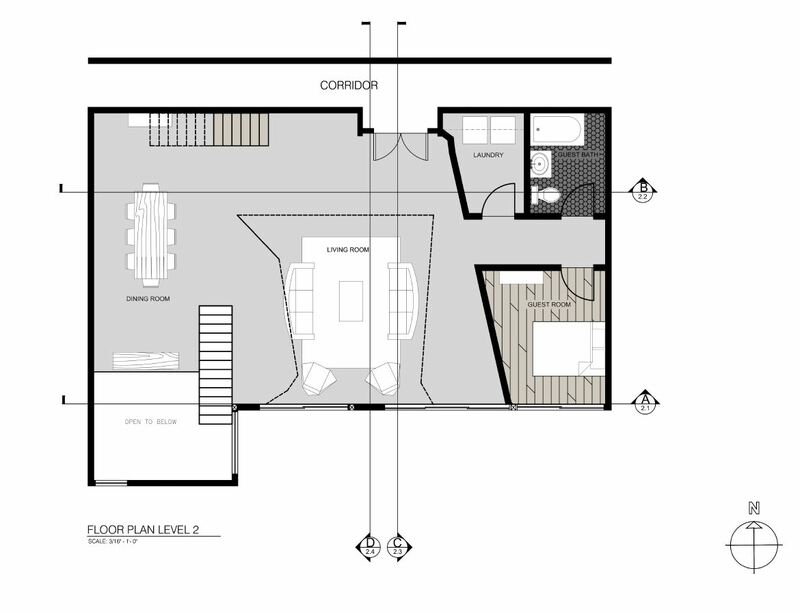 Being an interior designer on a student budget can be frustrating sometimes, so I’m always super excited to find low-budget good-design ideas. 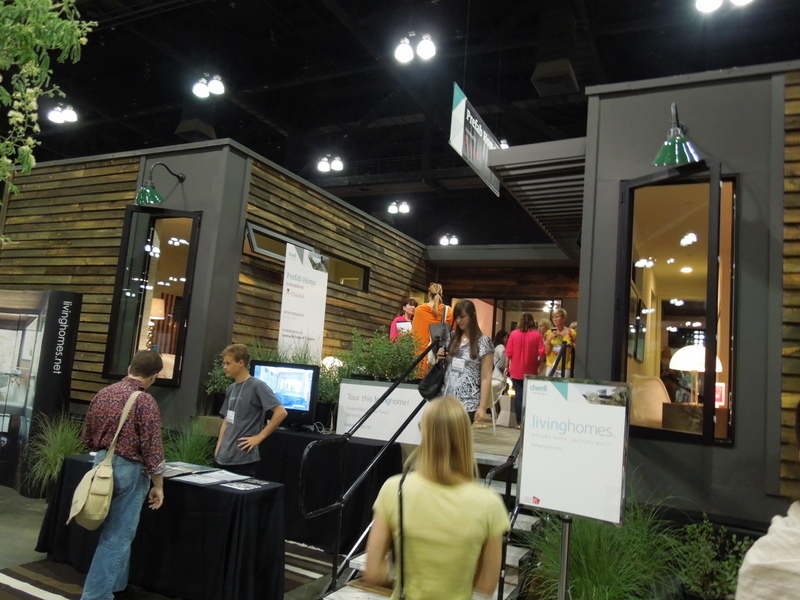 There were two booths there that got me excited for low-budget design solutions. The first was Stikwood. Stikwood is a wood plank product with a sticky back, so you can literally peel and stick the stuff to whatever your heart desires! 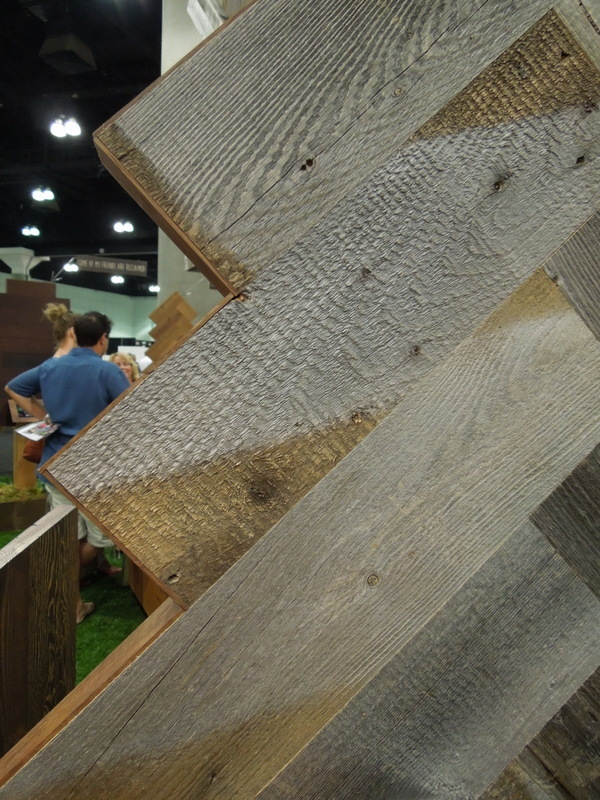 I think it wood be fantastic for a wall-covering or ceiling treatment. You could also use it as a make-shift headboard, or even stick it to the face of some simple Ikea furniture pieces. 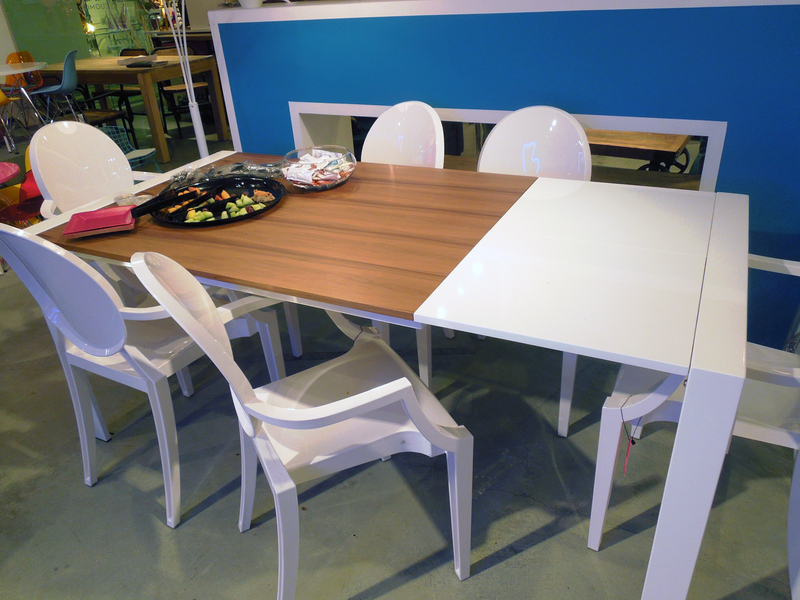 And speaking of Ikea, this company has a brilliant Ikea-hack business model. 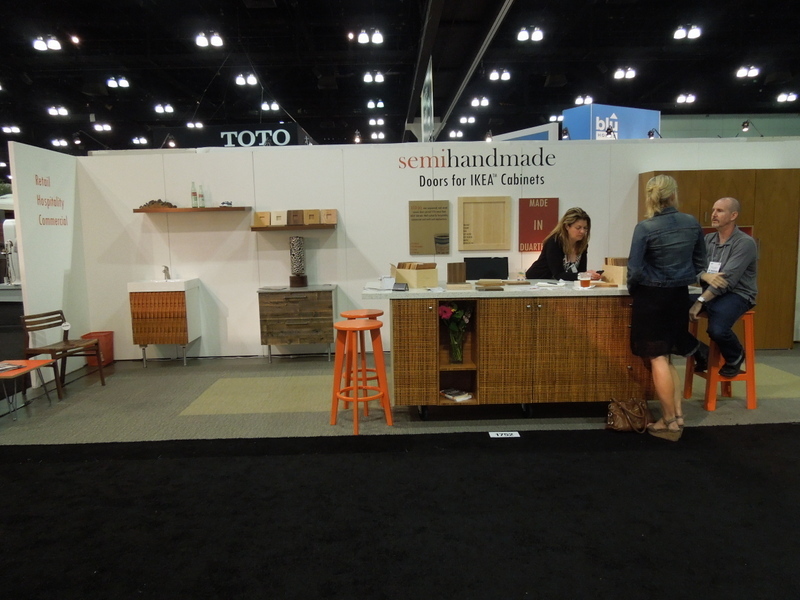 Semihandmade makes doors for Ikea cabinets. 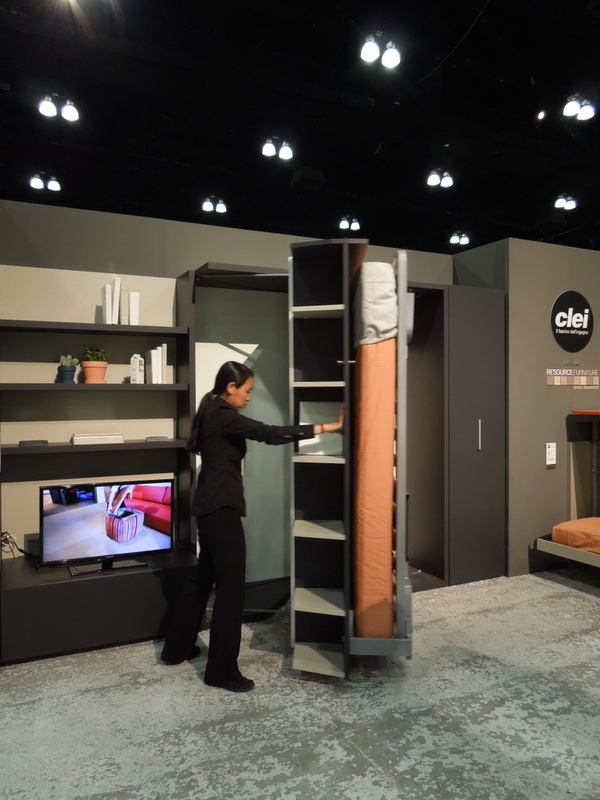 From the looks of it they are only a little it more expensive than Ikea doors, but significantly more aesthetically pleasing. 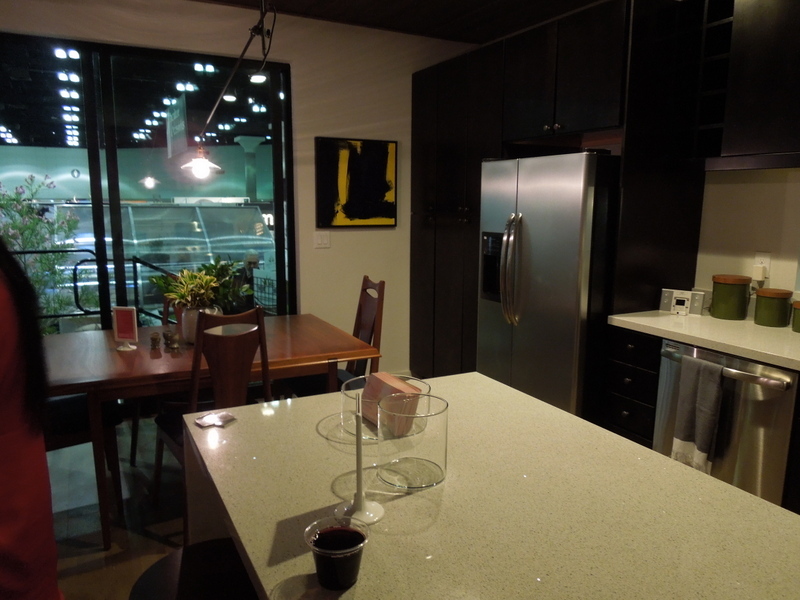 Here’s your chance to have unique kitchen cabinet facing on an Ikea budget. 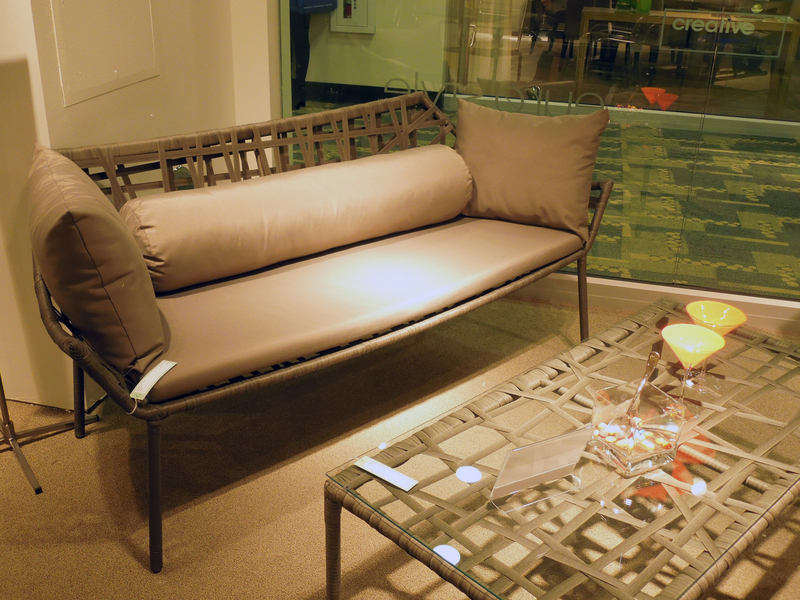 I’ve been falling increasingly in love with Loll outdoor furniture, so I was happy to take a look at their line in person. 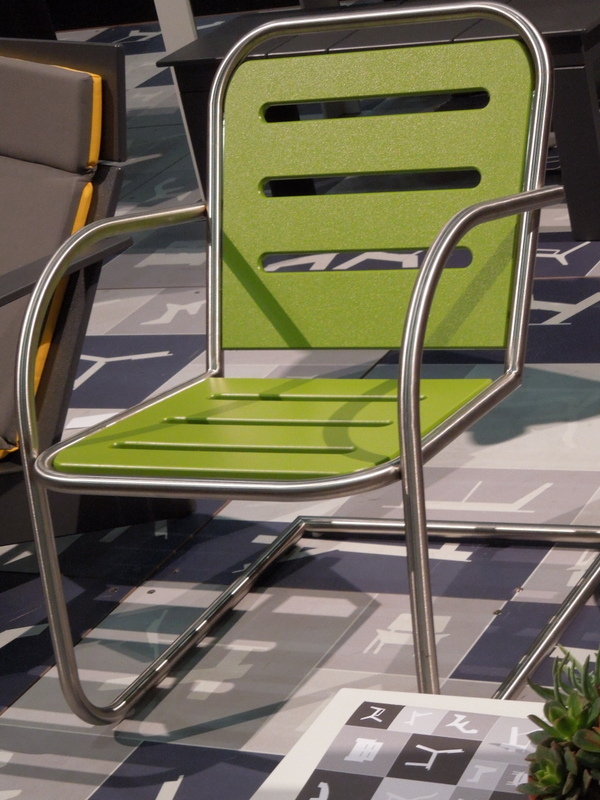 They make durable outdoor furniture out of recycled plastic. This display totally tickled my fancy. 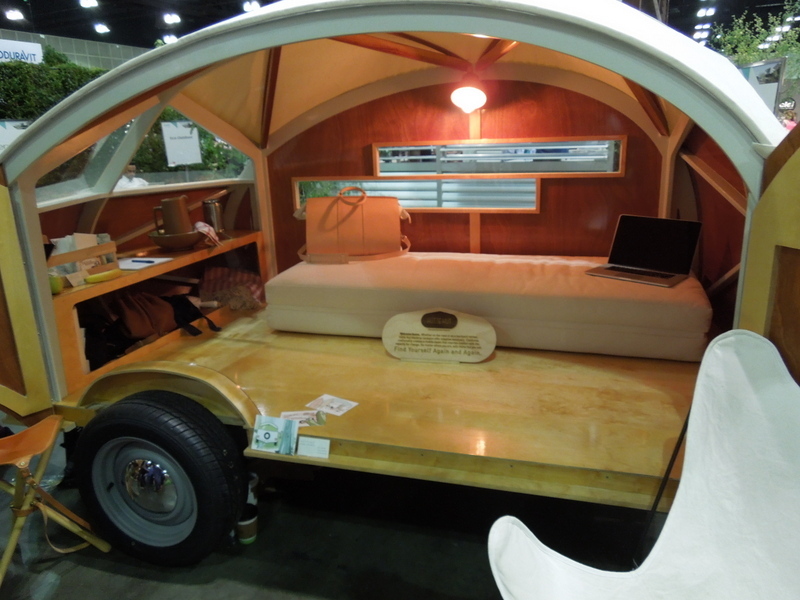 Wouldn’t you just love to go camping with this!? 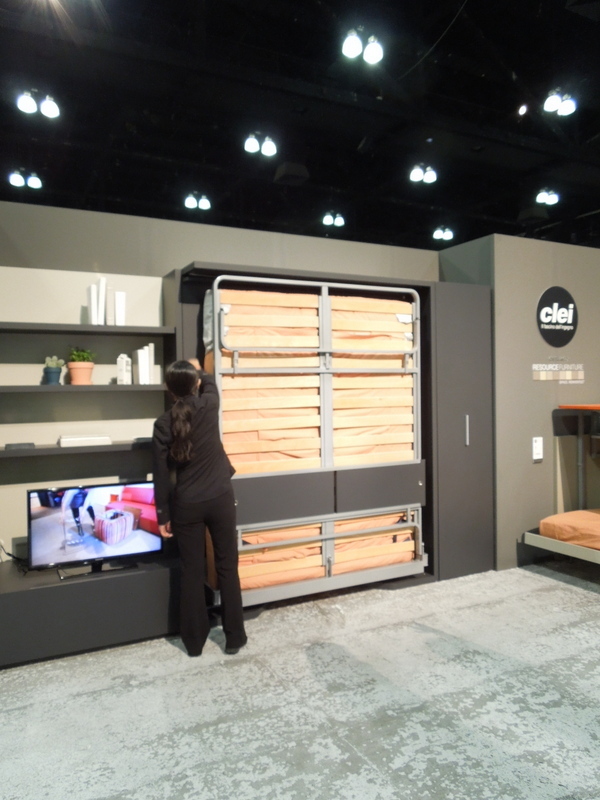 Clei had several great small-space solutions: everything from your standard murphy bed to desks that fold down into beds. 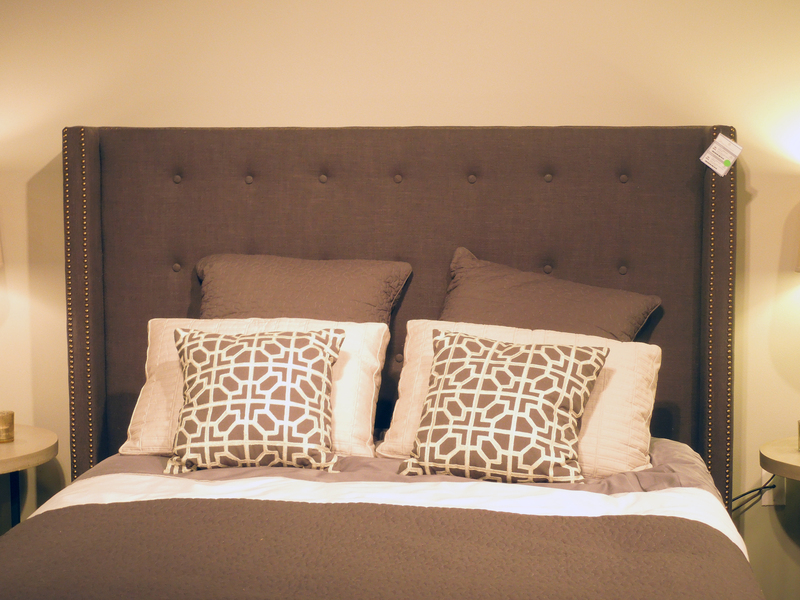 This queen size bed was fun to see transformed into more storage space. 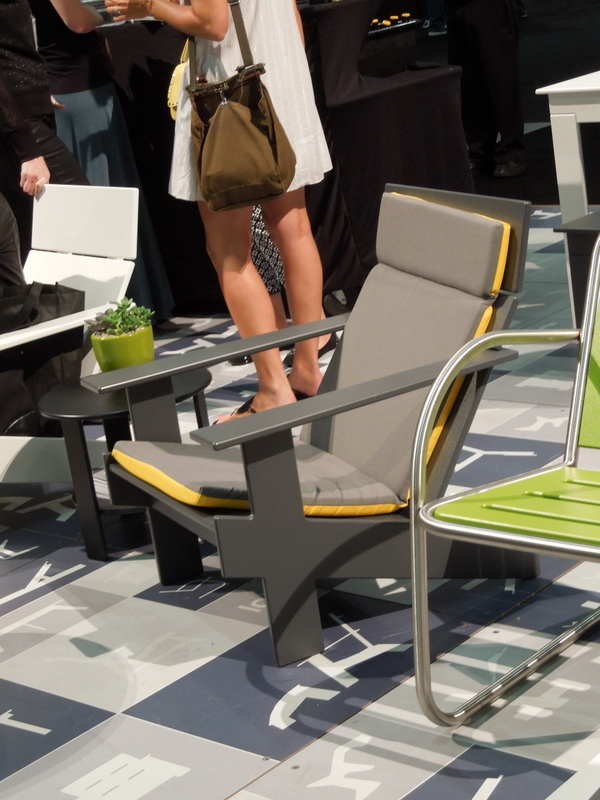 I thought this chair by Sitskie looked like such a cool design, but I didn’t fully understand until I sat down on it. 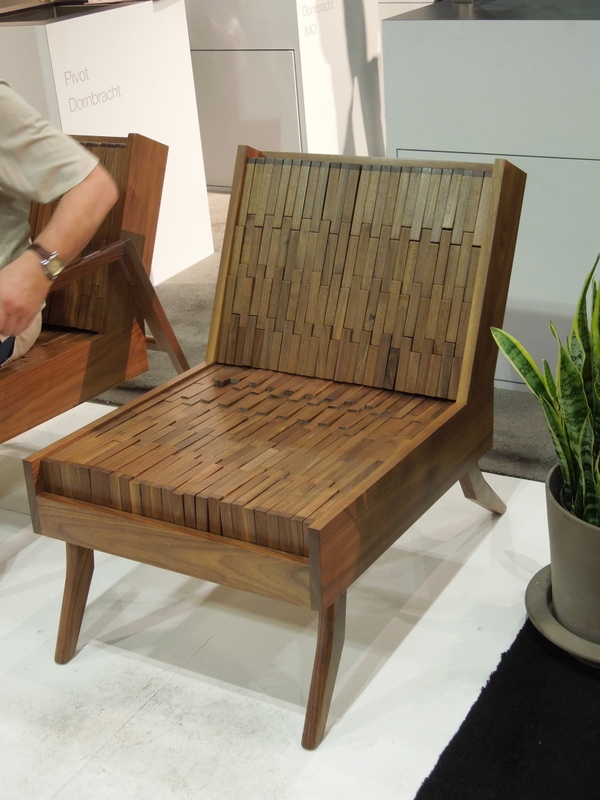 Each little piece of wood you see here moves, allowing the chair to form to your body. 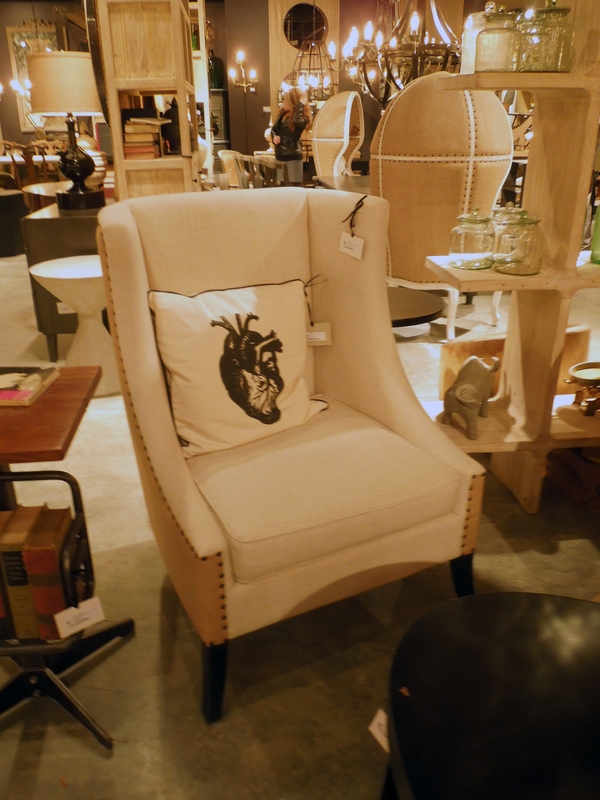 I have never sat in a wooden chair so comfortable as this one! 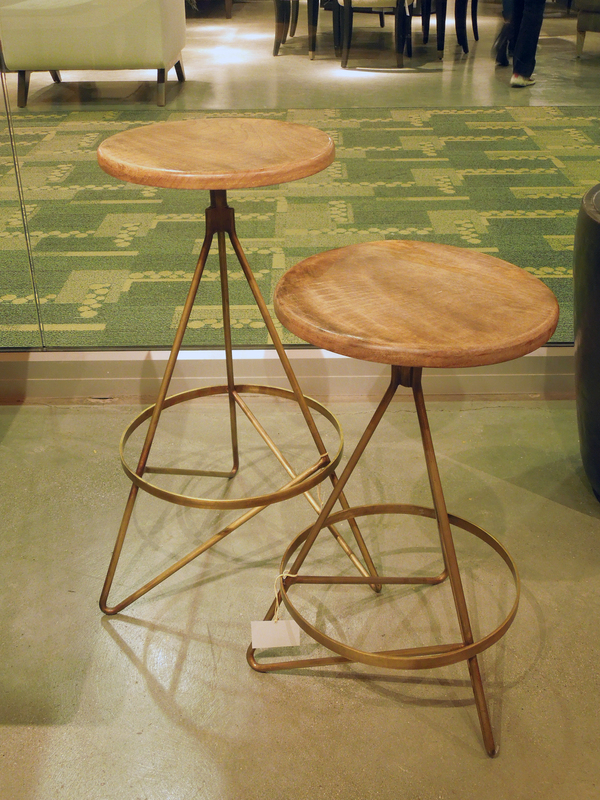 These side tables from Karabachian Design are modern and simple, but the dip-died legs make the piece. I always love a surprise pop of color. 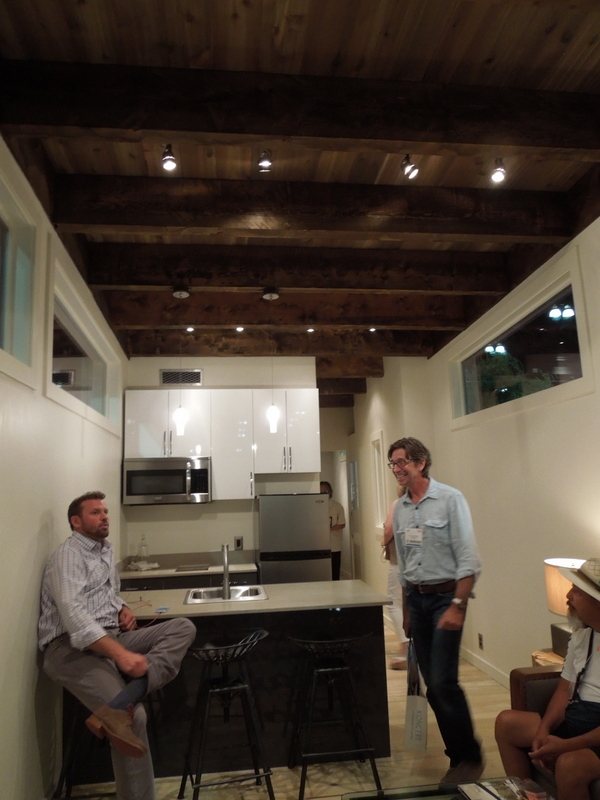 There were a variety of modular and pre-fab homes on display there, which I was most excited to explore. 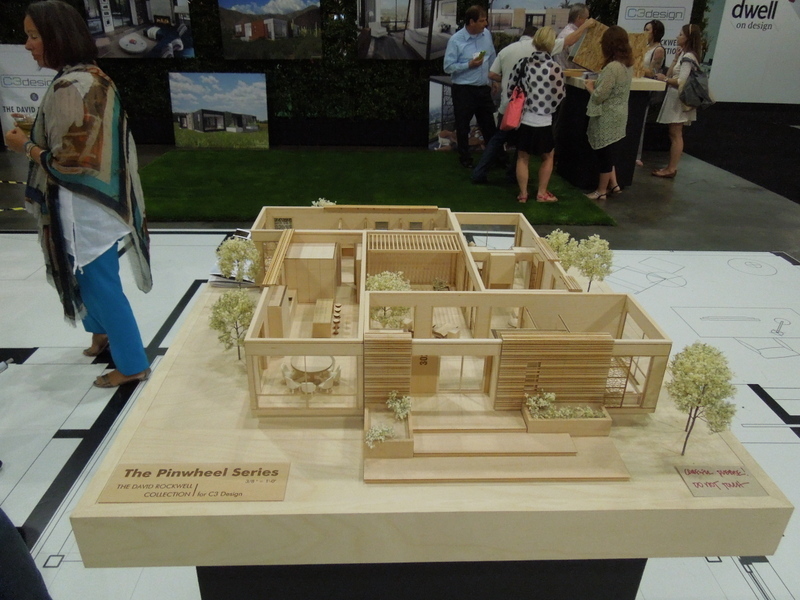 I’ve been hearing a lot about some of the really cool architecture and design that’s happening in pre-fab homes so I loved seeing them in person. 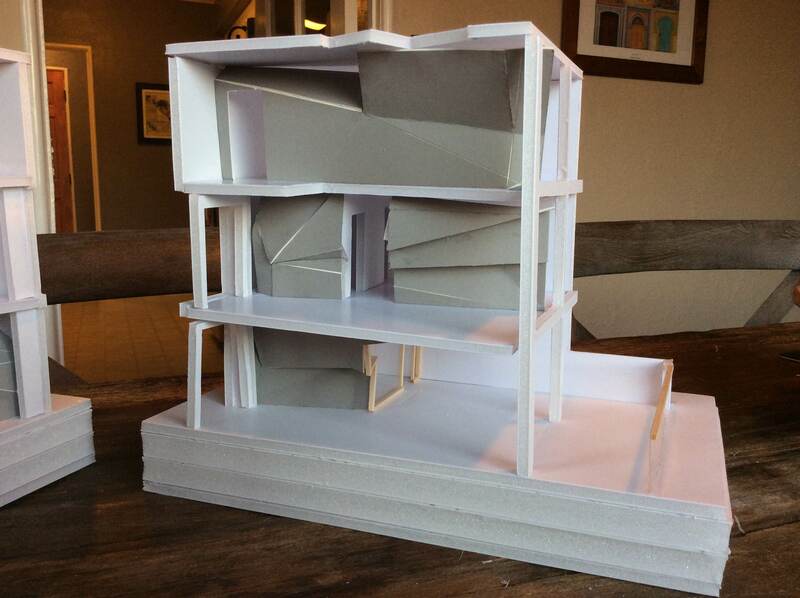 This is a scale model of a modular home called the Pinwheel series. 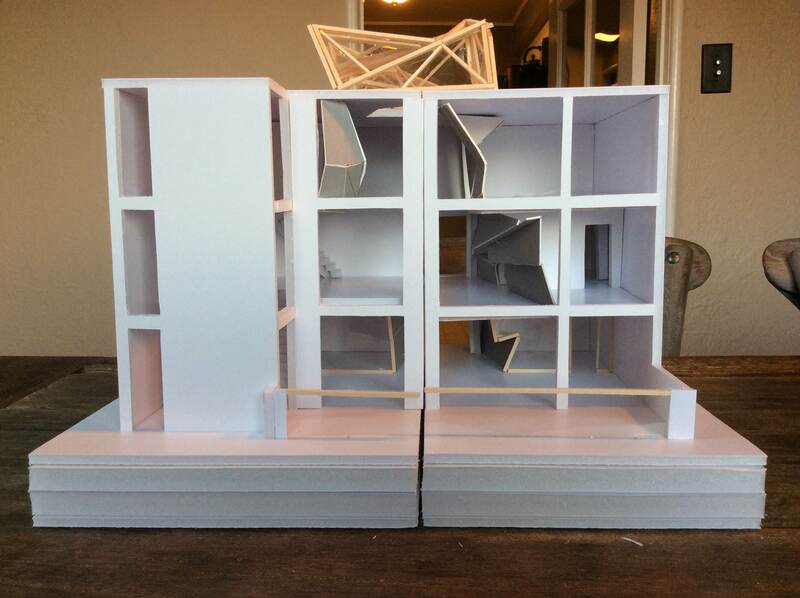 This was an incredibly elaborate, perfectly hand-crafted model. 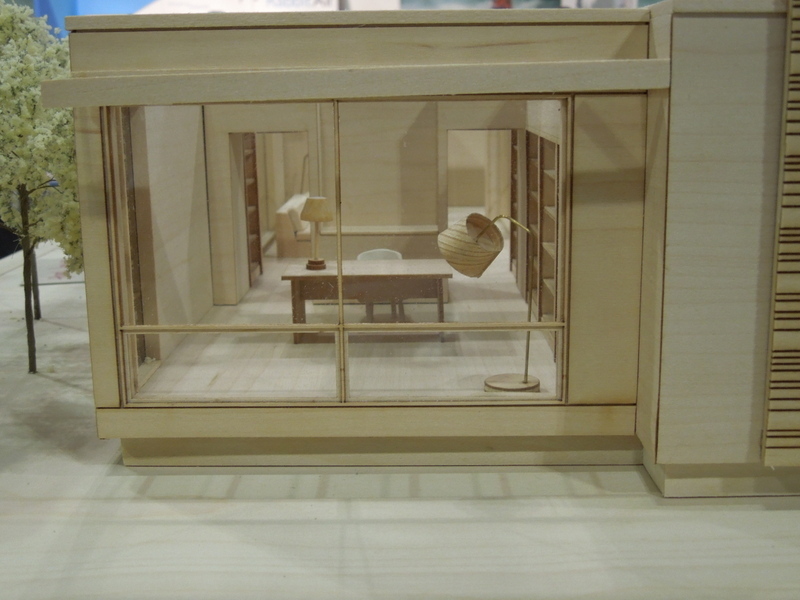 I mean, look at the miniature lamp!! 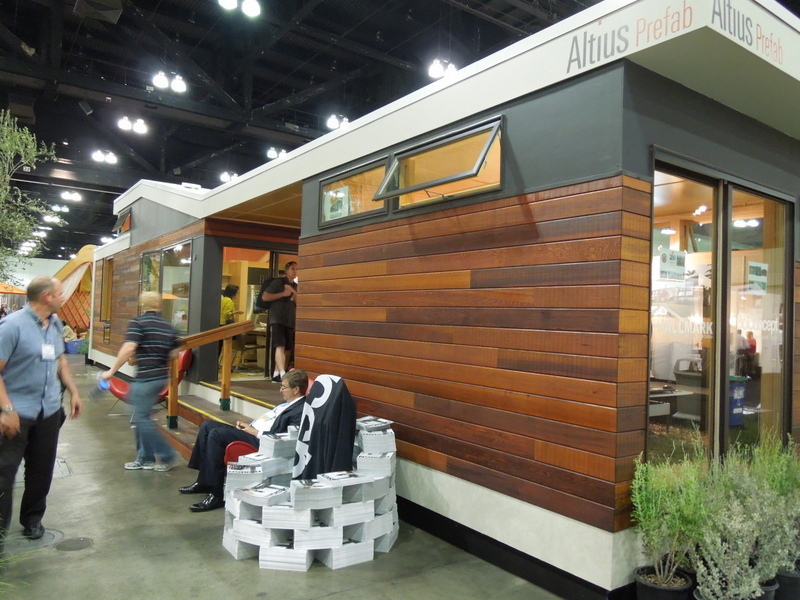 This prefab home by Altius was my favorite exterior of the homes on display. Wheel Haus had a creative set up. 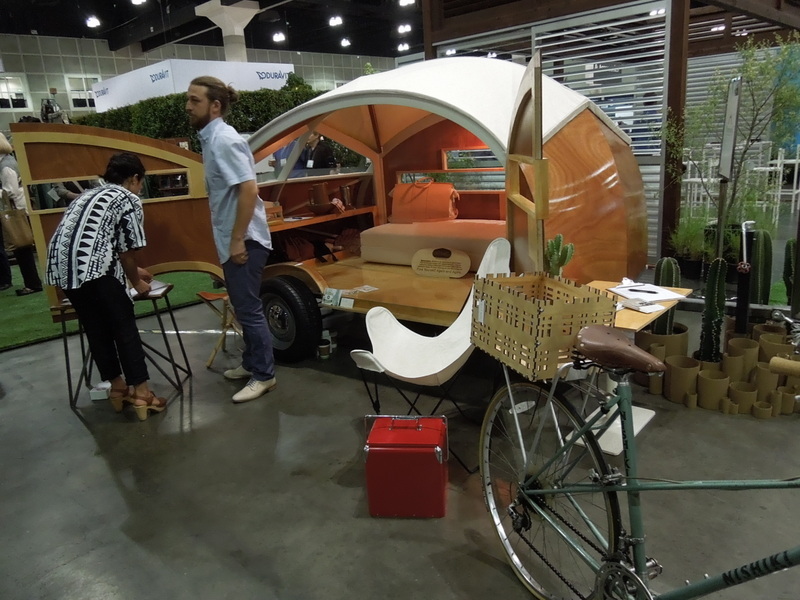 This is more like a mobile home in that it is literally on wheels and just needs to be plugged into the utilities and you’re all ready to go! 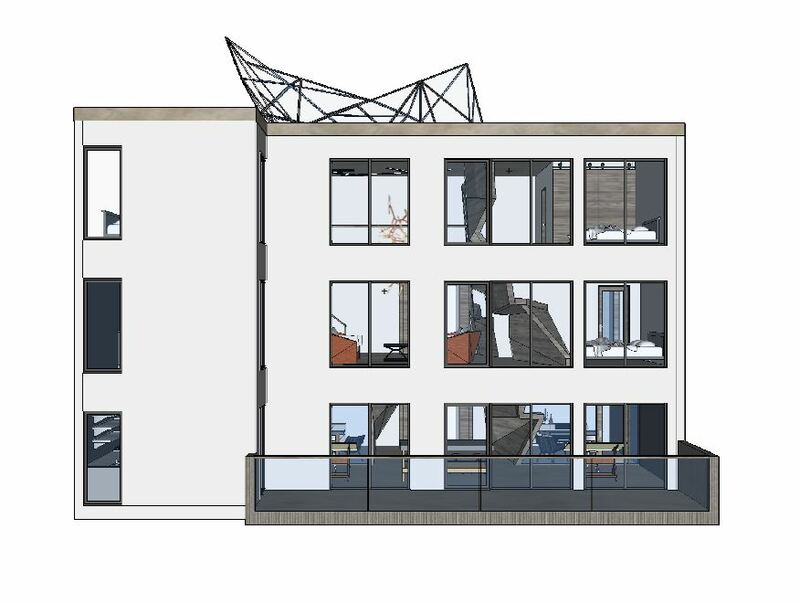 But look and the awesome, huge overhang over the porch. 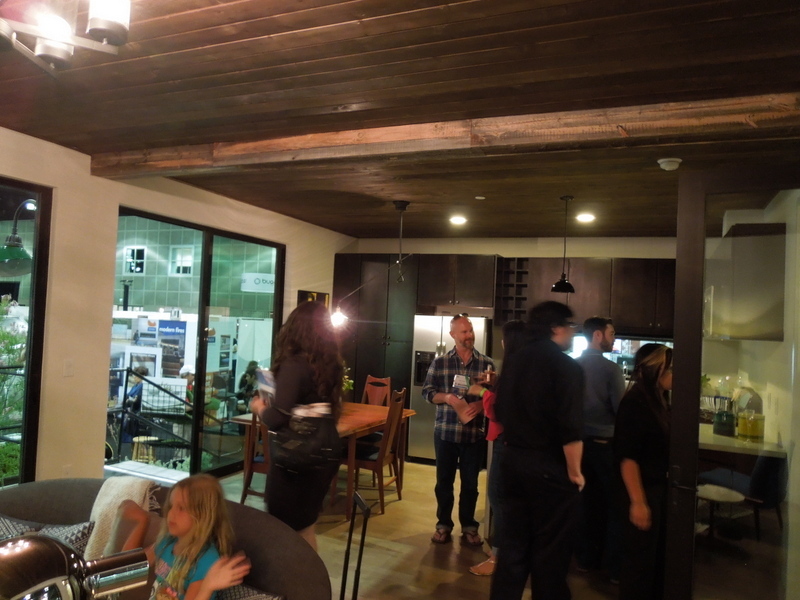 And I just loved the wood plank ceilings. 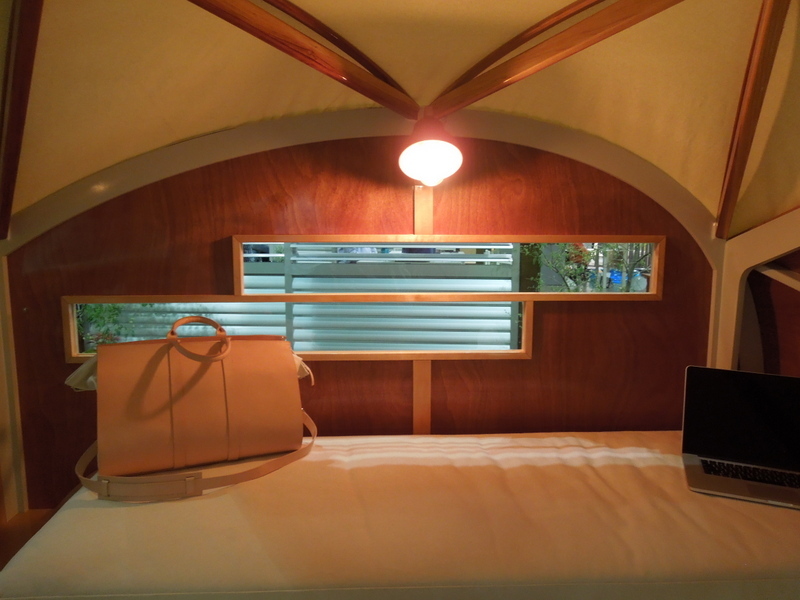 This feels nothing like your stereotypical mobile home. 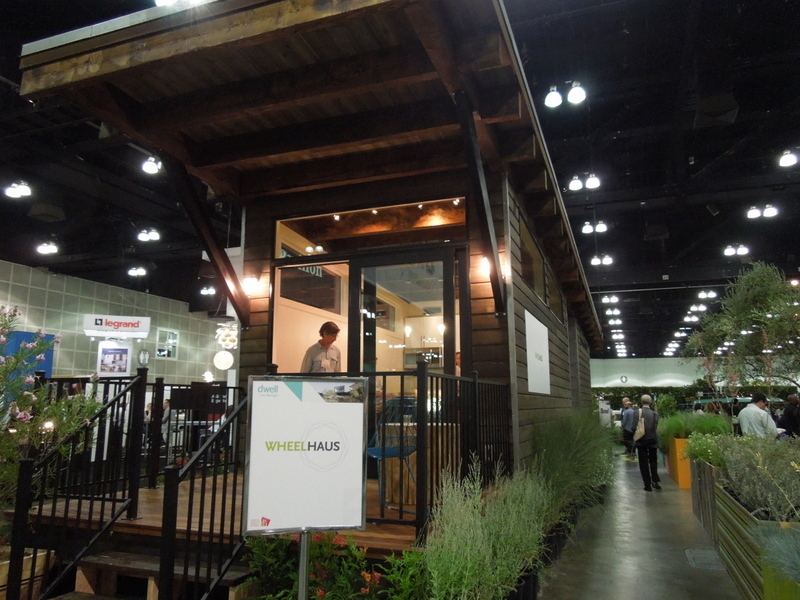 This 3-bedroom/1-bathroom house by Living Homes was by far my favorite prefab home on display. 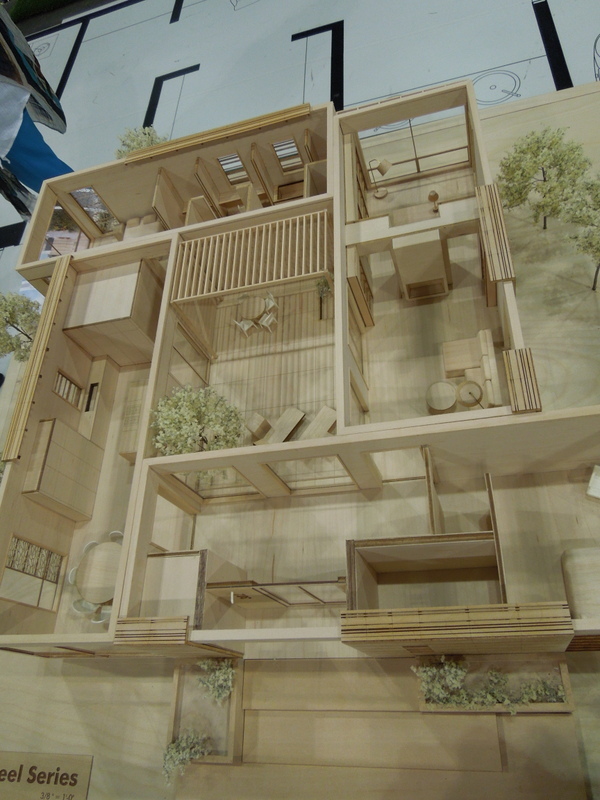 Its layout was well thought out, the finishes inside were top notch, and even the decor of the model made it easy to get a feeling of what it would be like to live there. 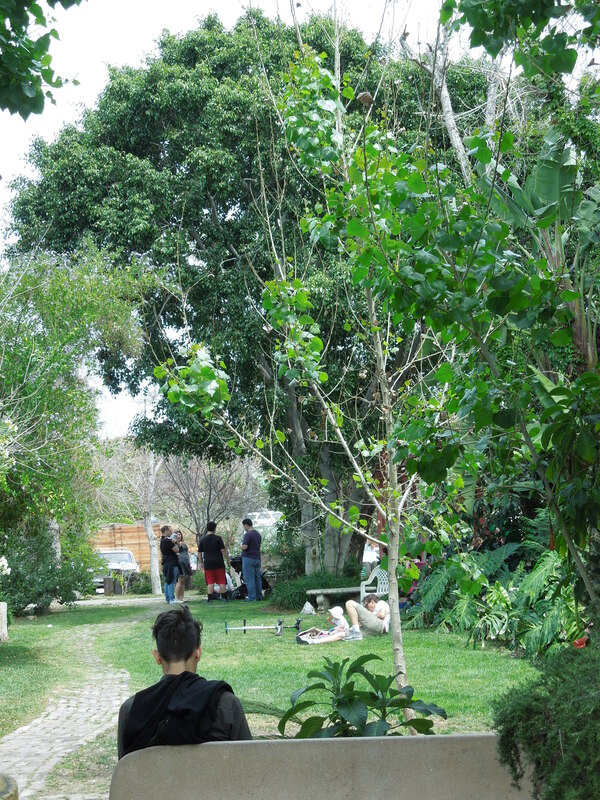 The people wandering through even looked at home inside. 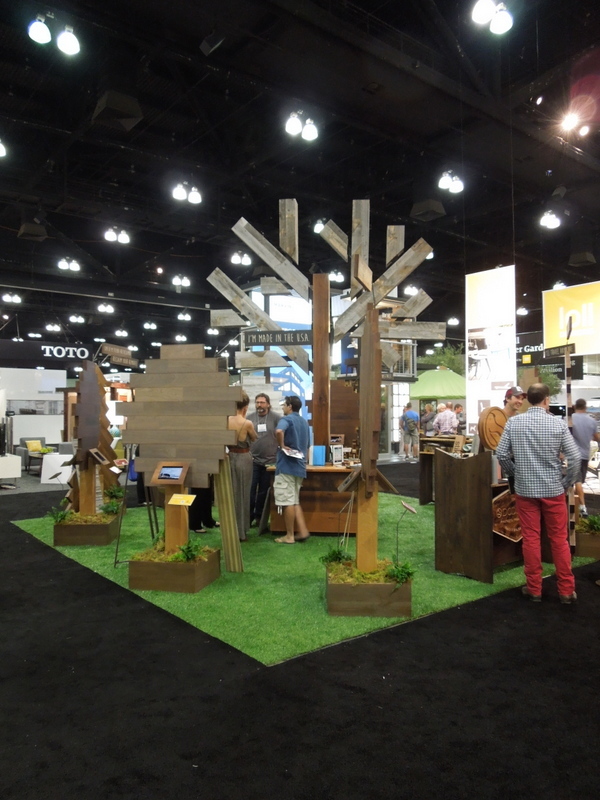 I’m so glad I was finally able to make it to Dwell on Design this year. It really got my creative wheels turning! Well, I am well on my way into yet another quarter of classes. They seem to go by faster than I can keep track of! There ‘s always a bit of a rough transition between the madness of final projects and the maneuvering of a new class’ routine, so I am especially grateful when I hit my stride. 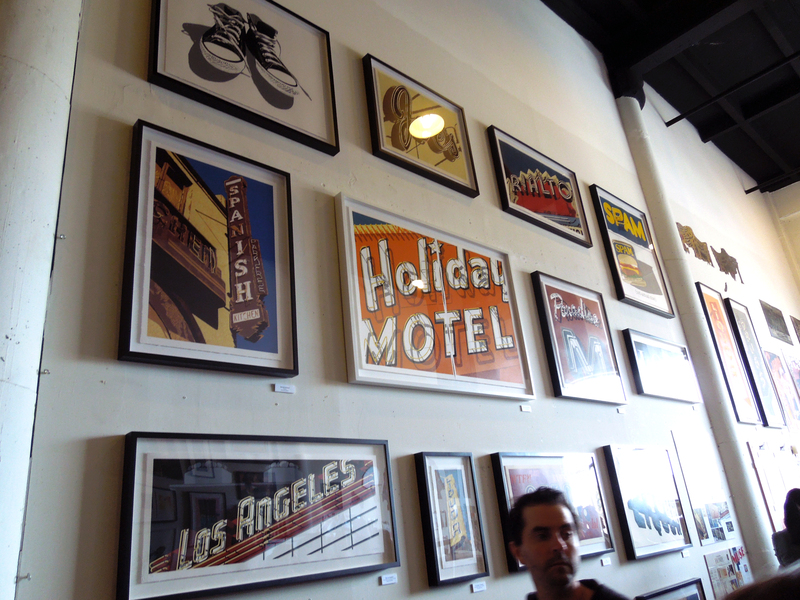 That finally happened last week, so the hubby and I took advantage of some long awaited free time l and went down to the LA Brewery Art Walk over the weekend. I had never been to this art walk before, even though it happens twice a year. And I really had no expectations or preconceived ideas of what I was walking into. (I find that’s the BEST way to discover new things!) 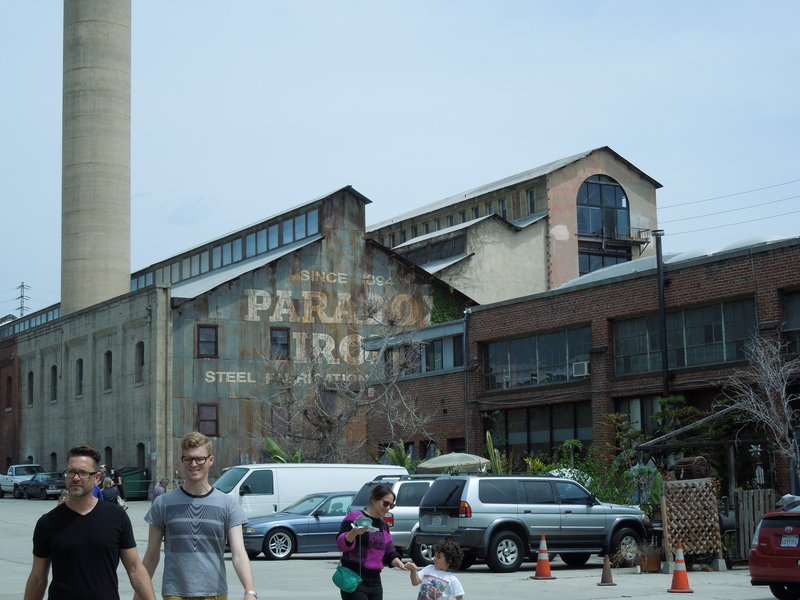 I was blown away not only by the abundance of creativity and extremely talented artists, but also by the community in which the art walk took place. 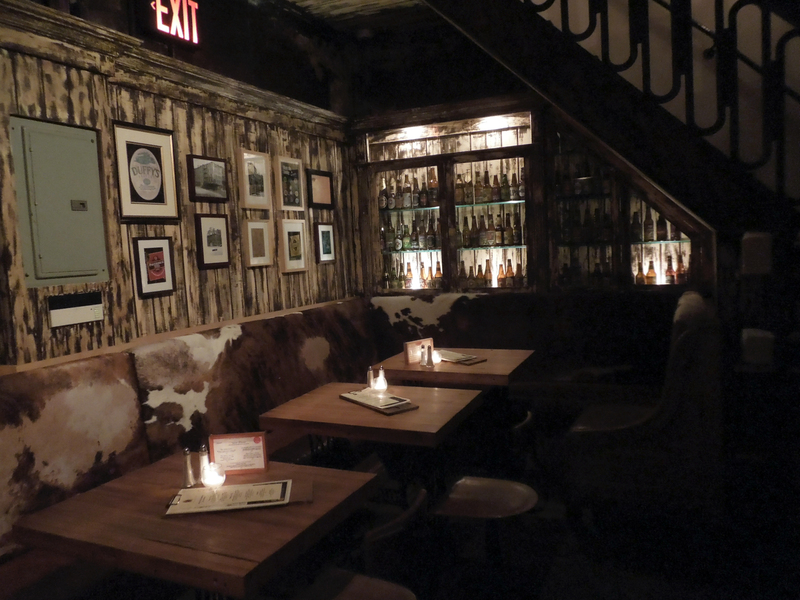 So I’ll start by telling you haw totally awesome this place was! 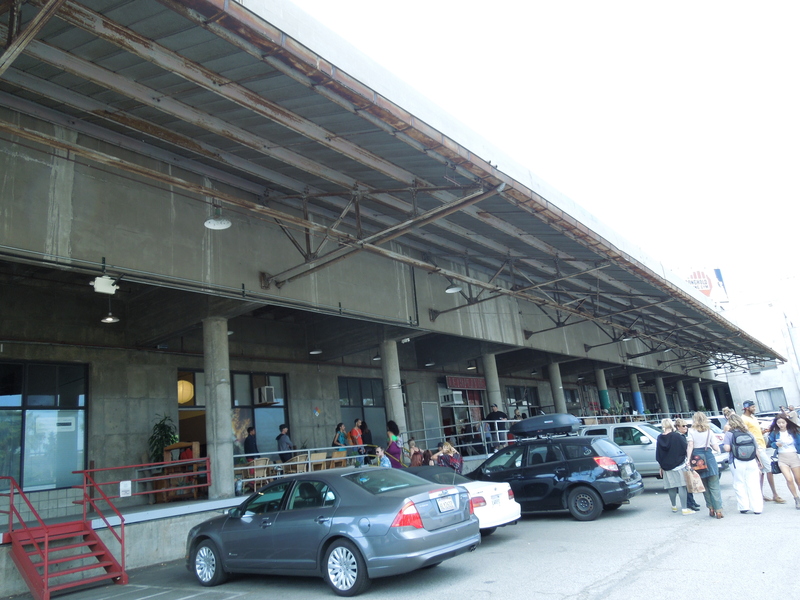 The Brewery Art Walk takes place at a former Pabst beer brewery in downtown Los Angeles. But it is oh so much more than that. 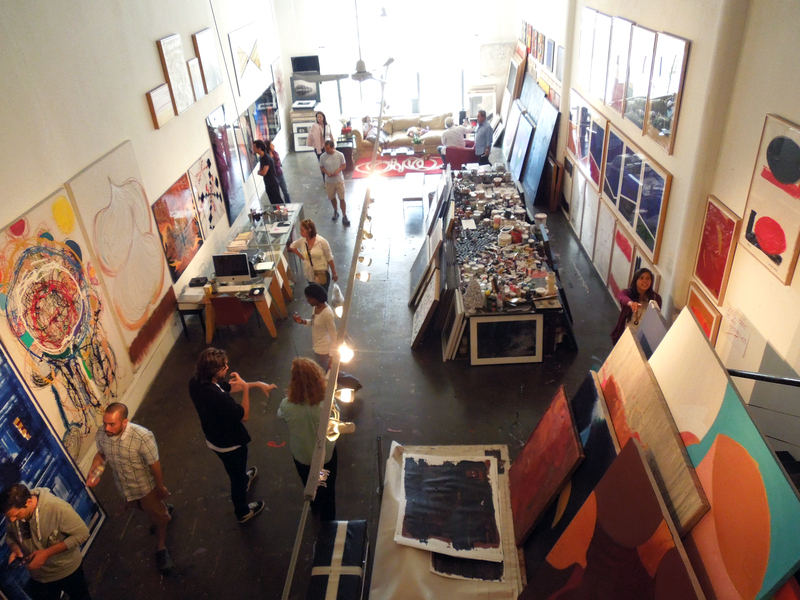 Since the 80’s, this complex has been home to an enormous community of artists. 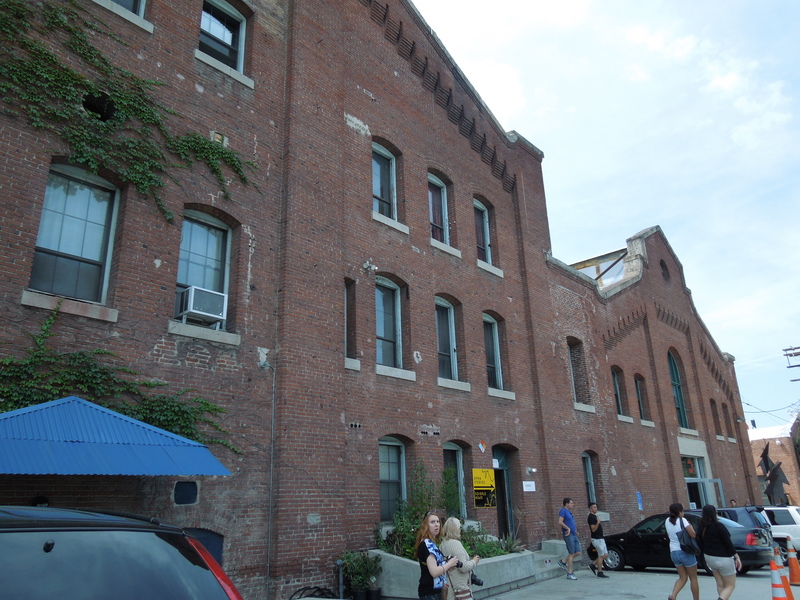 The buildings here have been converted into live/work loft spaces with a strict rule of only renting to artists. 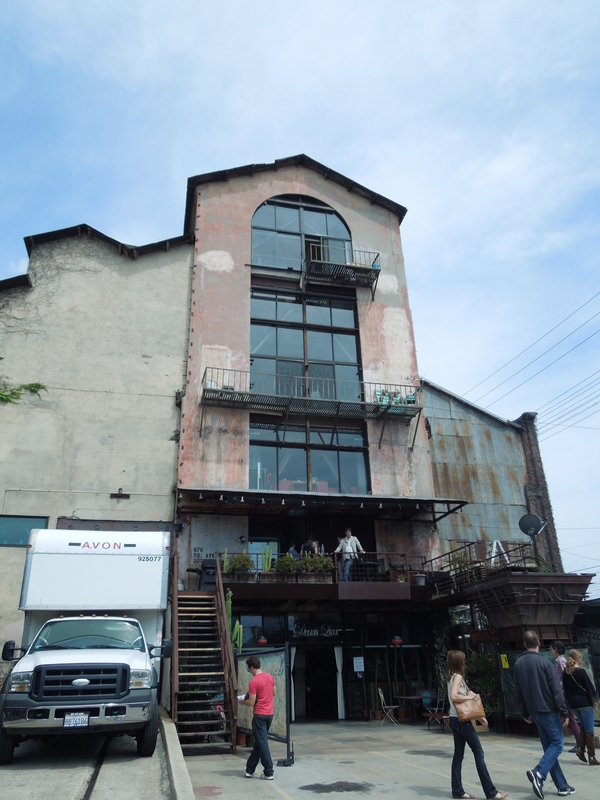 There seemed to be a huge variety of loft spaces; some were single story, some had an upstairs loft for living, but all were equipped with their only gallery spaces. 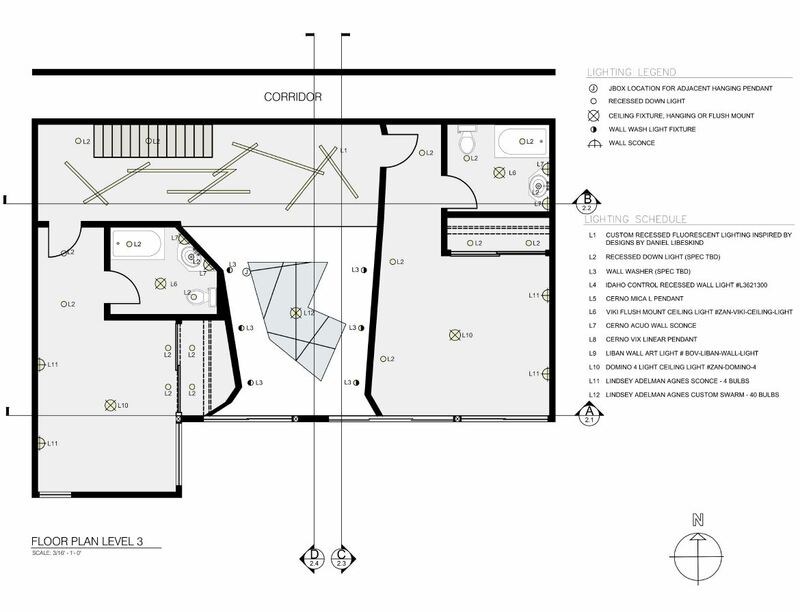 Many of them included small private outdoor areas, porches, or patios. 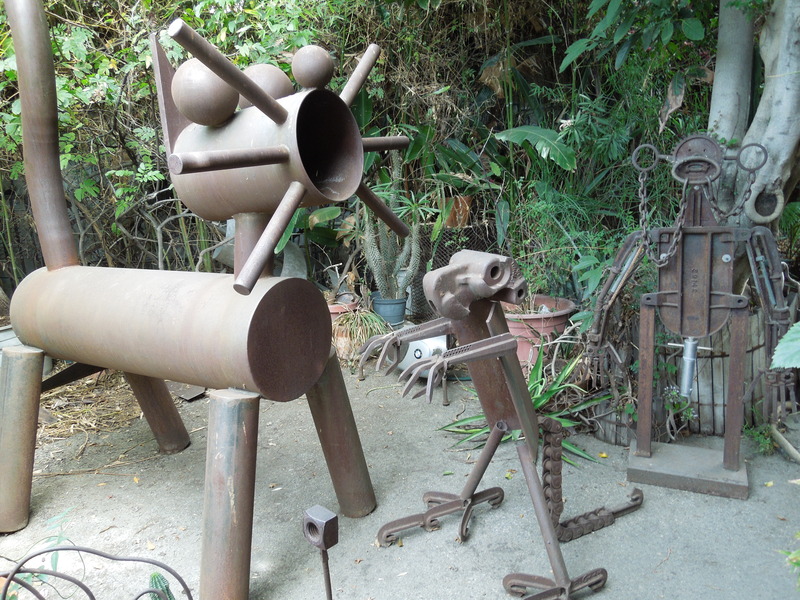 All of the open studios seemed to have a river of visitors in and out, all admiring the artists’ work. 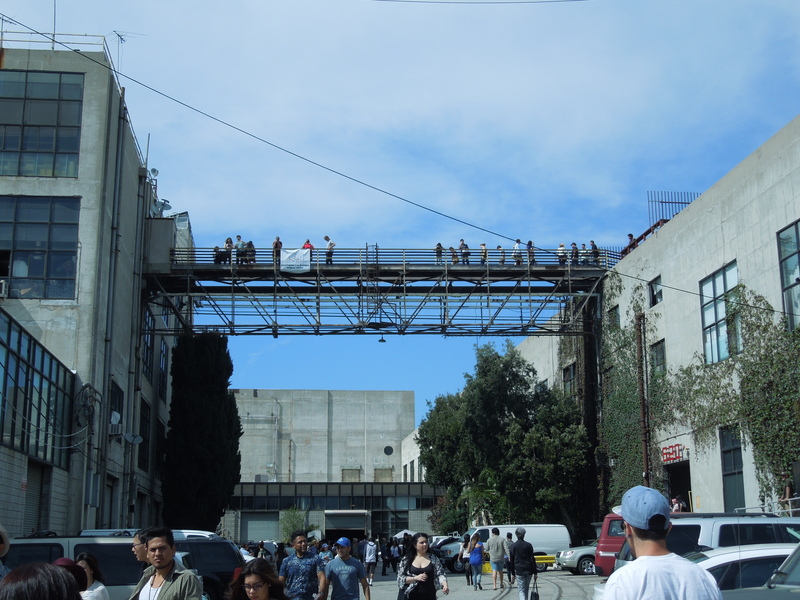 This catwalk led us from one building’s roof top to the other, and was also a great way to get a lay of the land in this huge former industrial complex. This loading dock has clearly become a place of gathering, and for one day it was fun to feel invited to play with such a creative group of people. They were sitting, chatting, drinking, grilling, and inviting everyone to join in. I like to imagine it’s like this on any typical weekend here at the Brewery Art Colony. 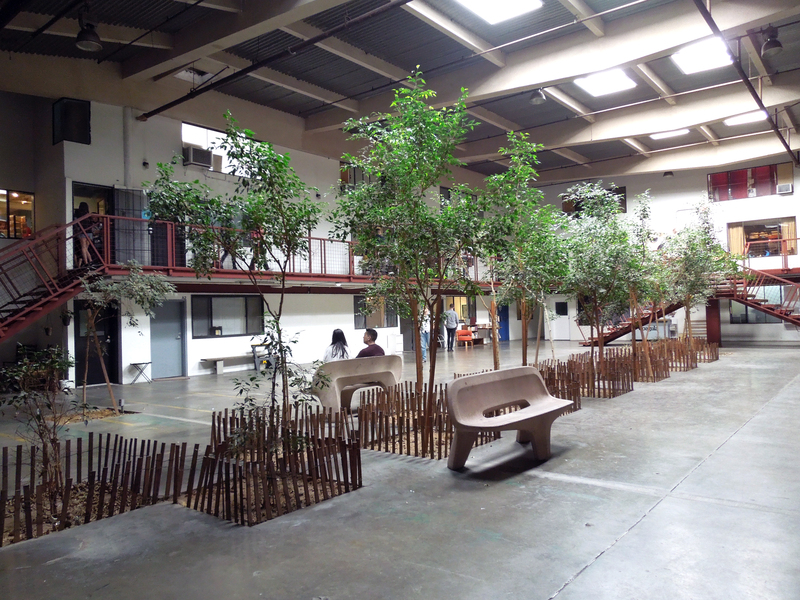 And I just love how the inside of the building has been transformed into a courtyard. 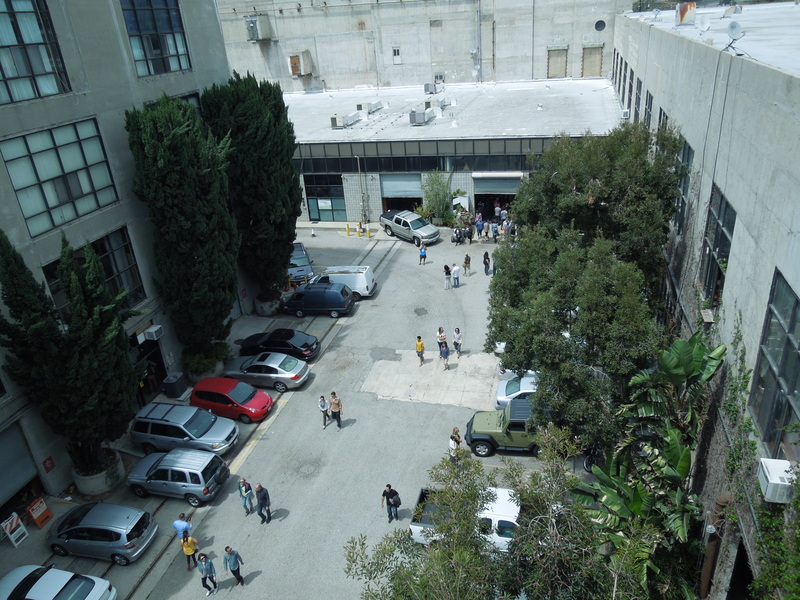 There’s even a small park right in the center of the complex, which people were clearly taking advantage of. I know, I know. What you really want to know is “What goes on there, exactly?” Well, for one, this: These light sculptures were created by Sean Sobczak, whose gallery was a delightfully playful, and skillfully created dreamlike world that gave us our first taste of what the Brewery Art Colony has to offer. 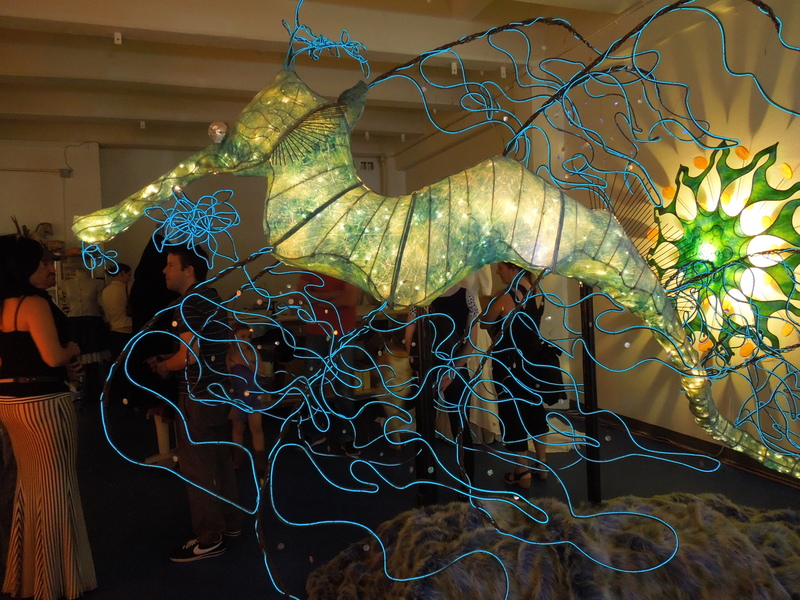 I could easily imagine these glowing creatures swimming off into a magical ocean. I loved this ceramics gallery, called Me Like Clay. 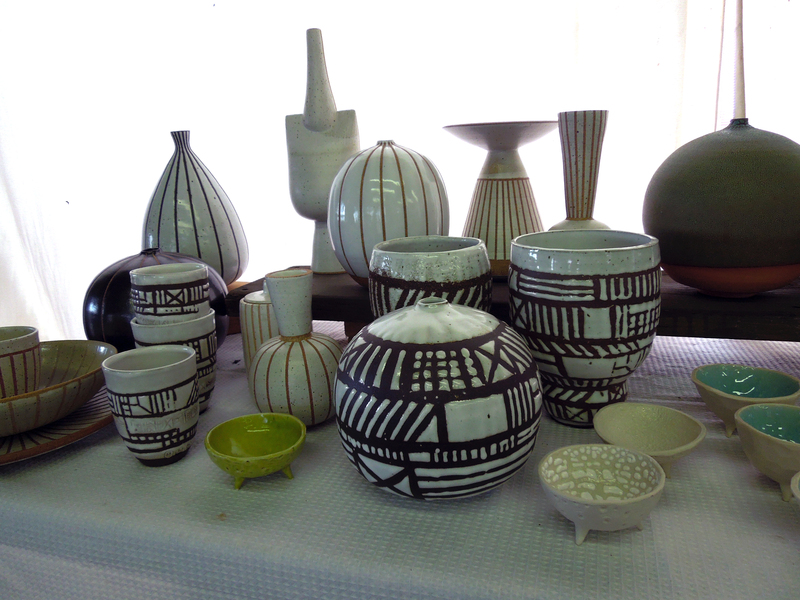 There are 3 ceramics artists that work together there, and the result is a wonderful collection of all sorts of goodies. 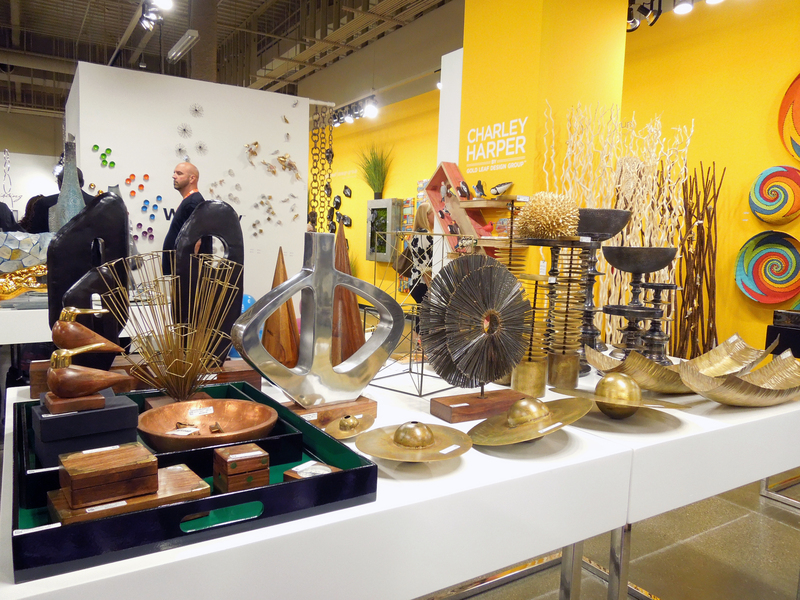 One of the things I loved about their work is the use of bright pops of color among some very natural, organic designs. 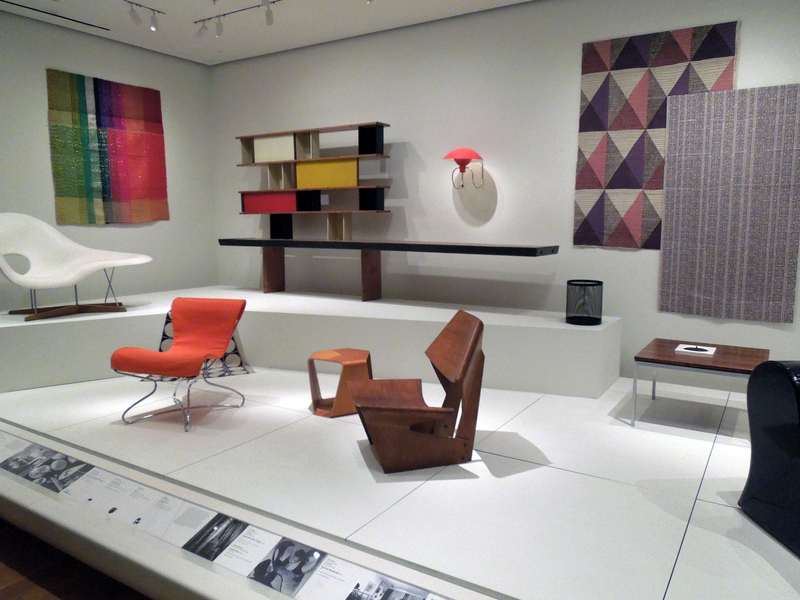 Most of their work on display was just as practical for use as it was unique and colorful. 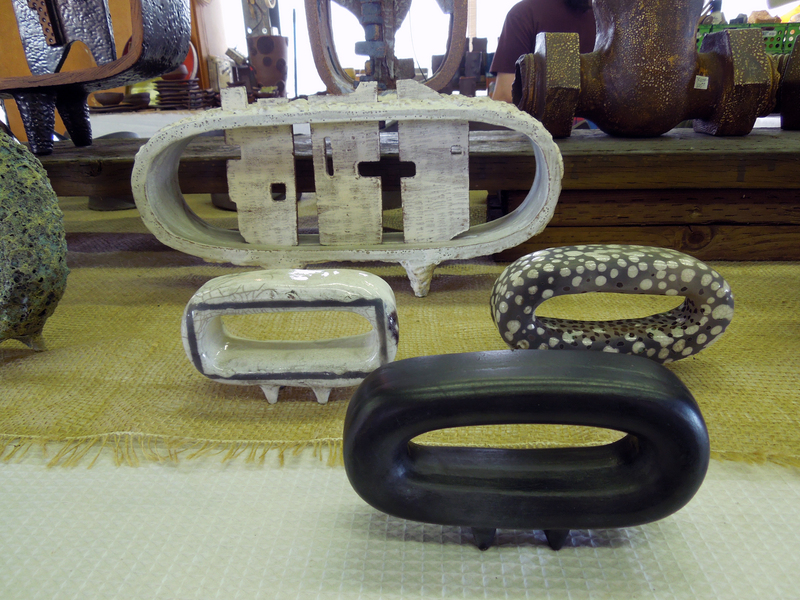 But the gallery was sprinkled with really interesting sculptural pieces as well. 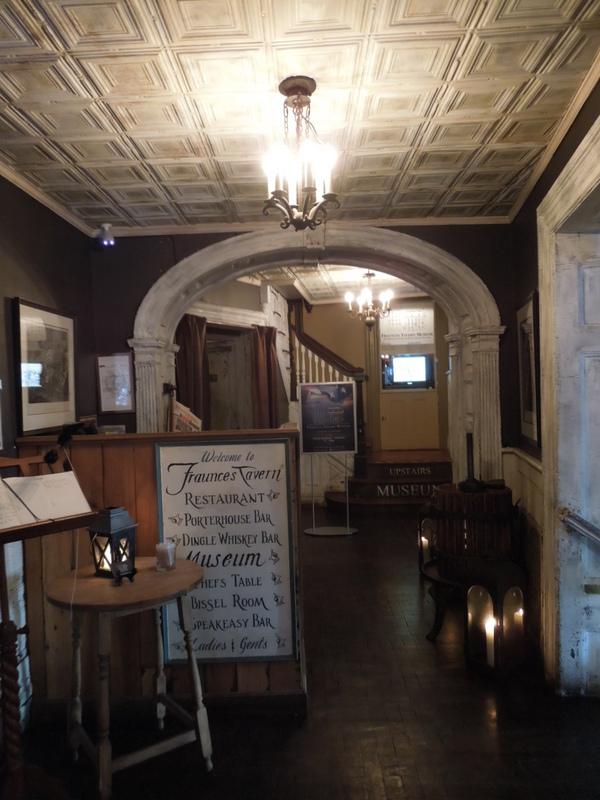 We were delighted to wander into this gallery as well. I can say with confidence that no photo could ever do this artwork justice. 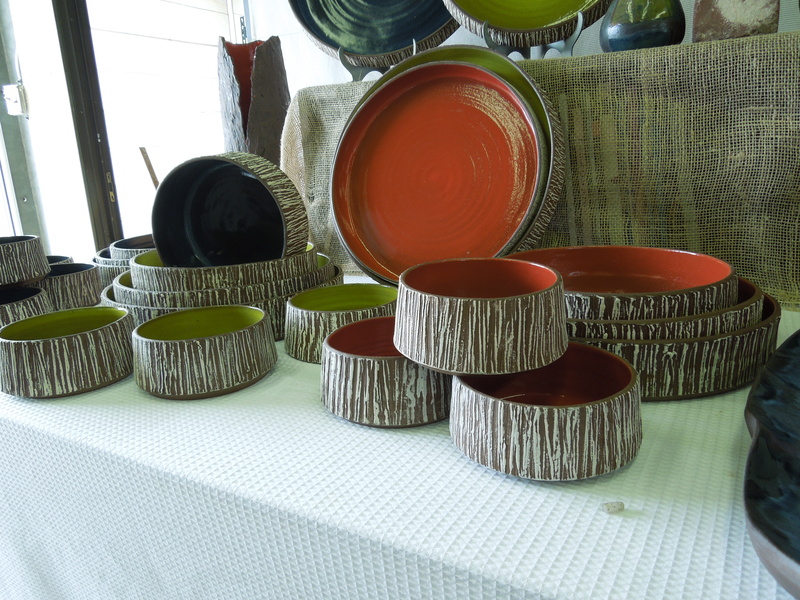 What you can see is Ann Gooding’s use of color and pattern. 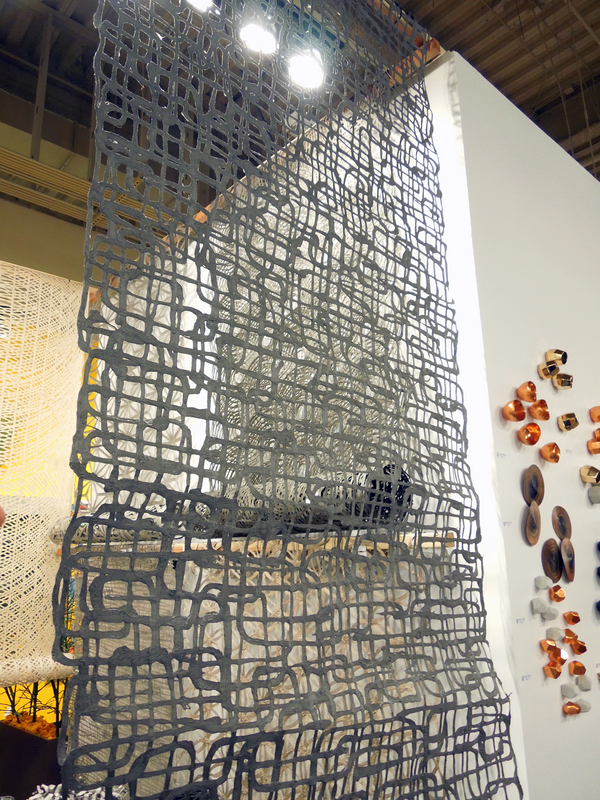 Each piece draws you right in like a magnet. 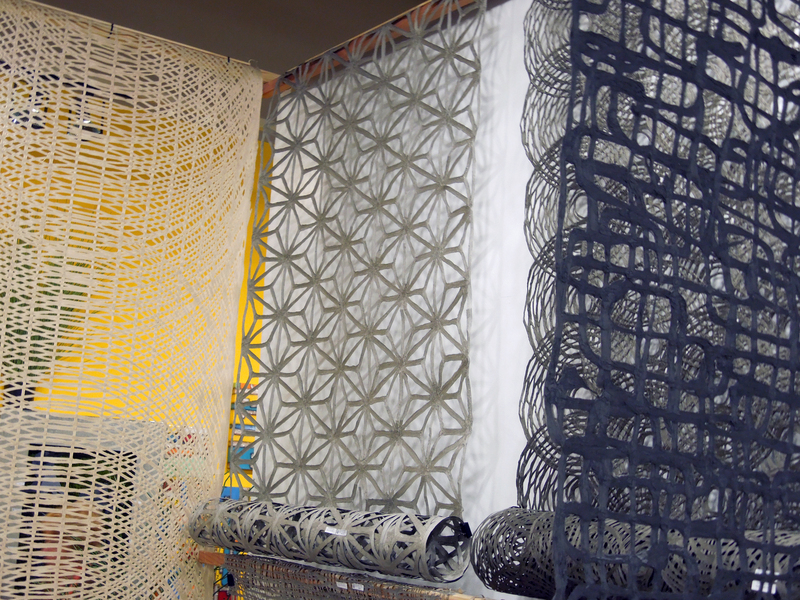 What you can’t see is the incredible process to takes to create these. 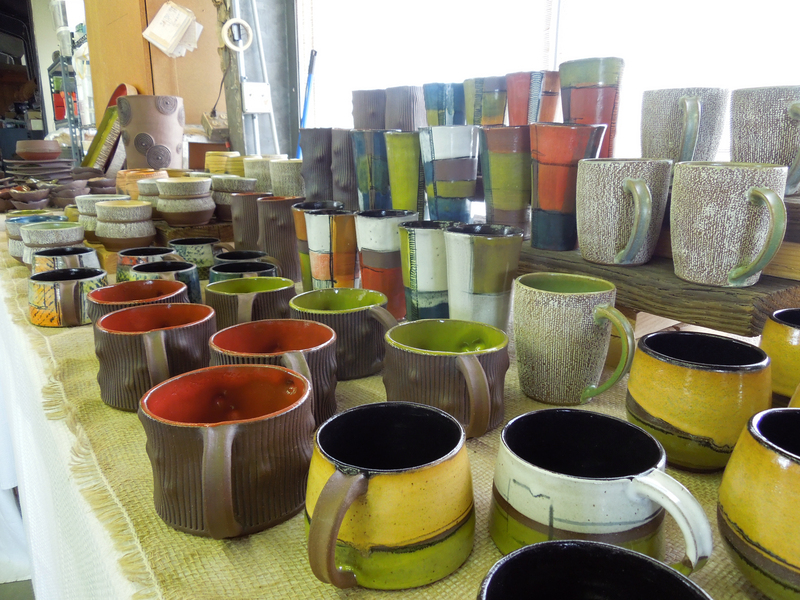 From what I could tell, each one was layerd with 4 or 5 paint colors (and left to dry. Then the patterns were scraped or scooped out all the way down to the wood base in some cases. So each speck has several colors showing in rings within each other, not unlike the rings of a tree’s core, or those in a slice of a geode. 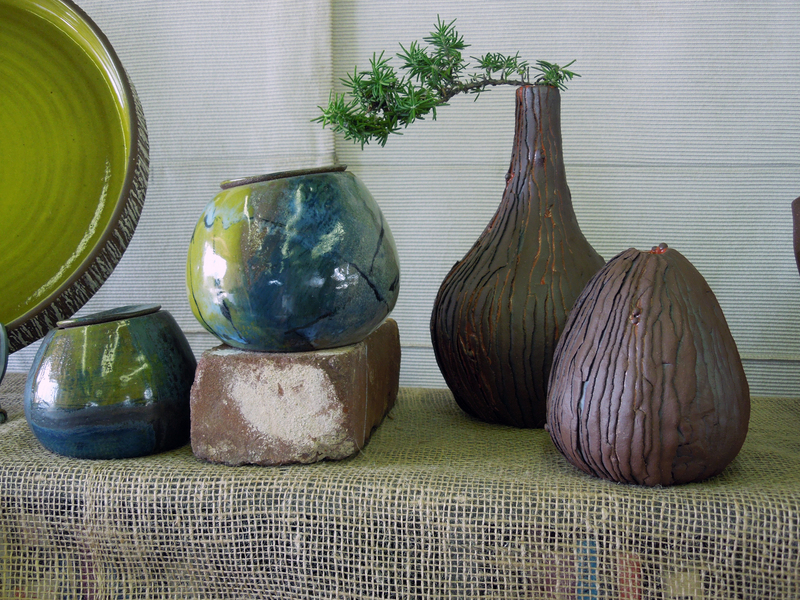 The colors and textures of each piece are totally unique. 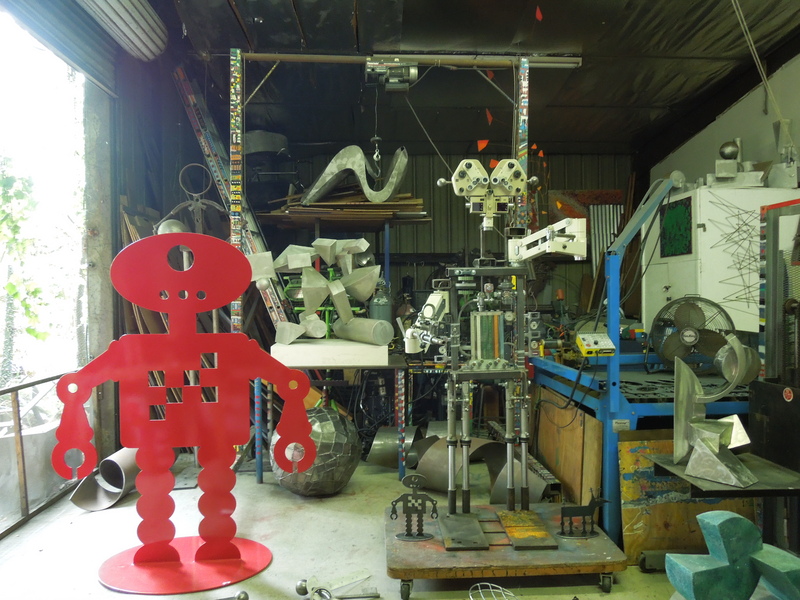 Many of the artists working at the Brewery are not afraid to play, and this metal shop was clearly a playground for Bruce Gray. We popped by Two Bit Circus, which invited people to come in and play in all sorts of ways. 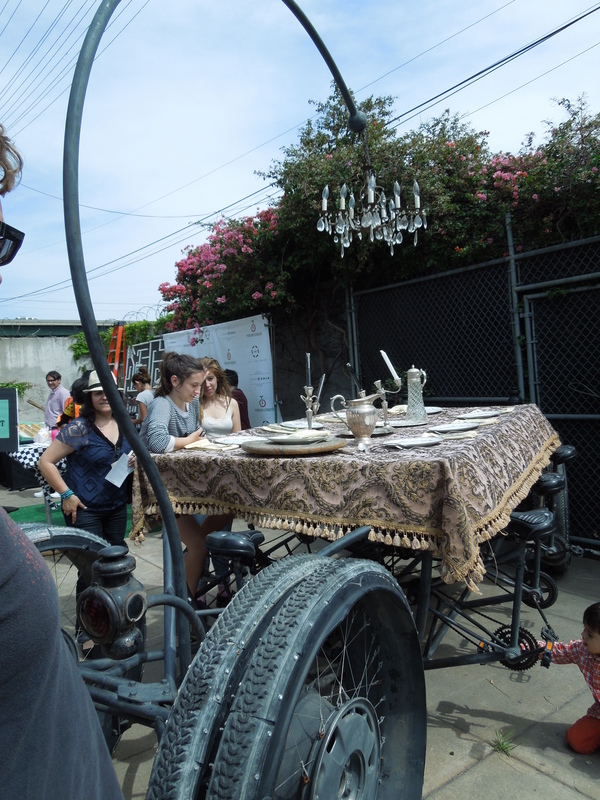 This is a bicycle powered dining table, which I’m certain I’ve seen pedaling through the streets of L.A. on some occasion. (Maybe it was at Ciclavia?) 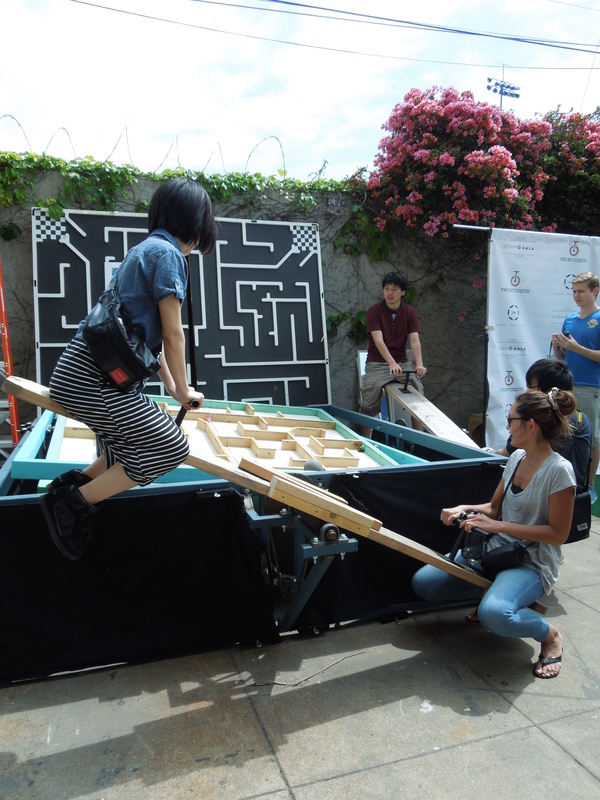 These 4 people were trying desperately to solve this labyrinth, talking to each other to try to coordinate the see-saw movements needed to tip the board at just the right angle to turn the ball in down the right path on the maze. There was no shortage of photographers’ work on display, but Kevin Break’s take on Los Angeles caught my particular attention. 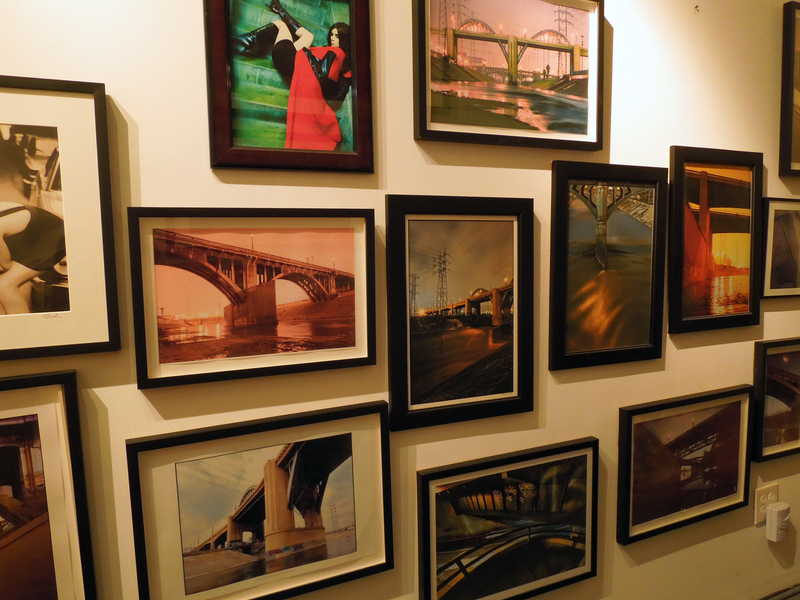 His shots of the L.A. River at sunset were my favorite. 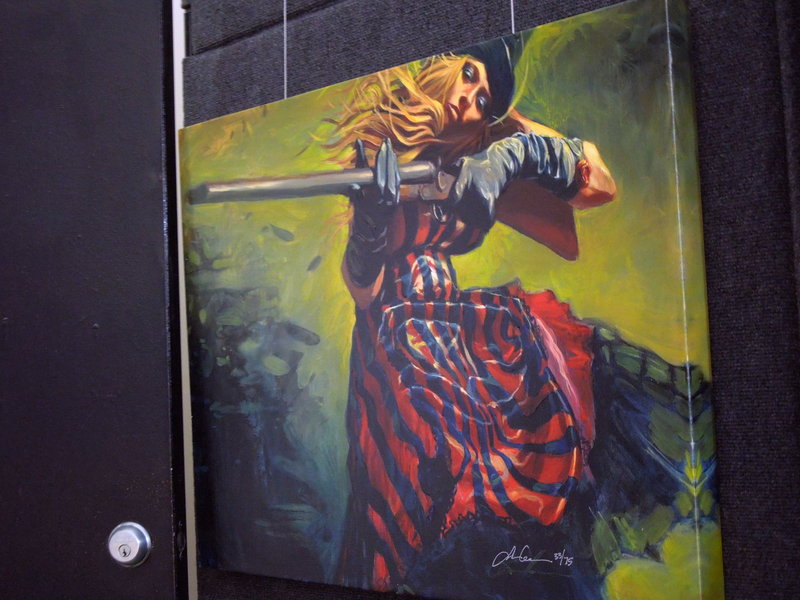 We happened into Gabe Leonard’s small gallery, and were instantly taken with his expert use of shadow and movement. 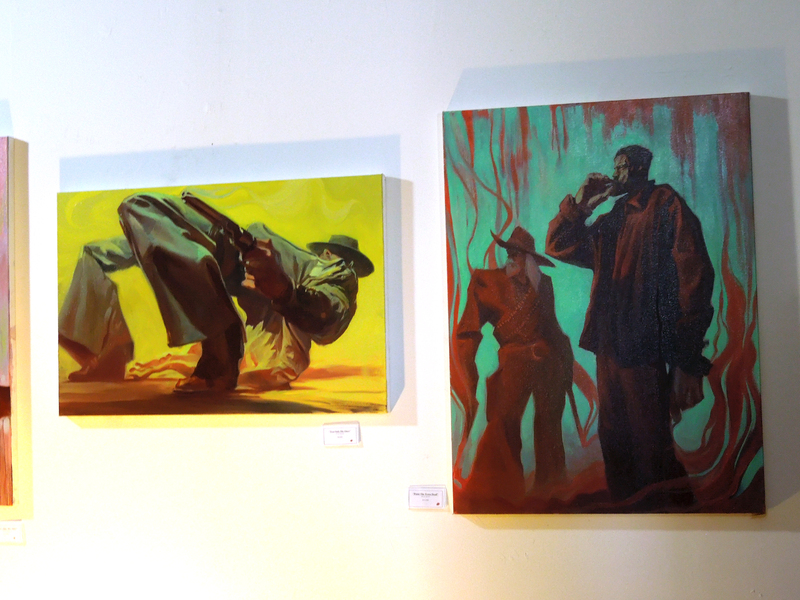 Each piece felt like a scene from a movie, like we had interrupted some fantastical encounter between hero and villain. A few of the galleries had these incredibly high ceilings and fantastic bright windows. These were my favorite galleries in terms of the way the spaces felt. 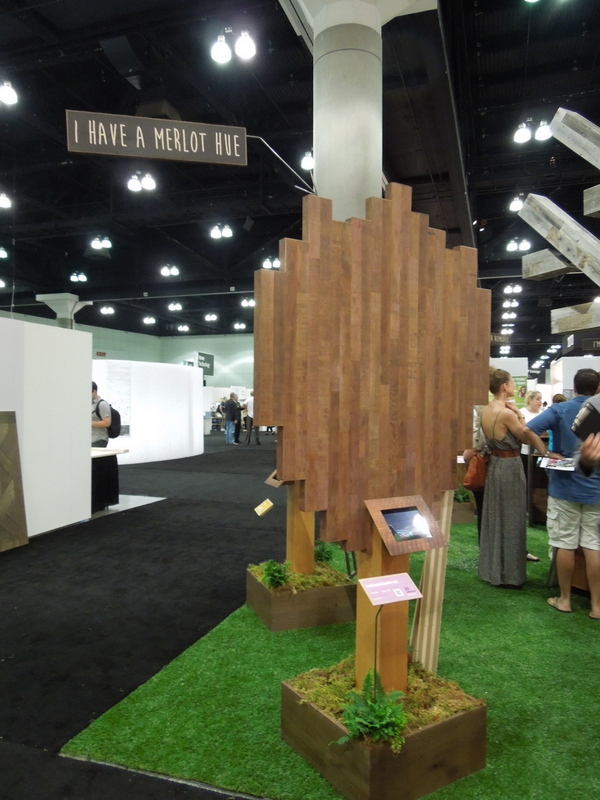 This one was David McKenney’s gallery, and I just loved his work. Pretty much all of it. I love his use of color, shape, and pattern. 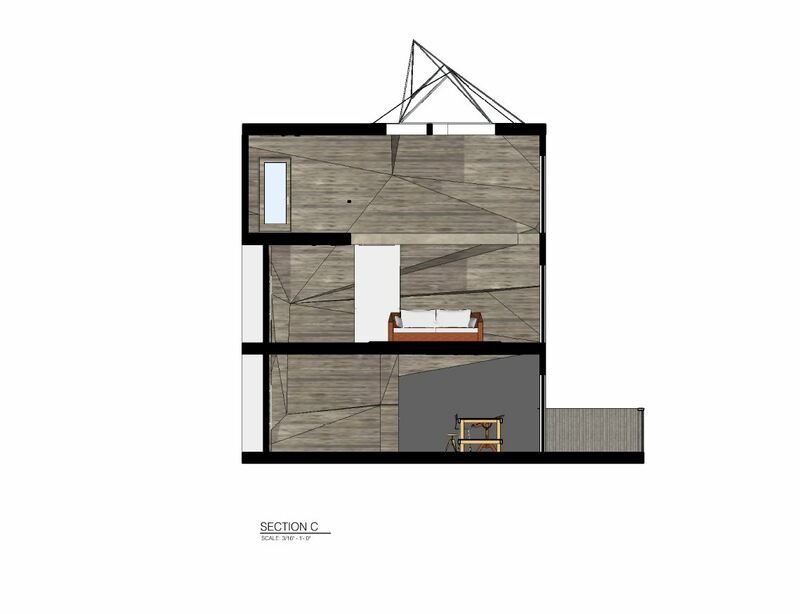 Structured, but still informal. And I admire the variety within his body of work. 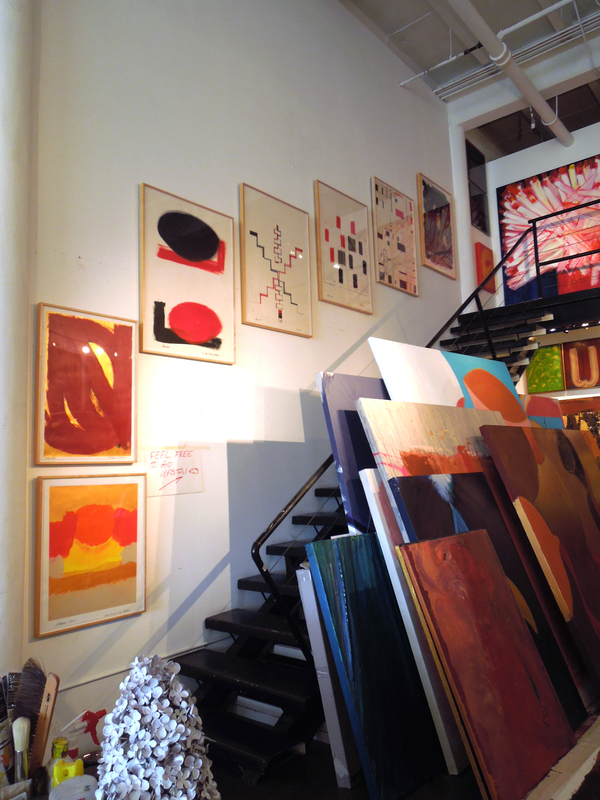 One of the last galleries we wandered into belonged to Dave Lefner, whose focus is reduction linocuts. This was a new process to me, so I won’t try to sound like an expert and explain it in depth. 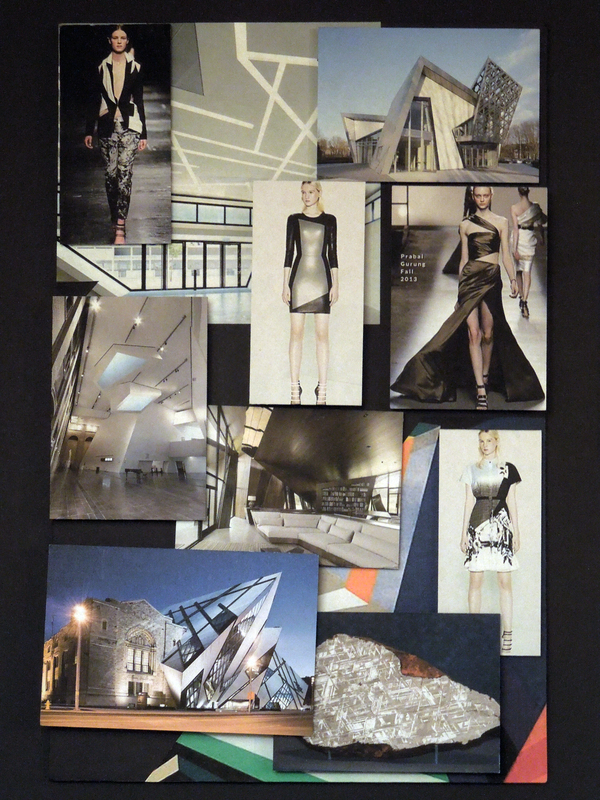 But as I understand it, it has to do with a labor intensive serious of cutouts and layering of paint. In the case of Dave Lefner’s work, the result is incredibly clean, precise, and in some cases almost photo real. There were plenty more artists worthy of being featured on any website or blog, and I’m sure there were many that we didn’t even get to see in such an enormous complex of artists’ galleries. Needless to say, I’m very much looking forward to going back to the next artwork and discovering more. But don’t take my word for it, go see it for yourself next time! Do you have a favorite art genre or medium? 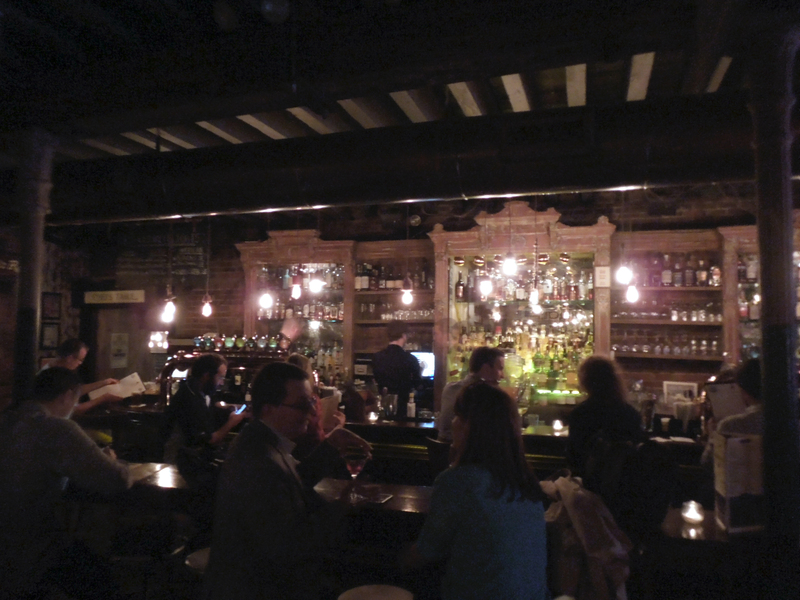 Back in the fall, I made the trip to New York City to celebrate the wedding of a dear friend. 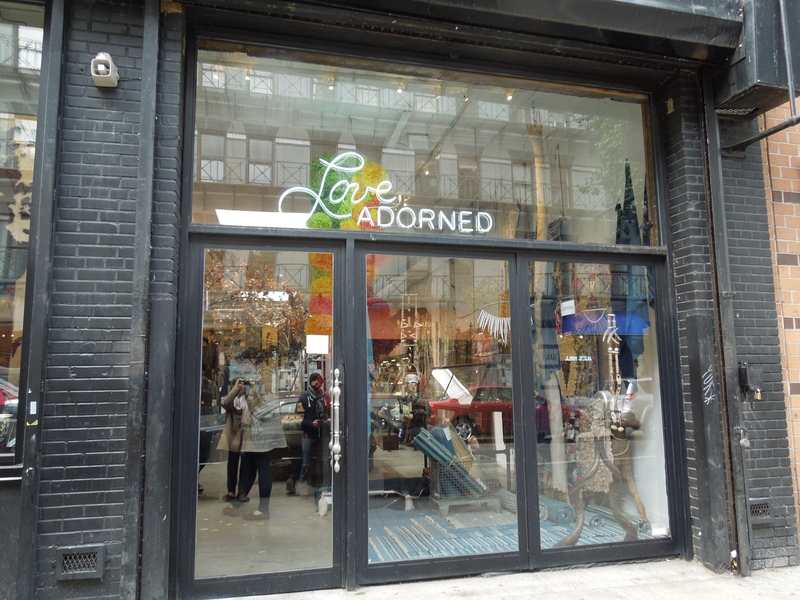 While I was there, I did a little shopping with the girls and couldn’t resist stopping into one of my favorite shops in SoHo for some eye candy! I say eye candy because much of the things I fall in love with here are out of my price range, but that doesn’t stop me for appreciating all the beautiful artistry on display. 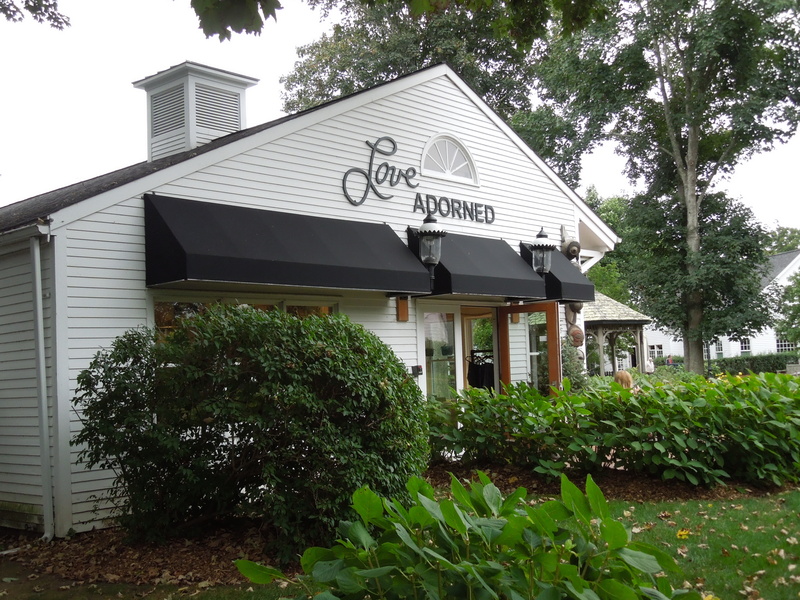 The shop is called Love Adorned, and it’s insides are scattered with an array of handmade goods, from jewelry to rugs, home decor accessories, throw blankets, and more. 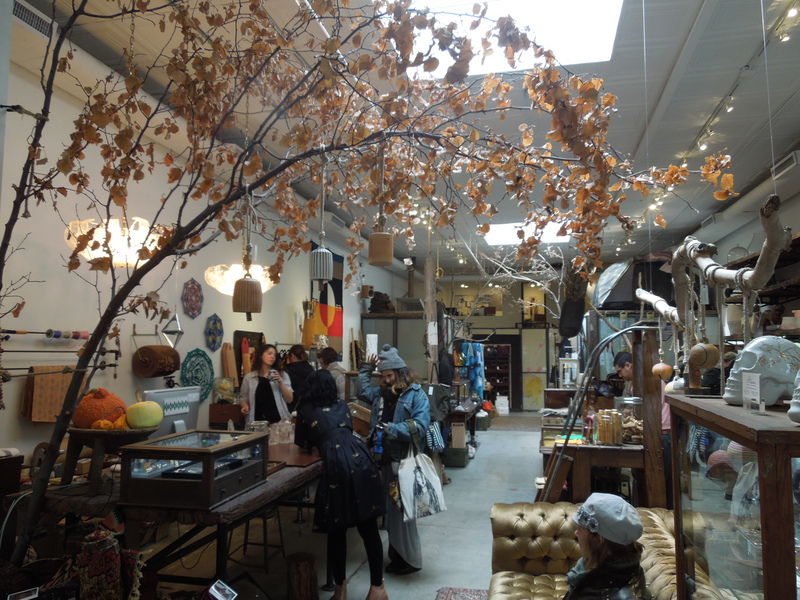 I love the presence of nature in the store, both in its decoration and it’s merchandise. 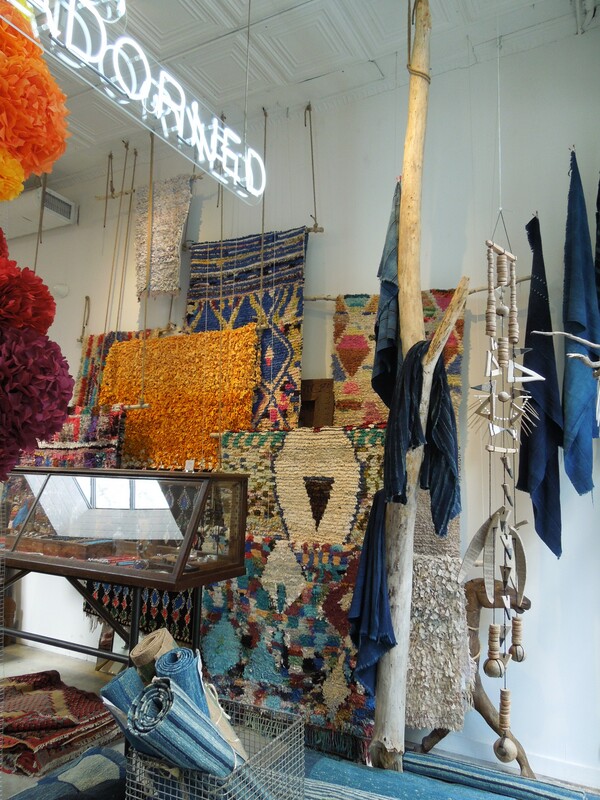 Much of the woven goods have a tribal feel to them, and such great colors! This mask reminds me of some of the totems I saw on a trip to New Zealand a few years ago, shooting a documentary on the Maori healers there. 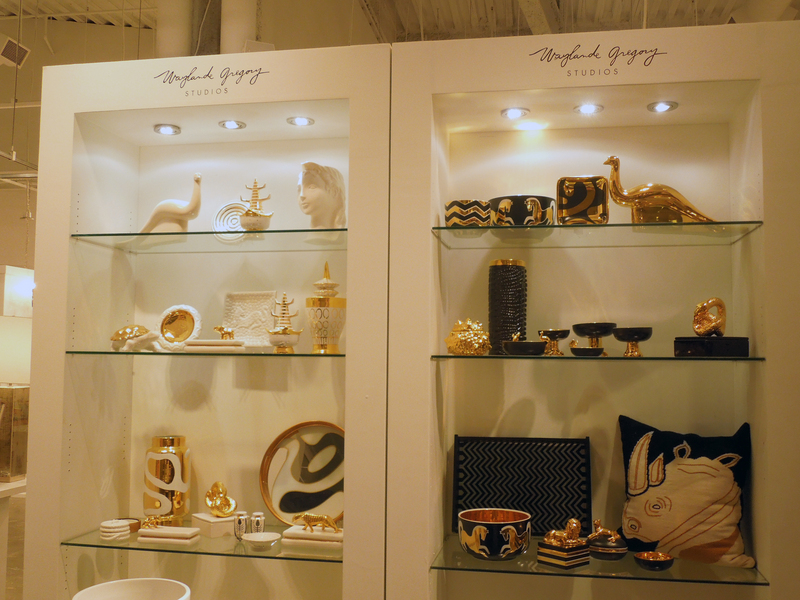 Each case displays a different jewelry artist’s pieces. They asked that I not take pictures of the specific jewelry on display, but I must direct you to their website to see some of them. This is one of my favorites. 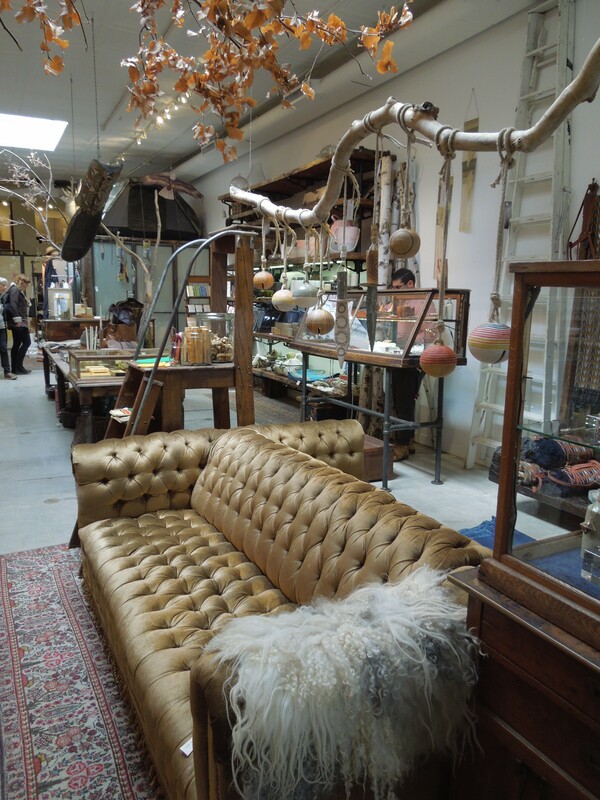 This two sided antique velvet sofa provides a striking visual “welcome” into the store. 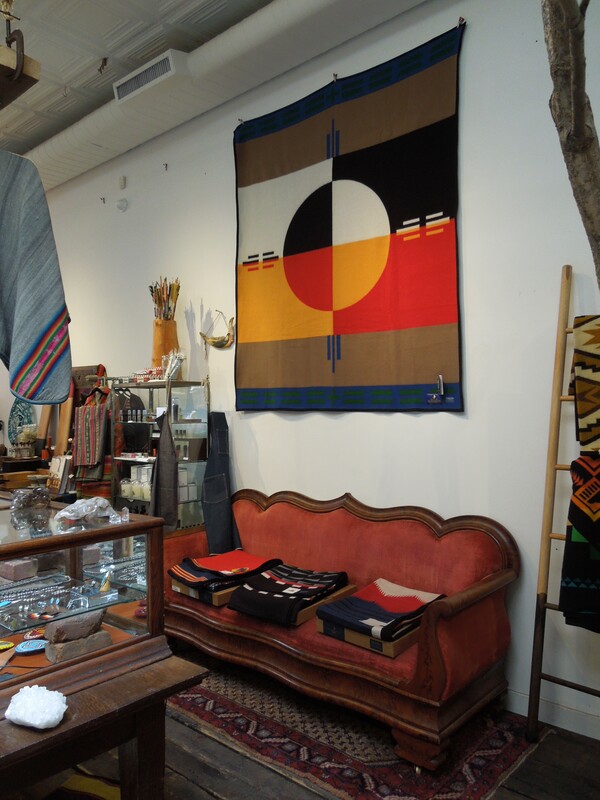 …And this one was just a nonchalant bystander, used as a display for some hand-woven blankets. They had a few display tables for affordable gift items like these, which would be great purchases if you’re not in the market for jewelry. 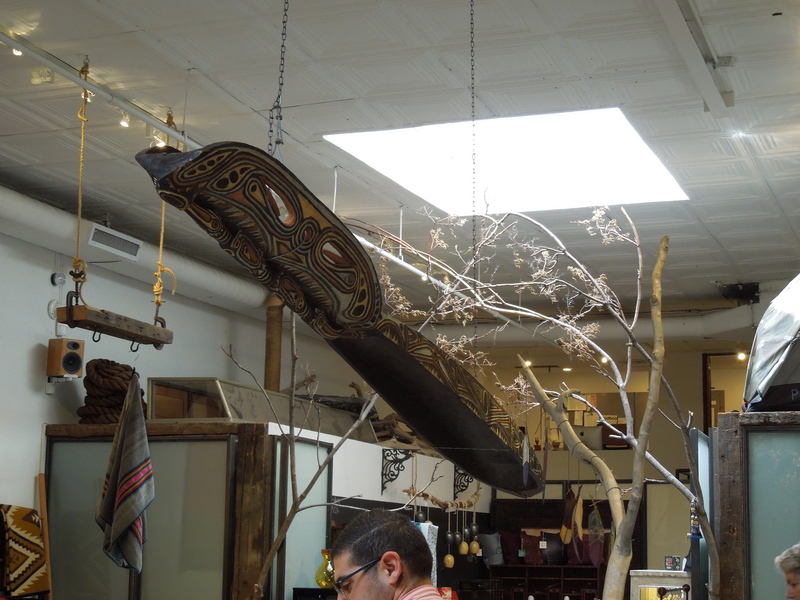 They also sell some select leather goods, and many one-of-a-kind pieces. 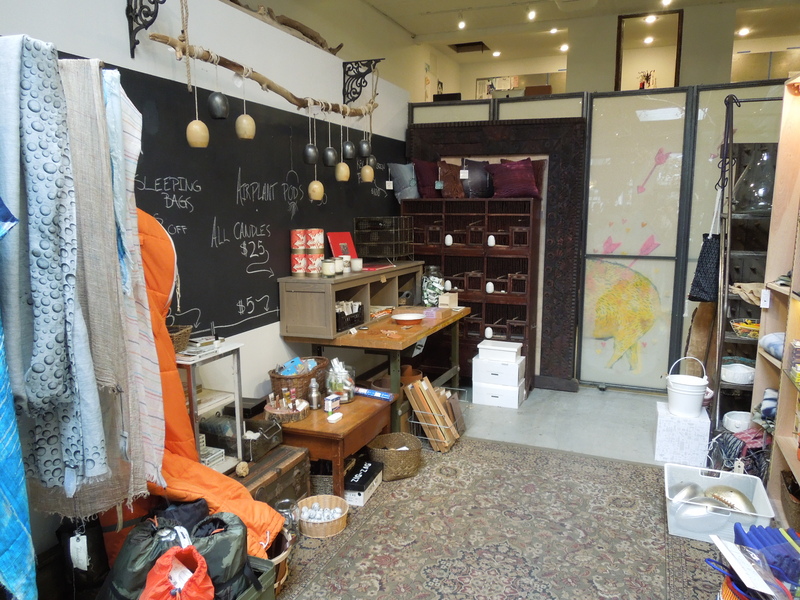 This little nook is a great spot for their eclectic collection of home goods and knickknacks. 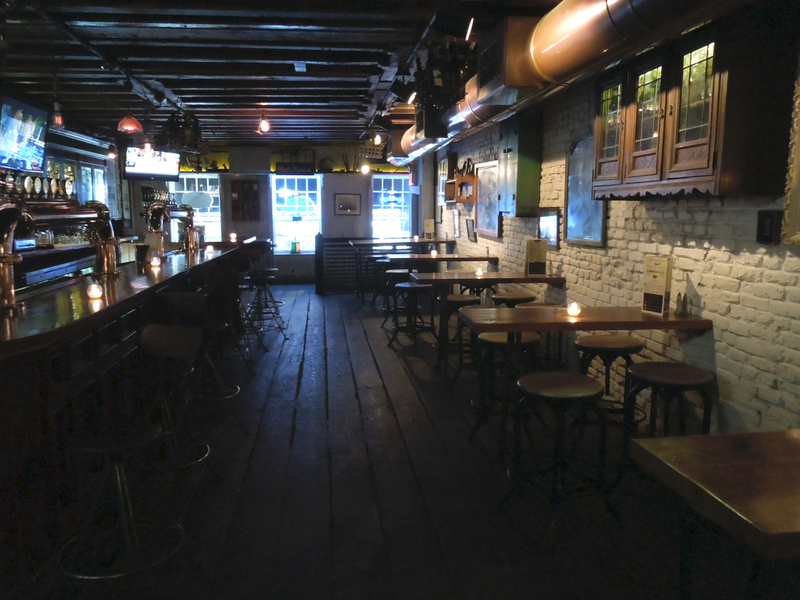 So if you’re in SoHo, stop in and check it out. You won’t be disappointed! I will definitely be back, and maybe one of these days I’ll walk out with some of these. 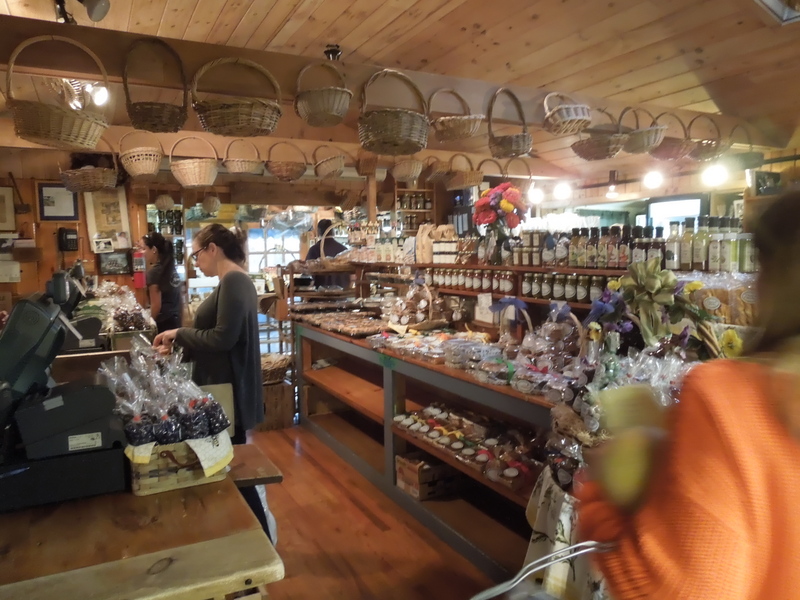 Do you have a favorite shop somewhere? Let me know about it! 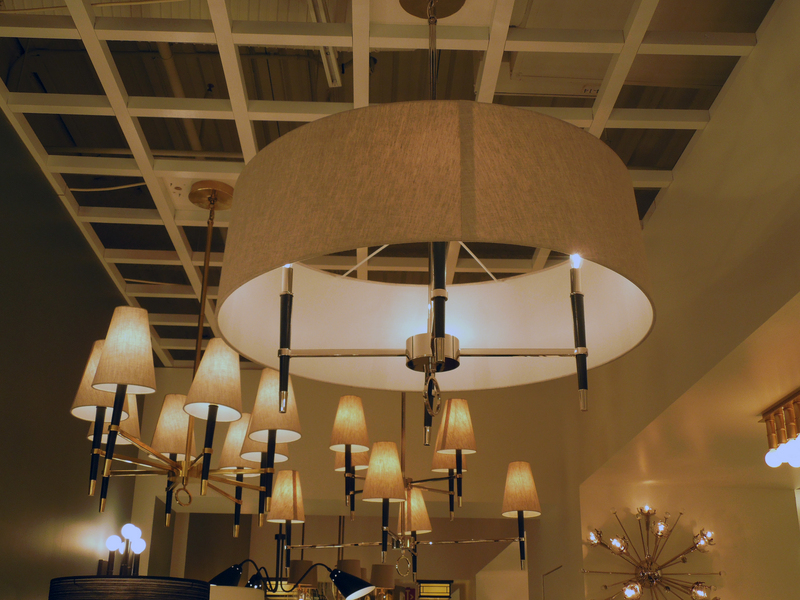 To round out my review of some of the awesomefurnishings and home decor items I saw at the Las Vegas Market, let’s talk about lighting. 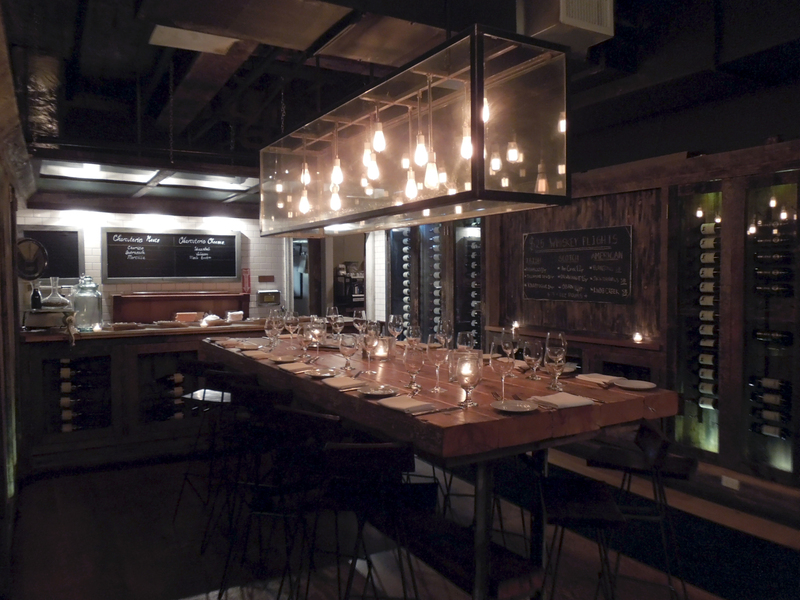 Lighting can be functional: It can give you vision in an otherwise dark room; It can provide an ideal reading spot; It can help you see your food and friends at the dinner table. 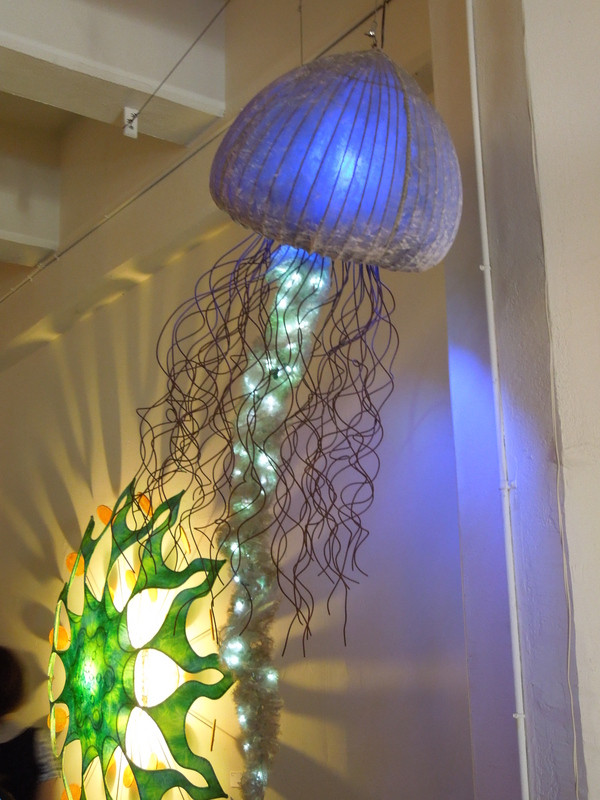 But lighting can also be decorative, beautiful and exciting. 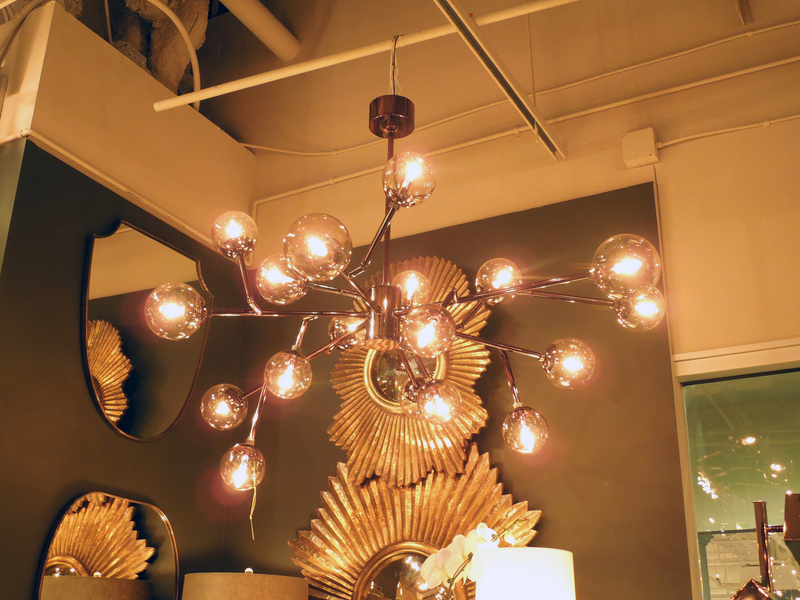 An interesting lamp can completely change the look of a room, and a unique chandelier can be the centerpiece of a space. 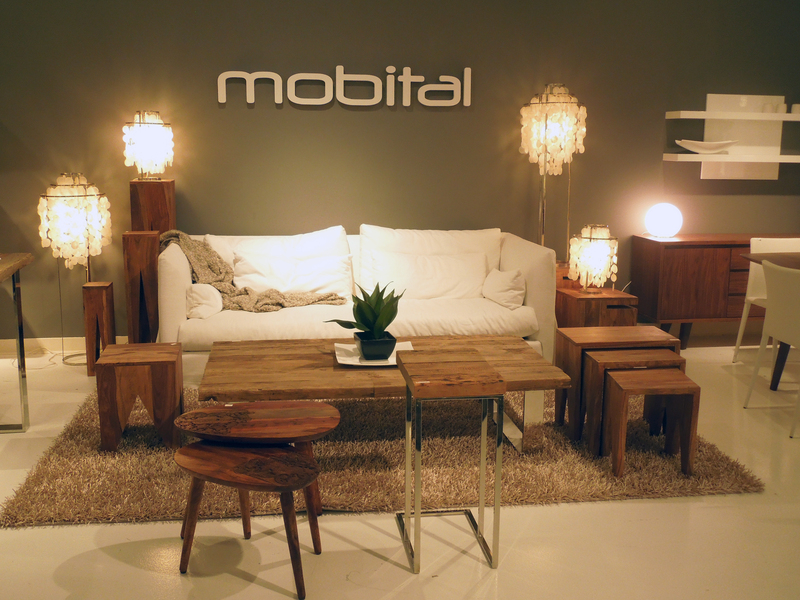 So here is a collection of interesting lighting that I hope will inspire you. 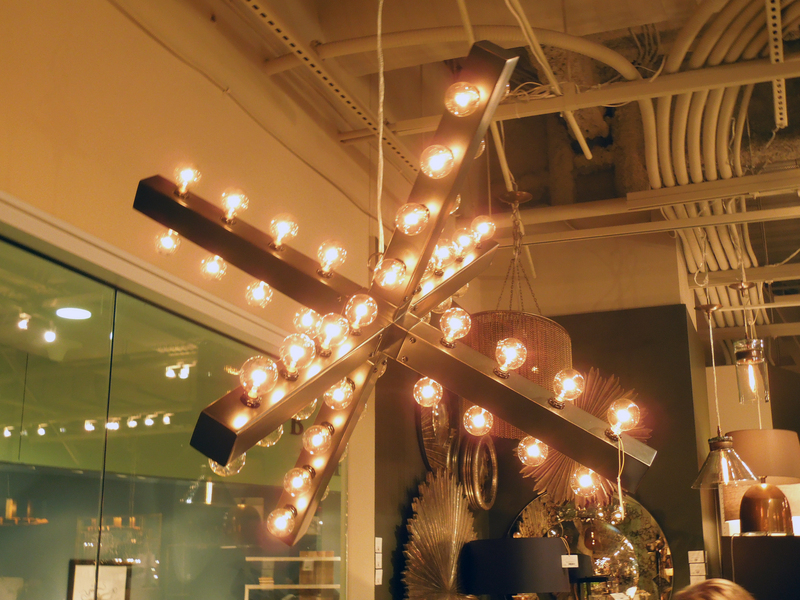 This chandelier is part modern sculpture, part theatrical marquis. 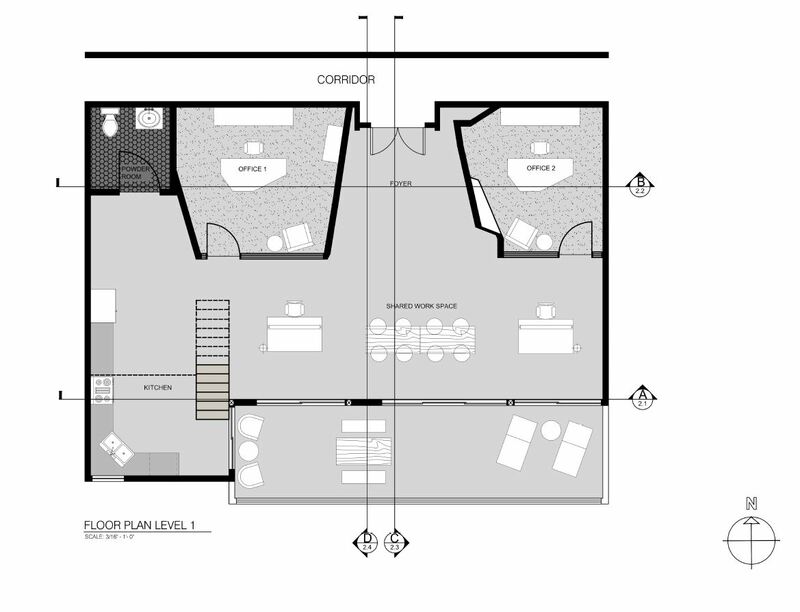 It could be really interesting in a large, open loft space. This is kind of a more organic version of the light above. I love the little globes around each tiny light bulb. 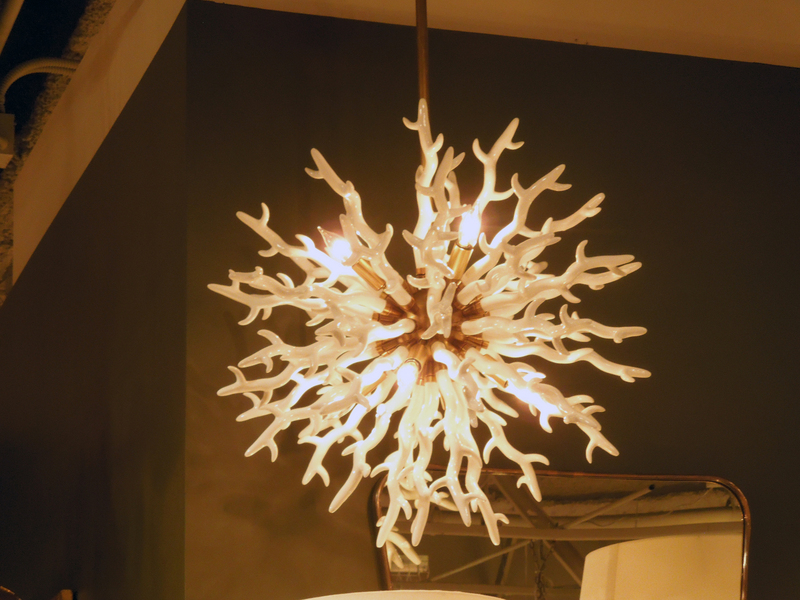 These pendant lights remind me of fireworks! 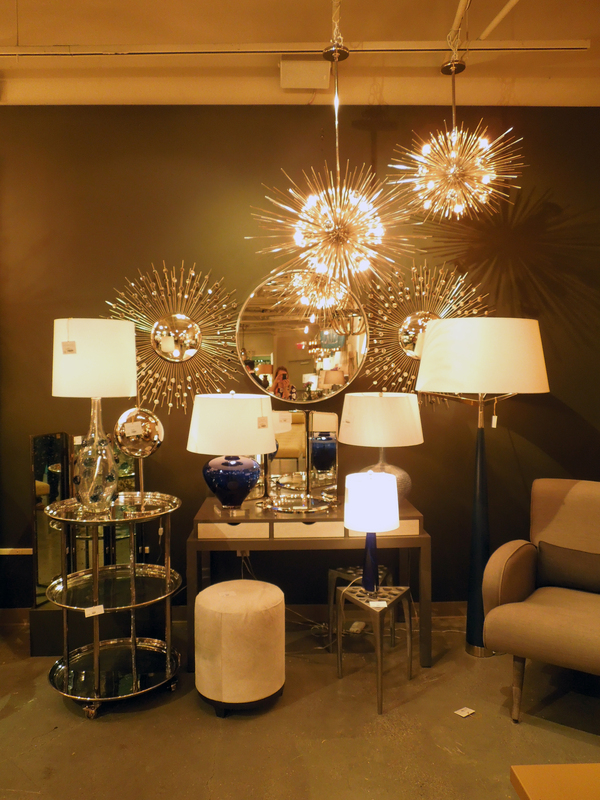 I love this whole vignette, with the firework-like pendant lights reflected in the mirrors on the wall behind, both in literal reflection and in similar shapes. 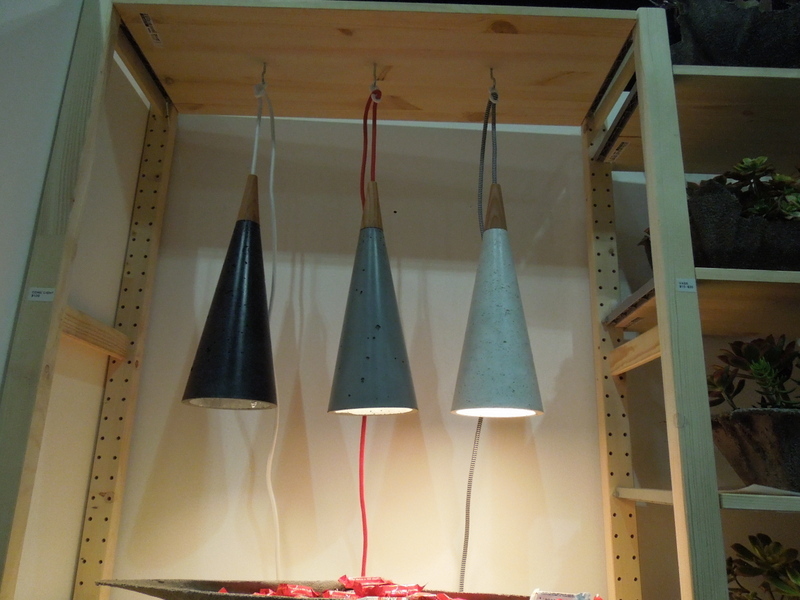 These pendant lights are also firework-like, but much more mid century modern. They’re striking and sophisticated, but still very playful. Probably the most interesting use of these antler-shapes that I’ve seen. 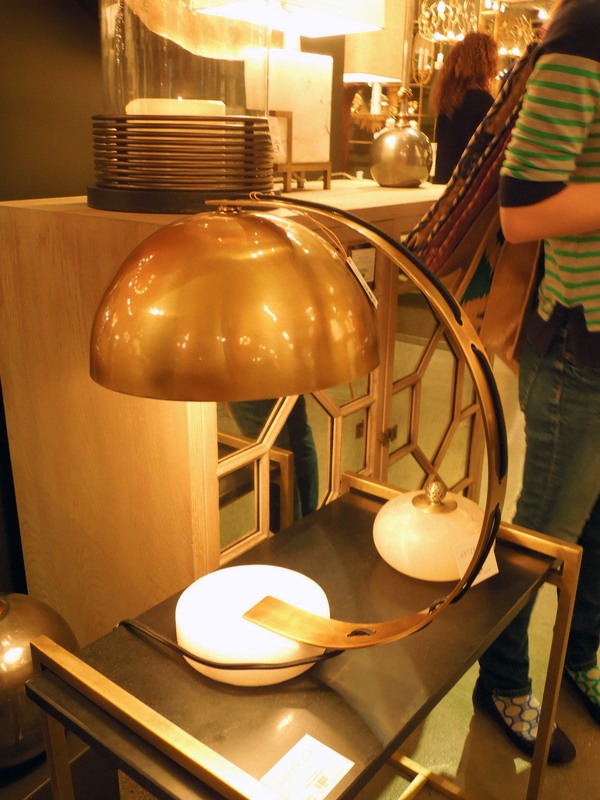 This task light is a little modern, a little art deco. Kind of reminds me of the Rocketeer! 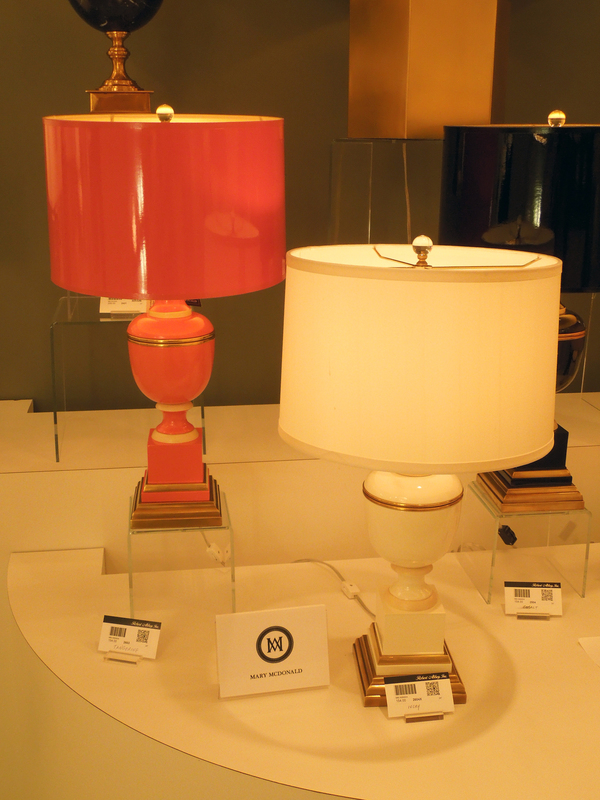 I love these little table lamps, and especially that they come in a variety of colors! These are also great little lamps. Notice the inverted, open design of the one in the middle. 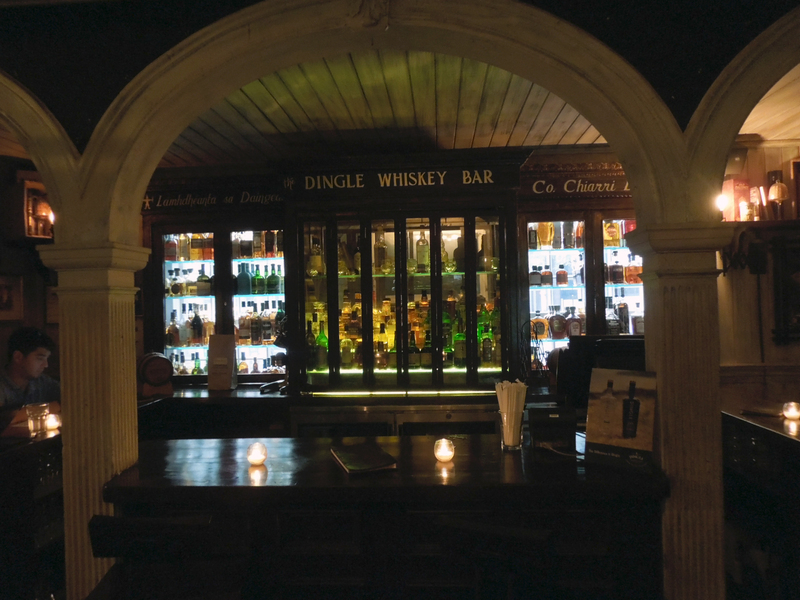 On a more traditional note, I do love this style of light as well. 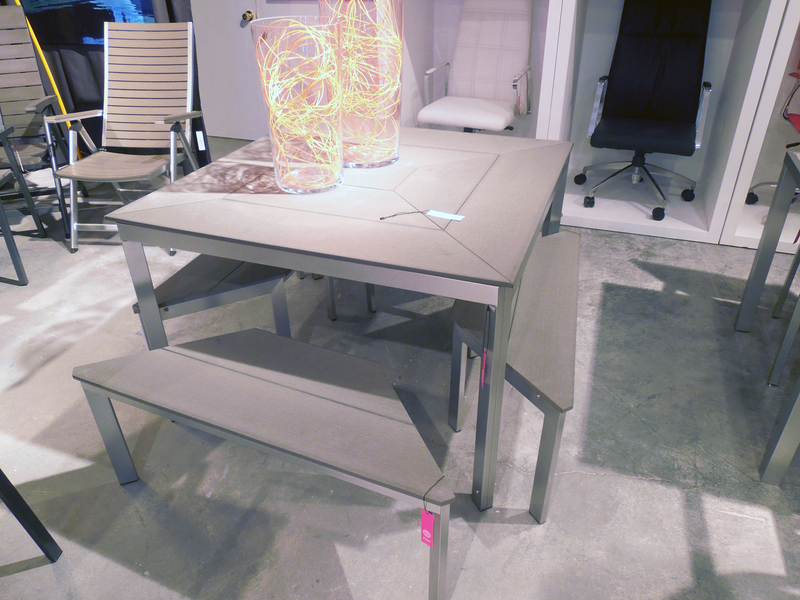 The combination of polished metal and linen shade are very sophisticated. 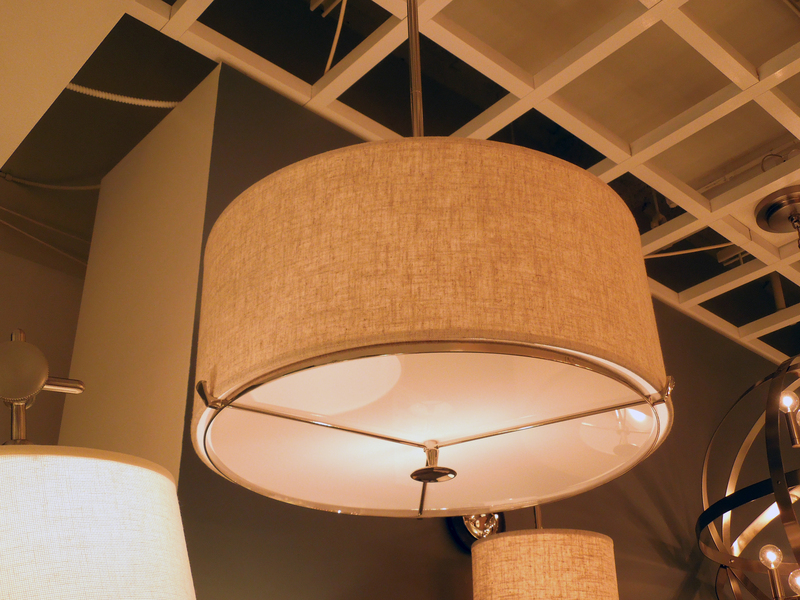 This could be a great light for a formal dining room. 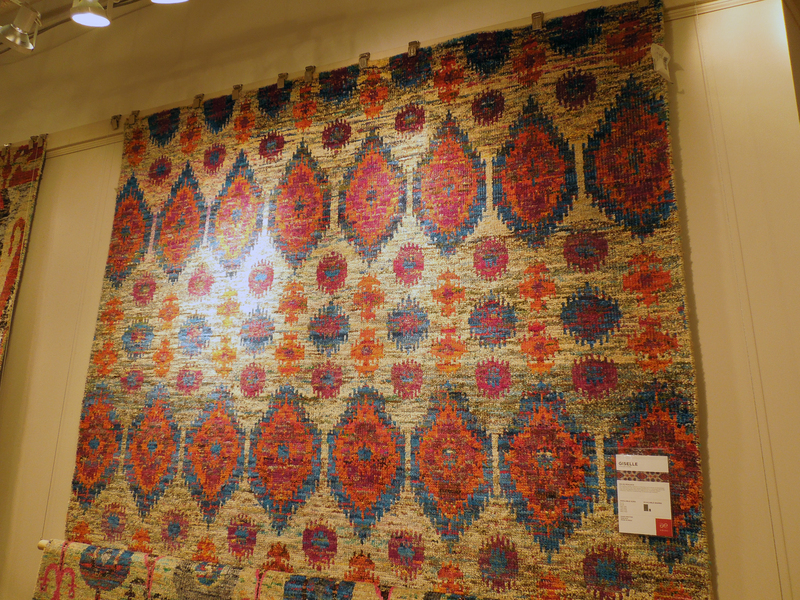 I like this one as well, maybe for a living room. (I’m considering it for my own!) 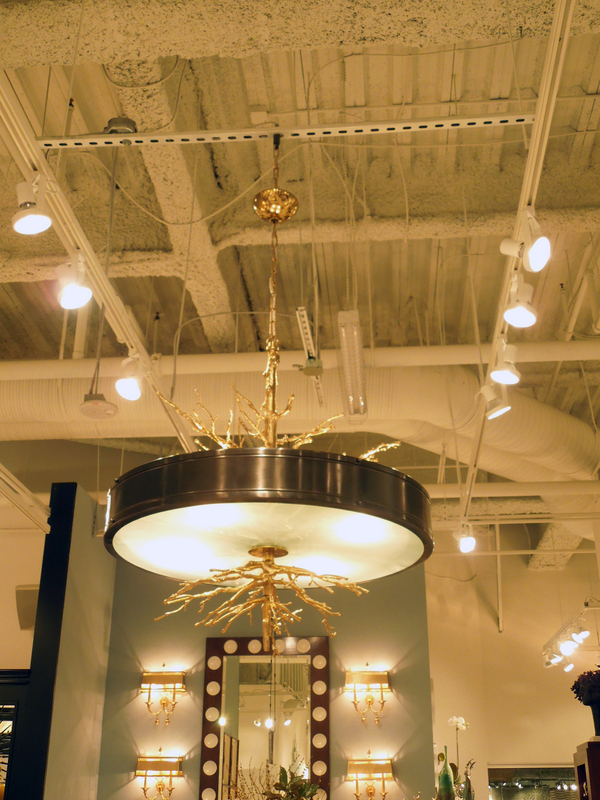 This light immediately caught my attention when I walked into this showroom. Such an interesting use of the organic tree branch shapes. I love that the branches are bright gold. 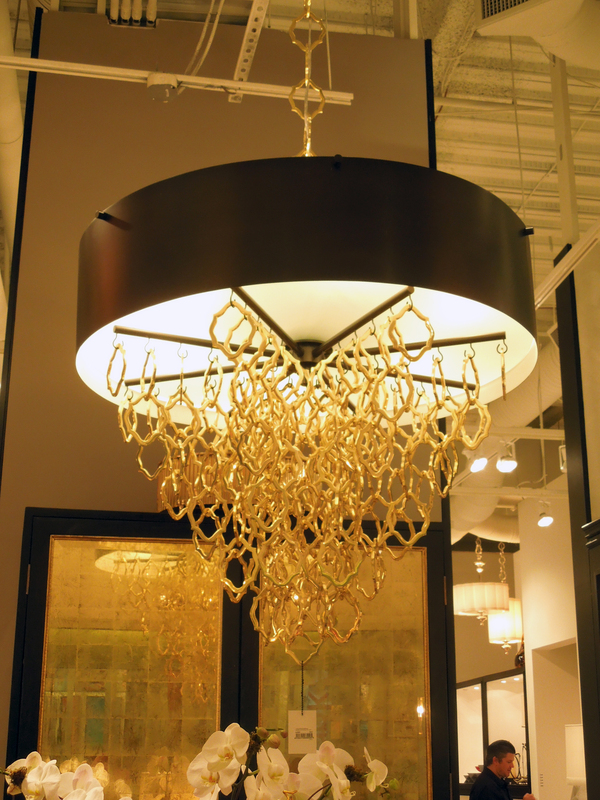 And this one is like fabulous jewelry for your lighting. 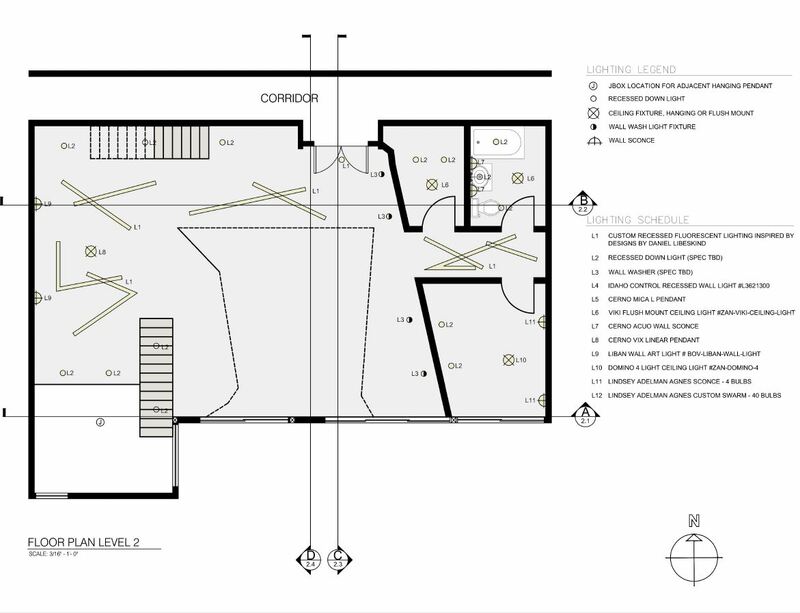 Talk about making your lighting the central piece of a room! 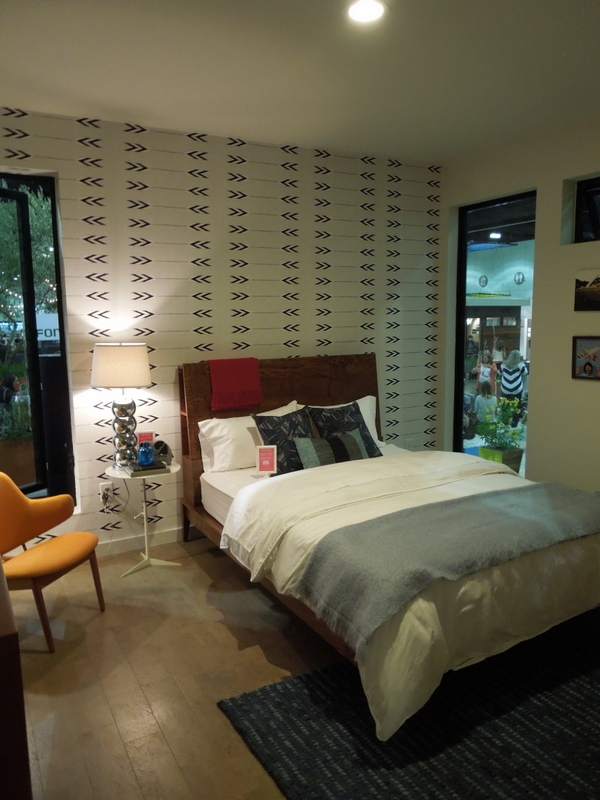 I hope you enjoyed seeing some of my favorites from the Las Vegas Market. 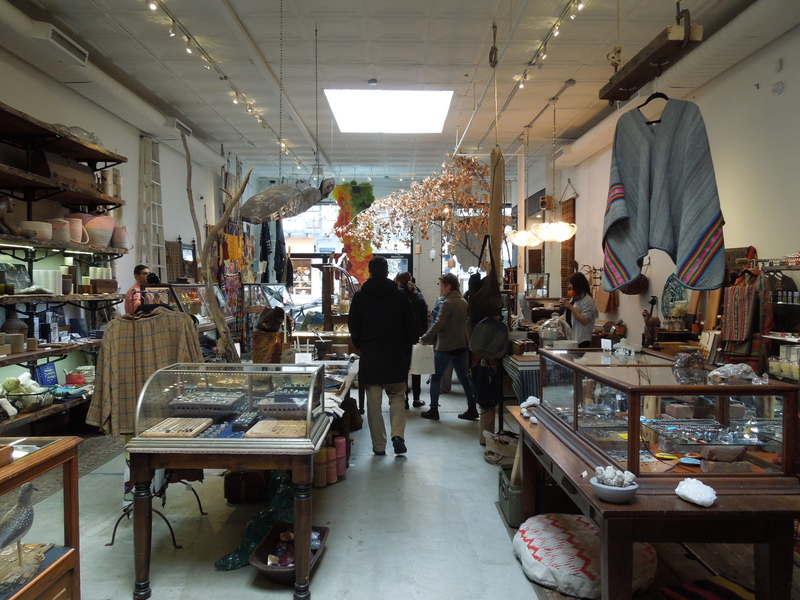 Next week, one of my favorite shops to visit in New York’s SoHo. 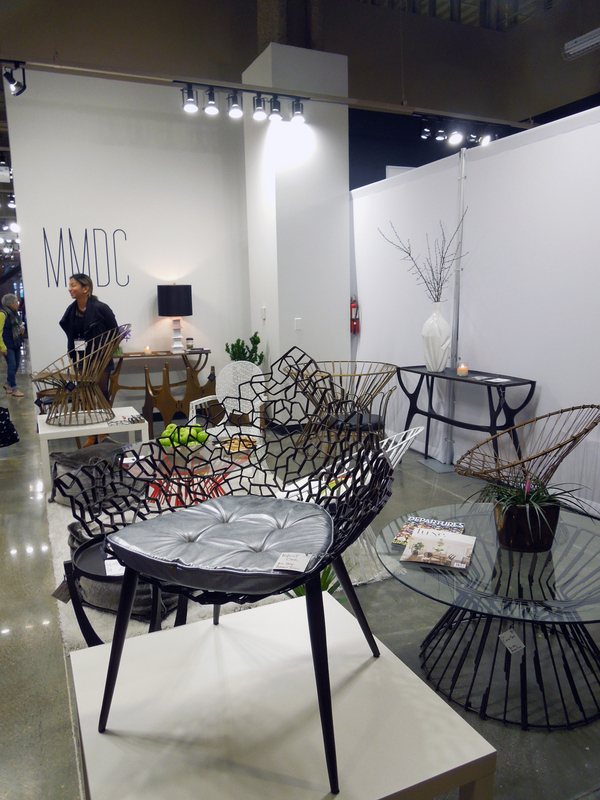 Since I came across so many things I loved at the Las Vegas Market, and I didn’t want to cram them all into one post (because who has the time to read a post that long) today I’m featuring furniture (not seating) and accessories. 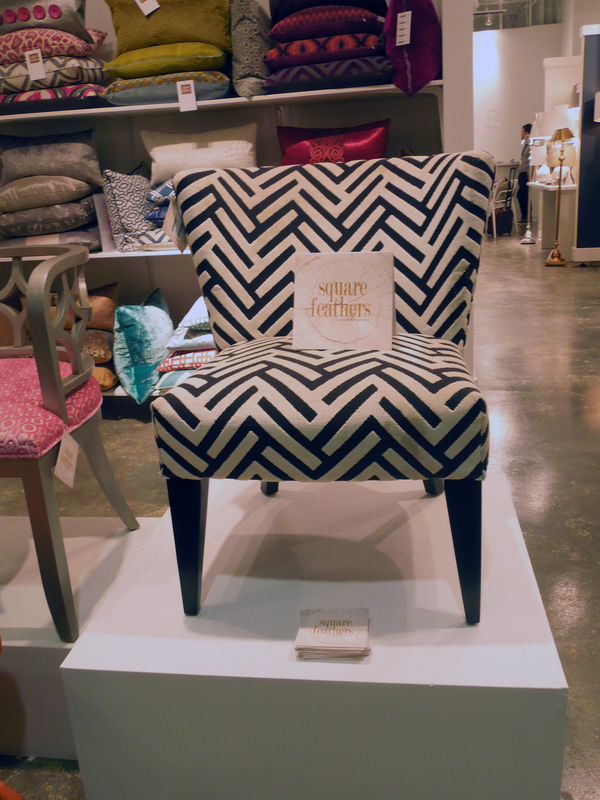 The first showroom we wandered into was full of Jonathan Adler accessories. 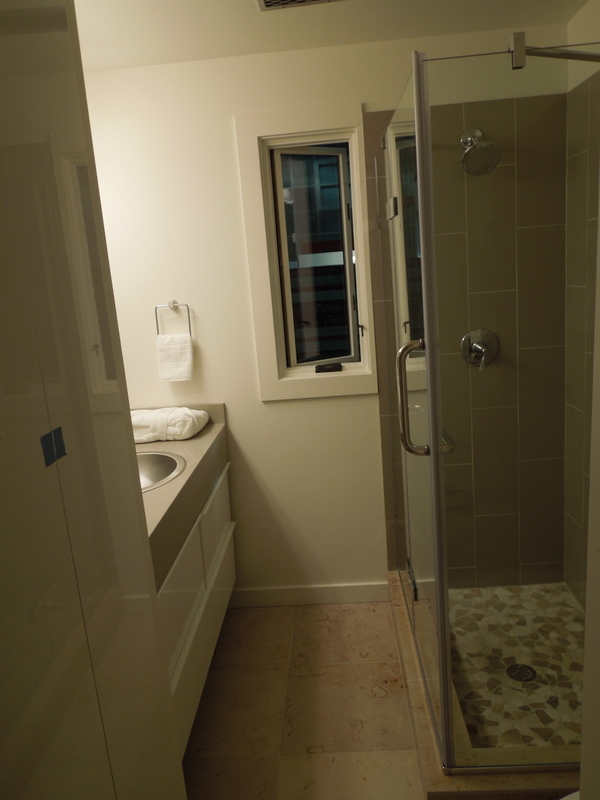 (We even saw a few items that were used in our hotel rooms at the Cosmopolitan.) I love these modern interpretations of some of our favorite animals. 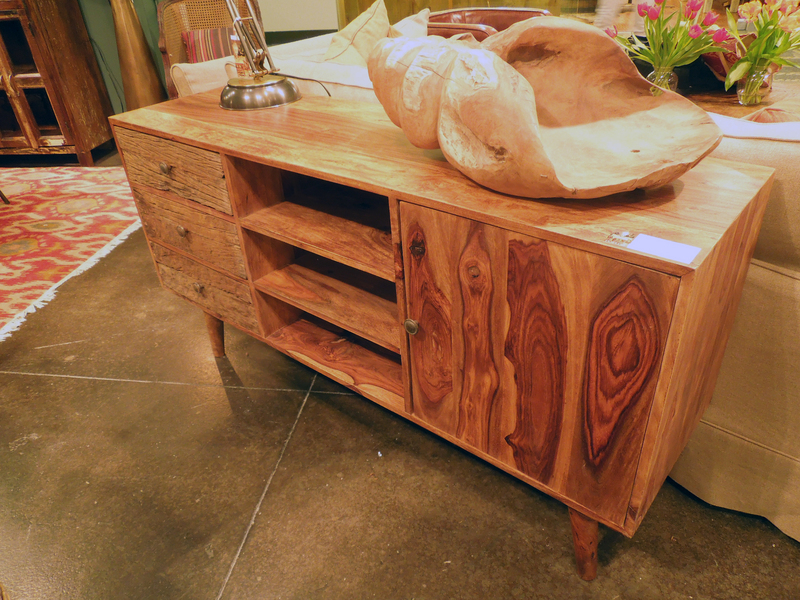 I am a total sucker for anything made with natural wood grain on display for all to see. 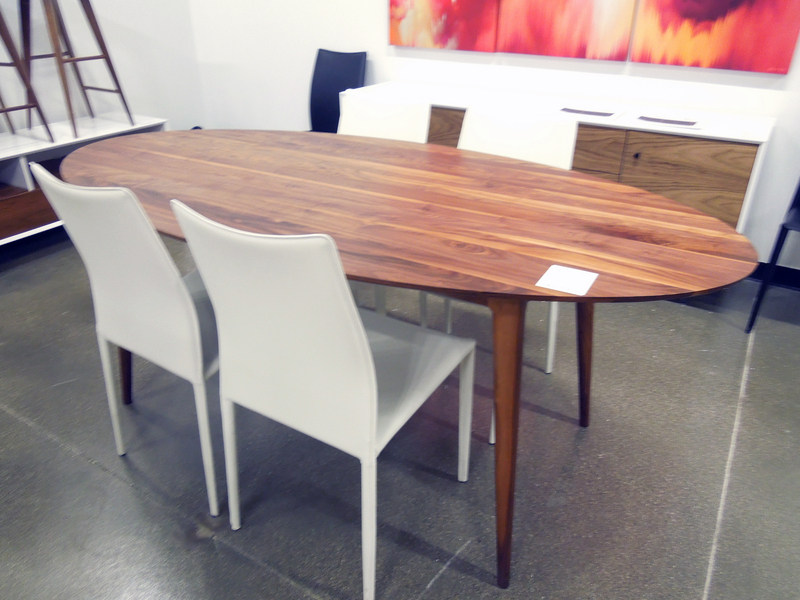 This is a great dining room table for spaces on the smaller side. 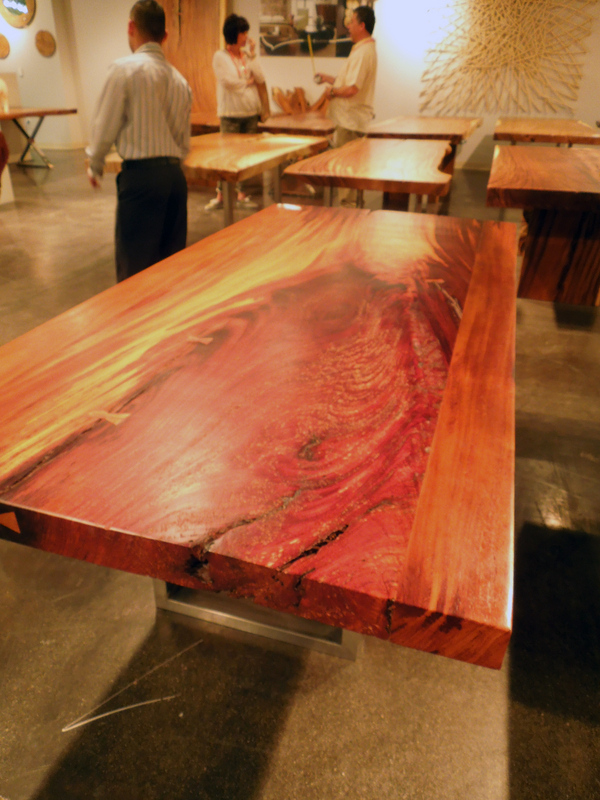 Speaking of natural wood grain, this showroom was full of it. And they took it one step further: a lot of the pieces here had one or two edges that looked as though someone had sliced a tree and left a side unfinished. I loved this detail about these tables. 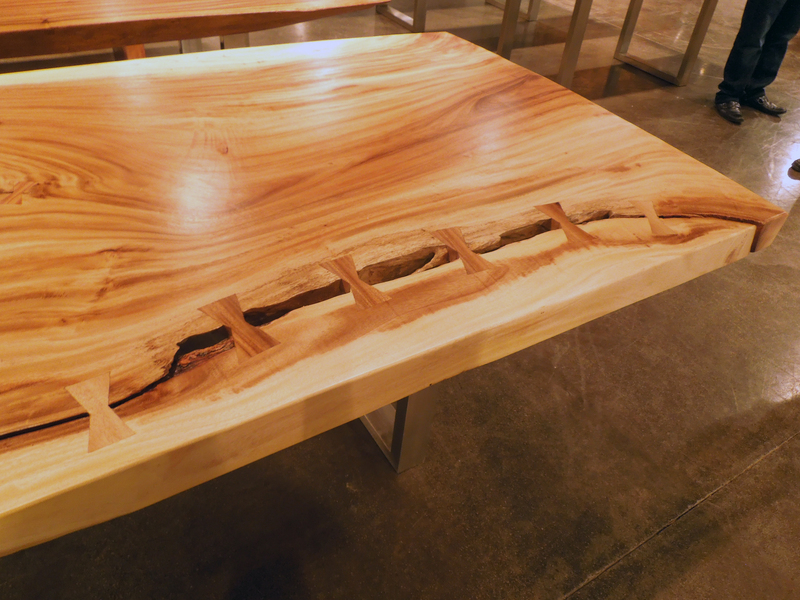 They also used these little butterfly notches in all their tables, which doubled as structural reinforcement and aesthetic design detail. I think this chair is so interesting and organic looking. Probably not the most comfortable, but definitely a conversation piece worth having in the right space. These are paper! Not cut to look like this, just made like this. 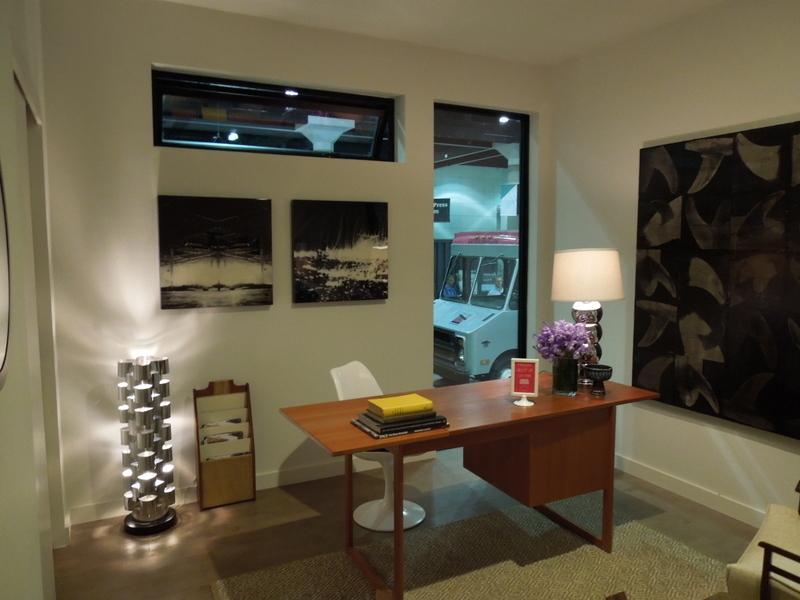 The showroom rep suggested them as room dividers or artwork. Very cool. 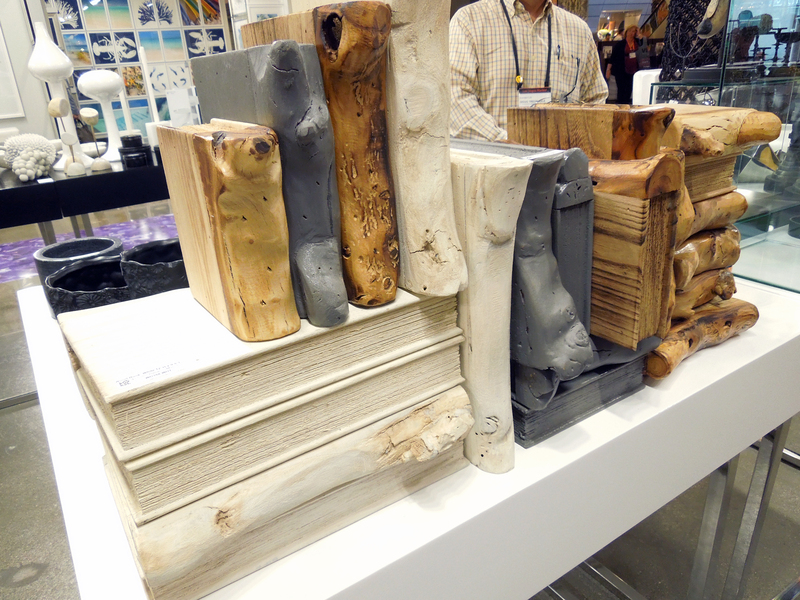 How about these books carved from wood? 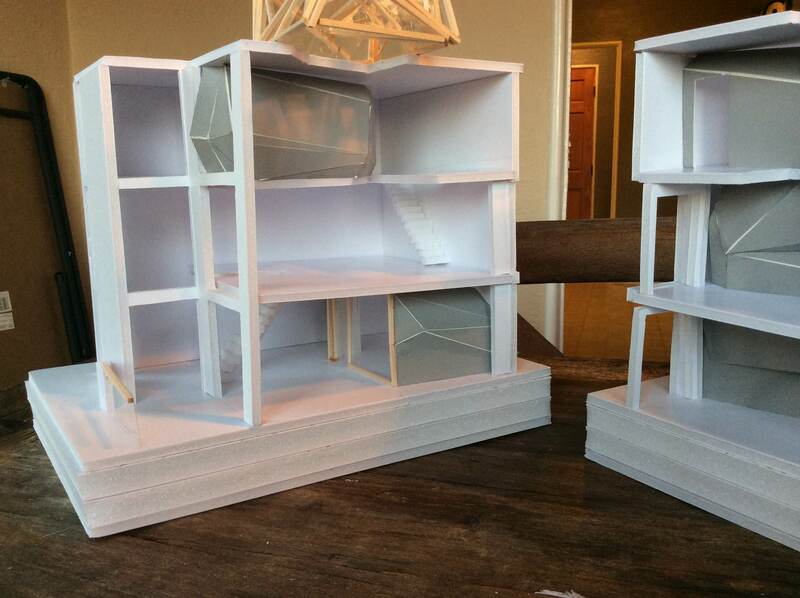 They don’t open, but would still look awesome on display in a living room or home office. 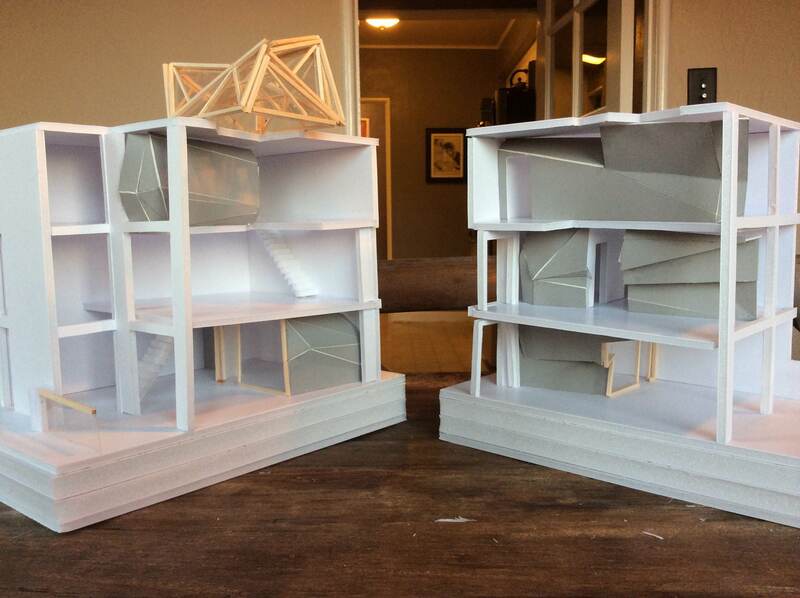 These sculptures are great modern pieces for a mantle or large bookcase. 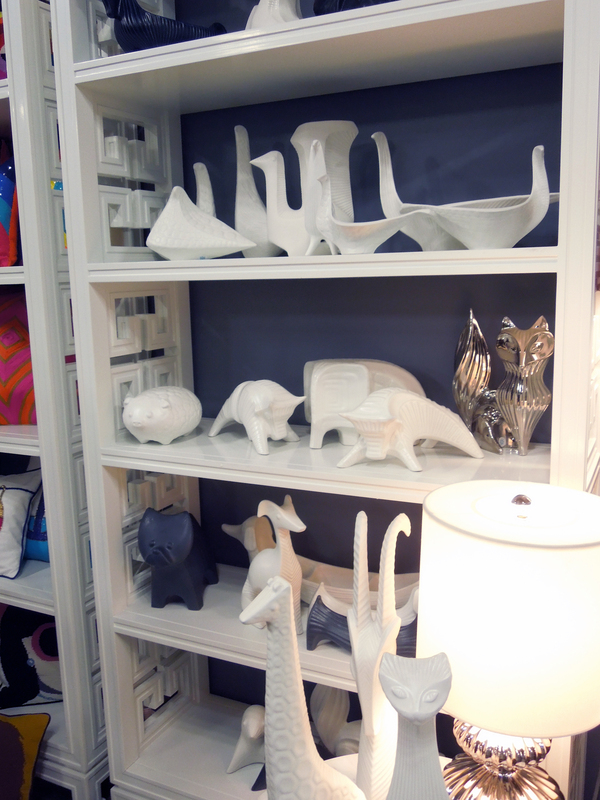 More accessories to love, especially the combination of white and gold in the shelves on the left. 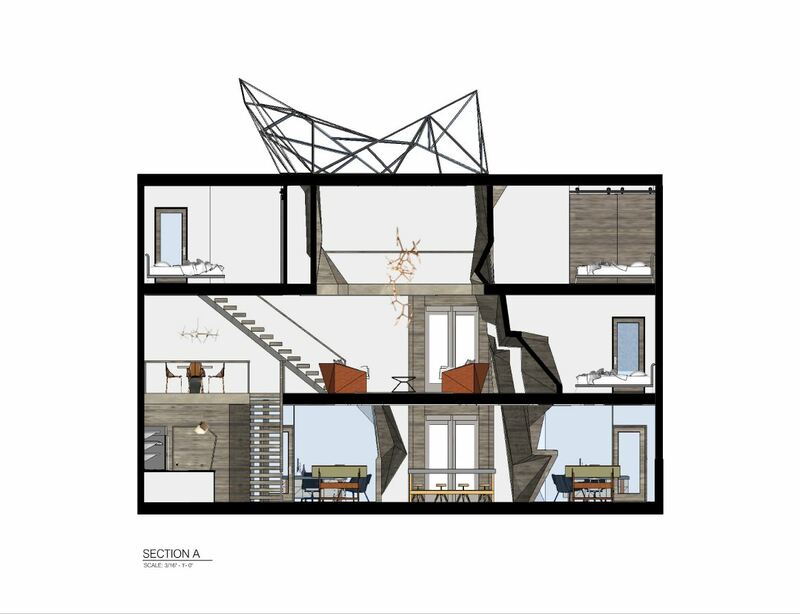 And don’t you just love that rhinoceros pillow on the right? Sometimes it’s the simple things done well that get me excited. I thought this grouping of pillows was a well curated collection of shapes and patterns. Cow hide? No, it’s wood! 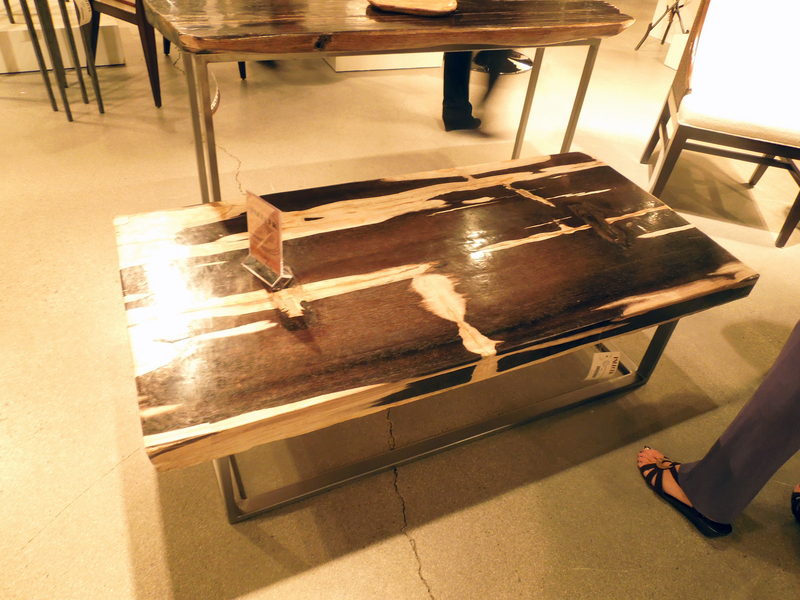 So striking, I love the high contrast wood grain. 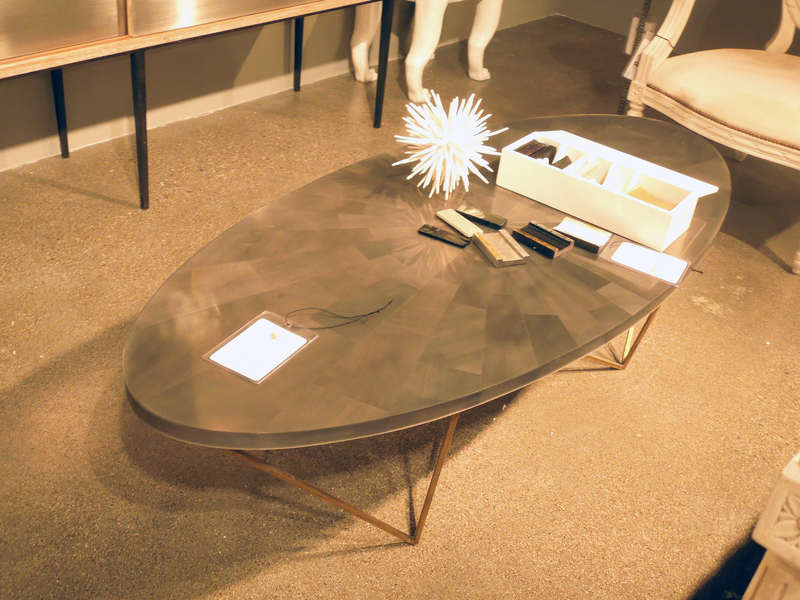 This photo does not do this table justice. 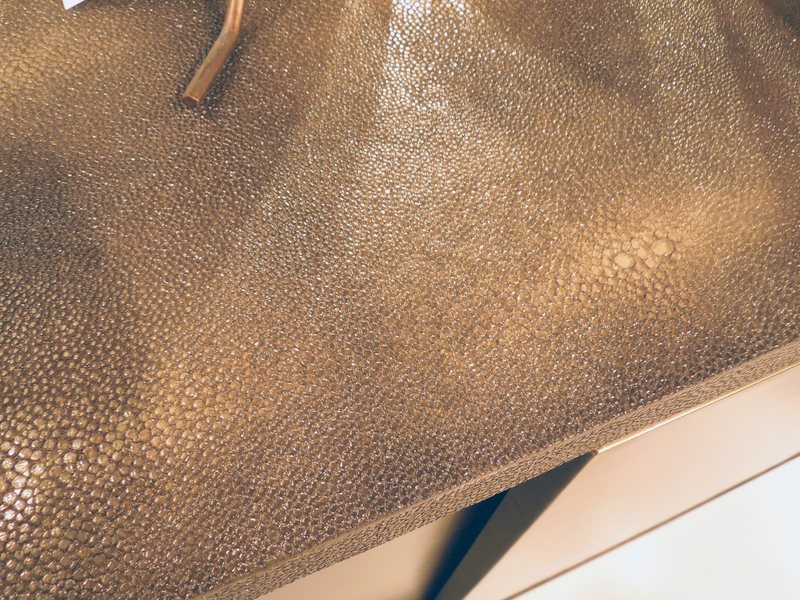 It is a shimmery silvery metallic with some kind of layer of acrylic over top. It felt like it would be very durable, yet it looks so delicate. 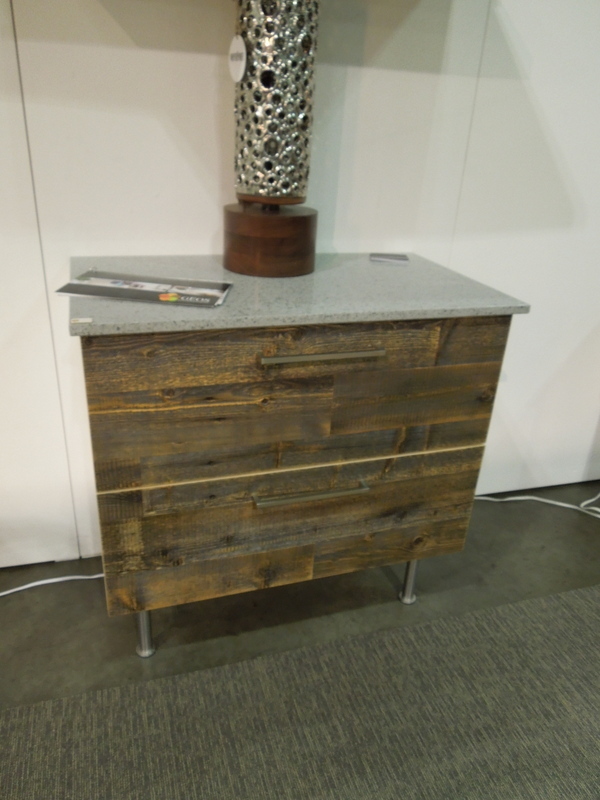 This credenza is so unique, with metal sliding doors and circular handles the best part is in the next photo… Just look at the texture! This material covered the frame on all sides. This is more or less the headboard I want in my bedroom at home. (Hopefully soon!) 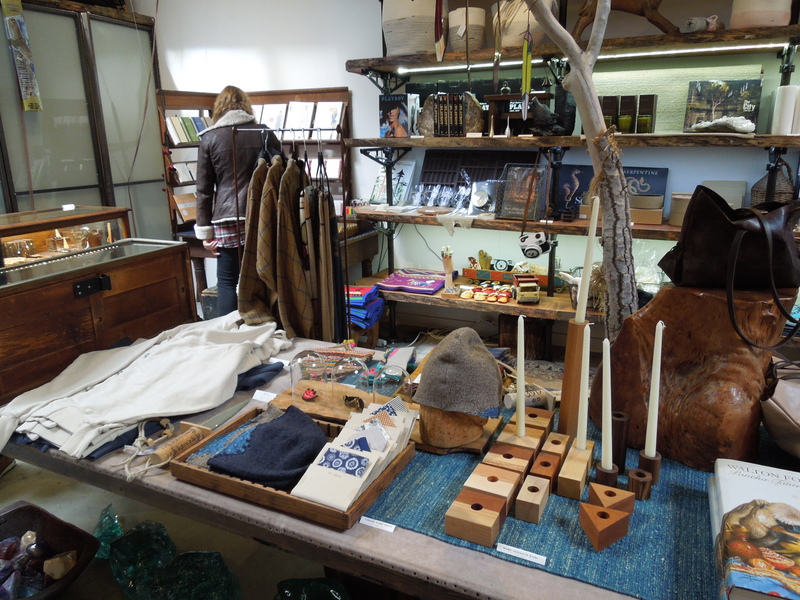 There were a few vignettes I really enjoyed at the Market, like this one. It just looks so cozy. 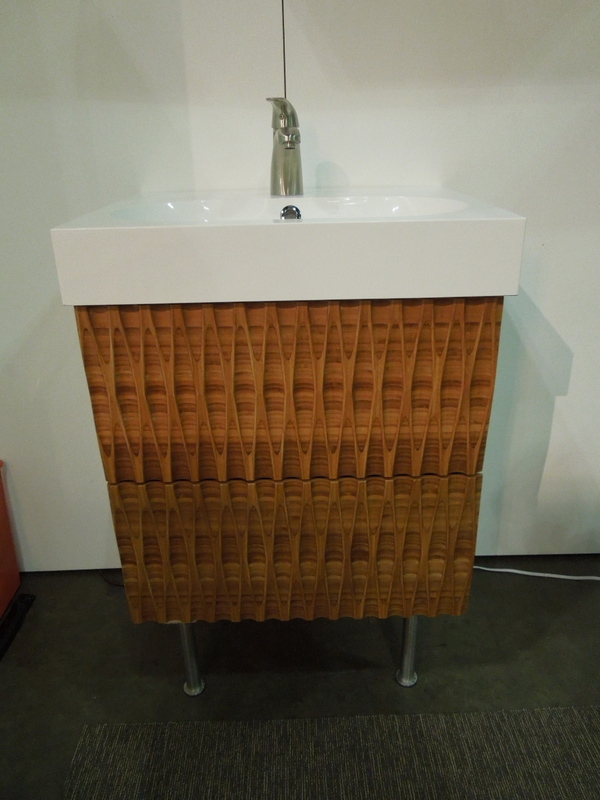 Again with my love for natural wood grains, and the unexpected use of chrome I mentioned last week. This combination of wood and lacquer is really interesting, and actually reminded me of a wood and marble cheeseboard my sister gave me for Christmas. 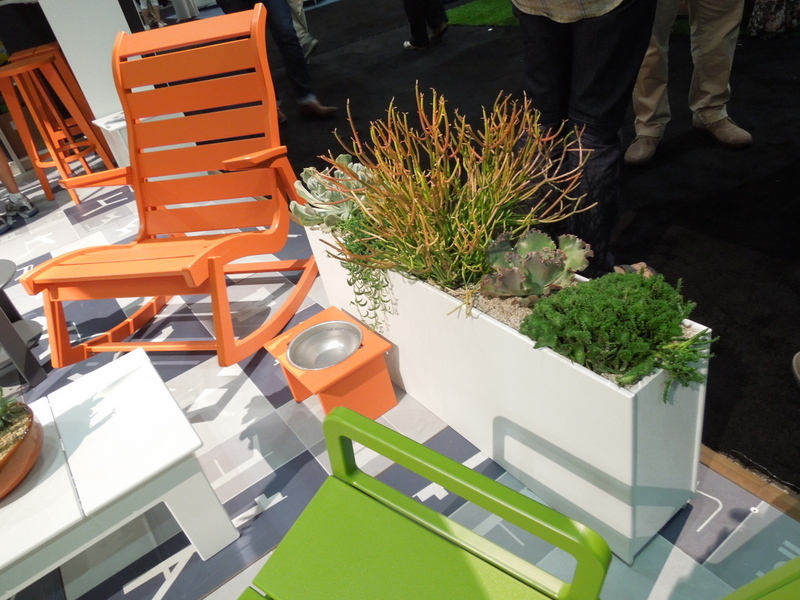 What a great outdoor dining solution for a small space, like many of the small gardens and patios here in LA. 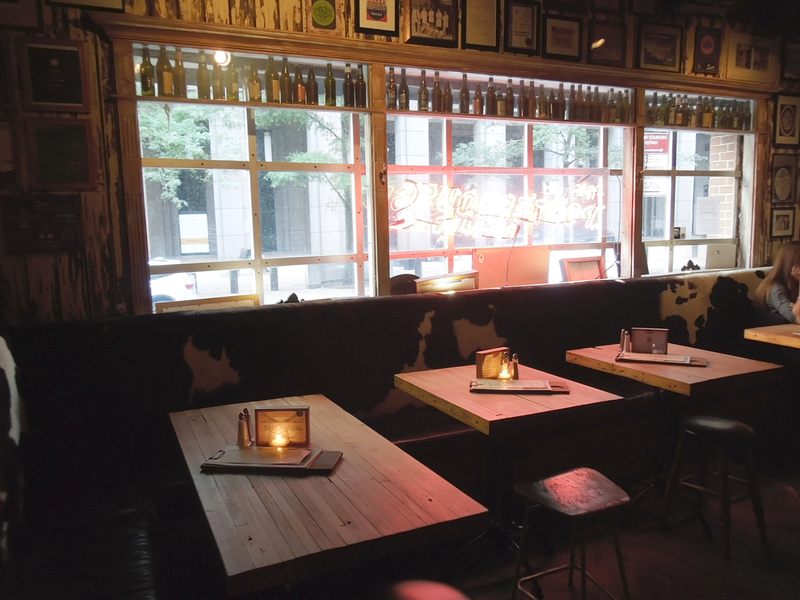 The benches mimic the pattern on the table top, and they tuck under the table perfectly like puzzle pieces. 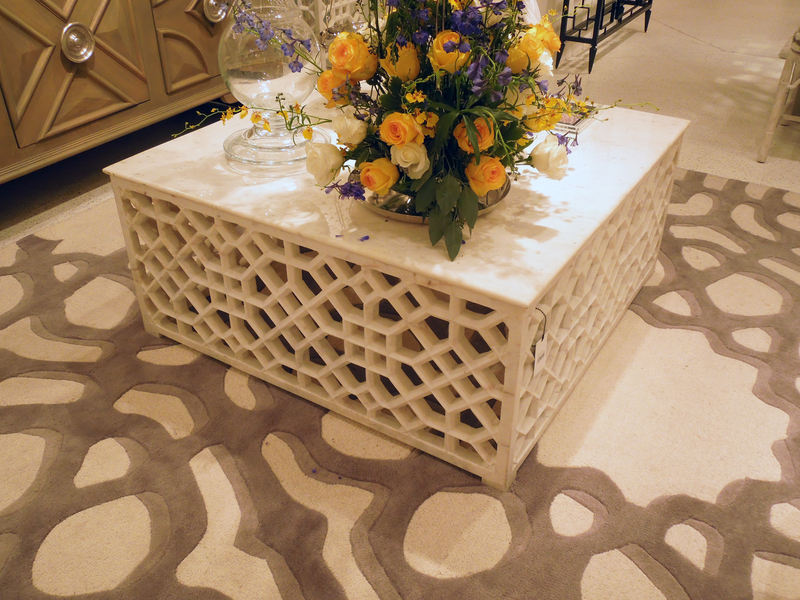 I LOVE this bold area rug!! Now, where can I put it? 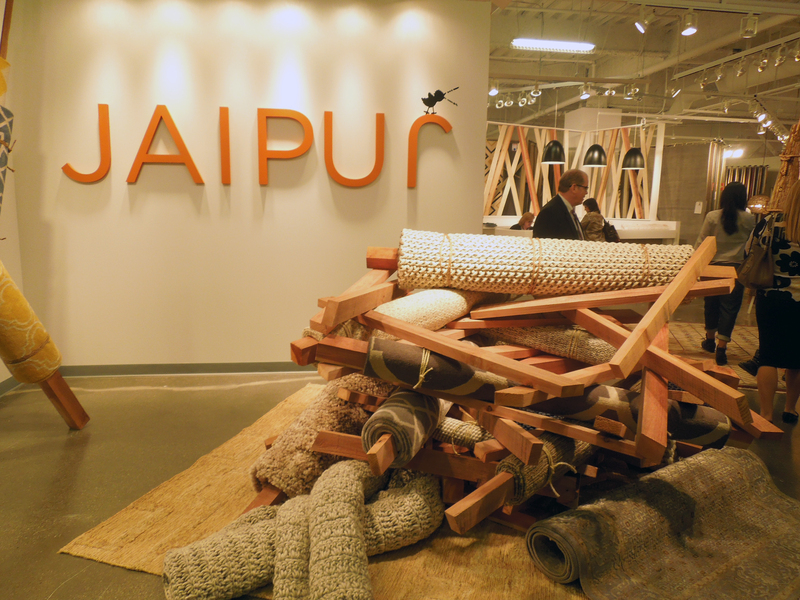 Another fun vignette, at the entrance to the Jaipur rug showroom. 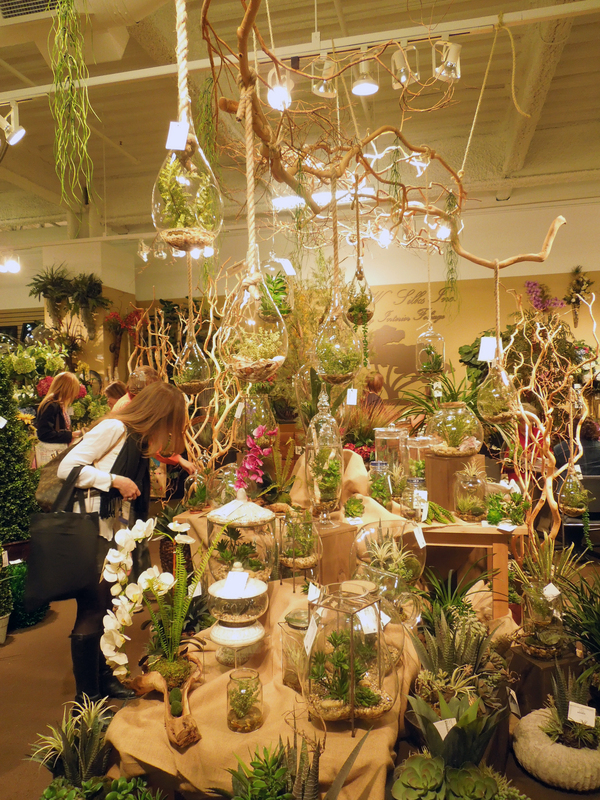 These plants may all be fake, but lent plenty of inspiration for the real thing. I would love to have a little collection of these hanging planters, maybe with some air plants or succulents. Books at an angle are so much more interesting than books straight up and down! 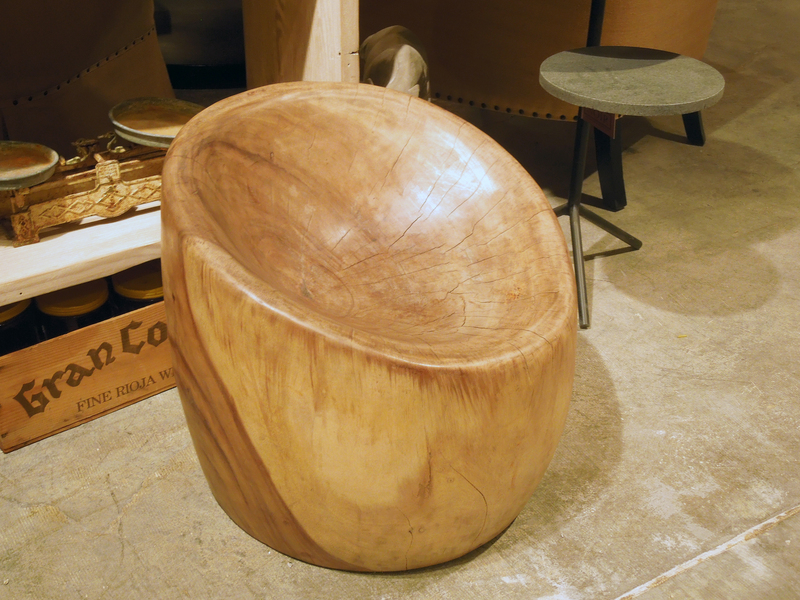 This tree trunk stool looks like it would be surprisingly comfortable. 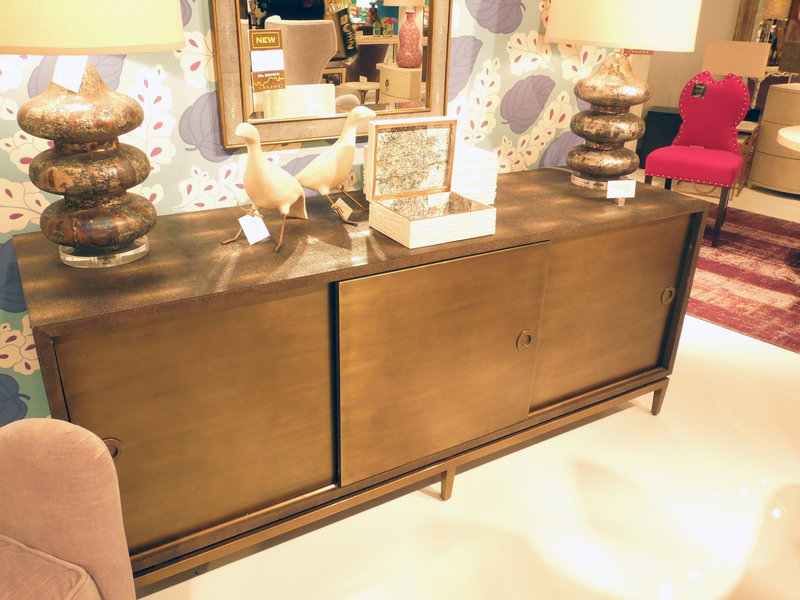 This media cabinet is so pretty. 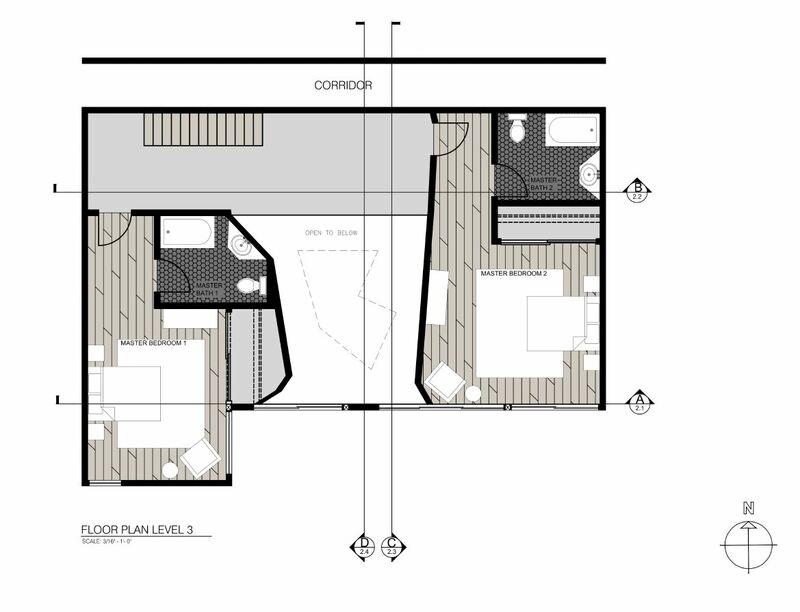 The shape is definitely a little mid century modern. But there’s also an element of unfinished or reclaimed wood on the left, and beautiful finished natural wood grain patterns on the right. So, I did a double-take on this one. It is literally made entirely of carved marble! I’m guessing it is incredibly heavy to transport. 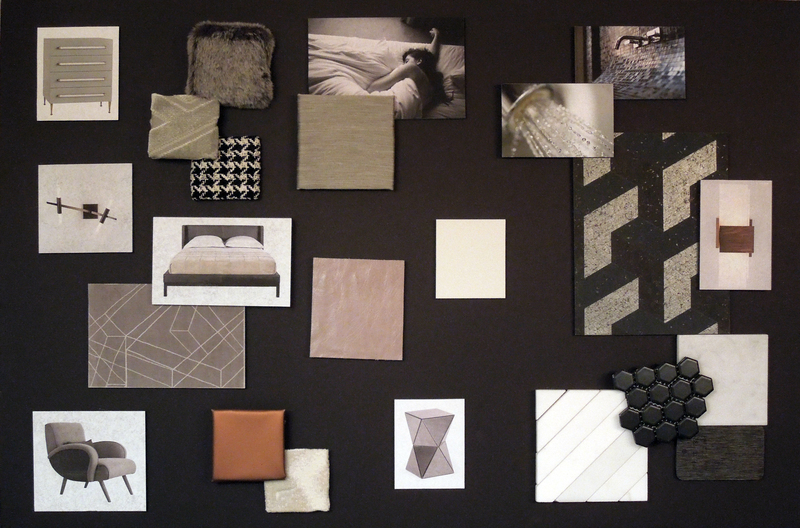 A little glamour for the bedroom. 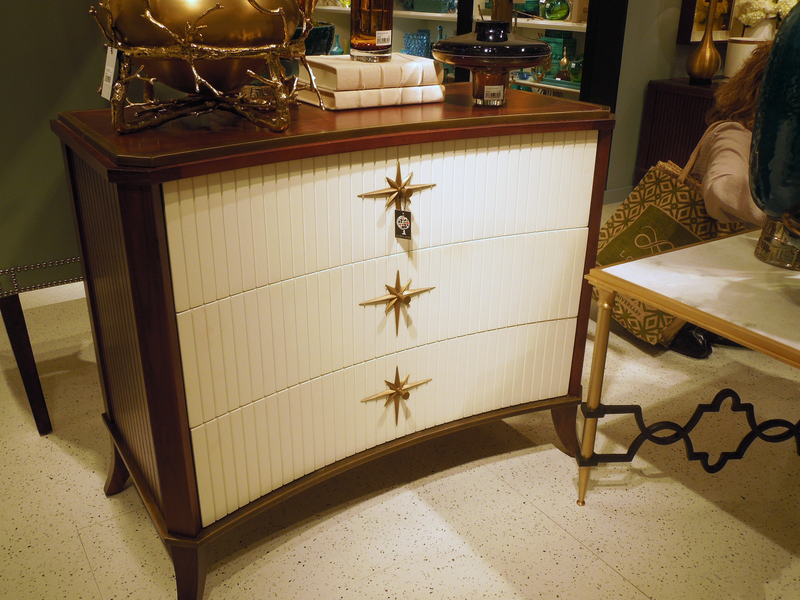 I love the gold star knobs and the combination of te dark wood frame and white drawers. Next week it’s all about lighting, so stay tuned! What was your favorite piece this week? What were you surprised by? 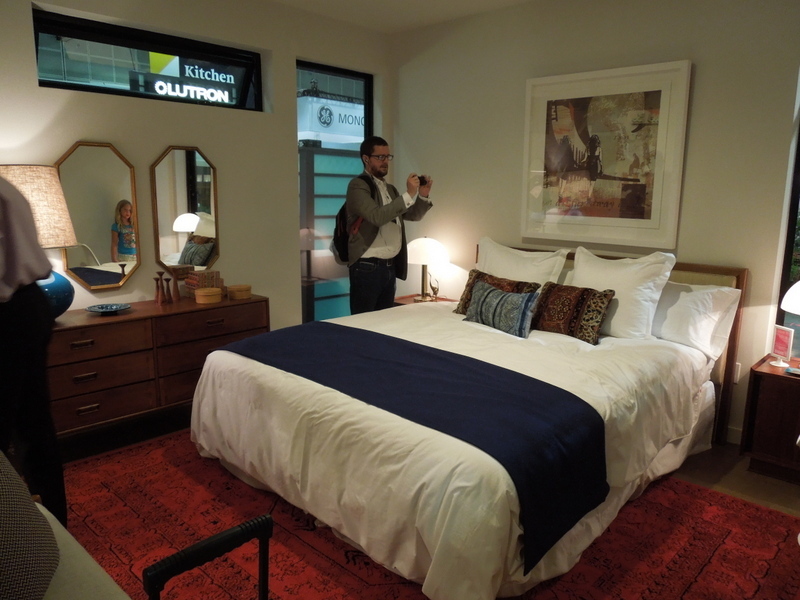 Last week, I had the pleasure of heading to the Las Vegas Market with my co-workers to see the latest in furnishings and home decor. 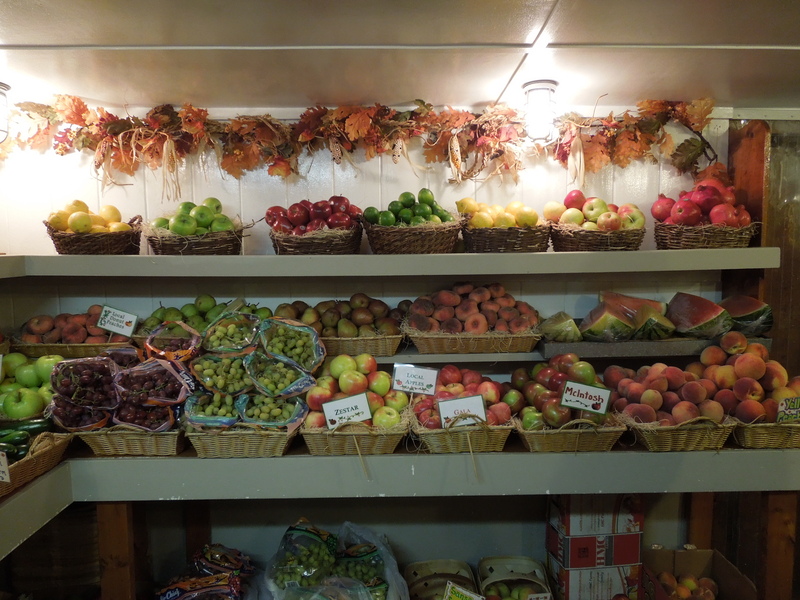 This was my first trip to the Market, and it was enormous! There was so much to see, and admittedly we barely scratched the surface. 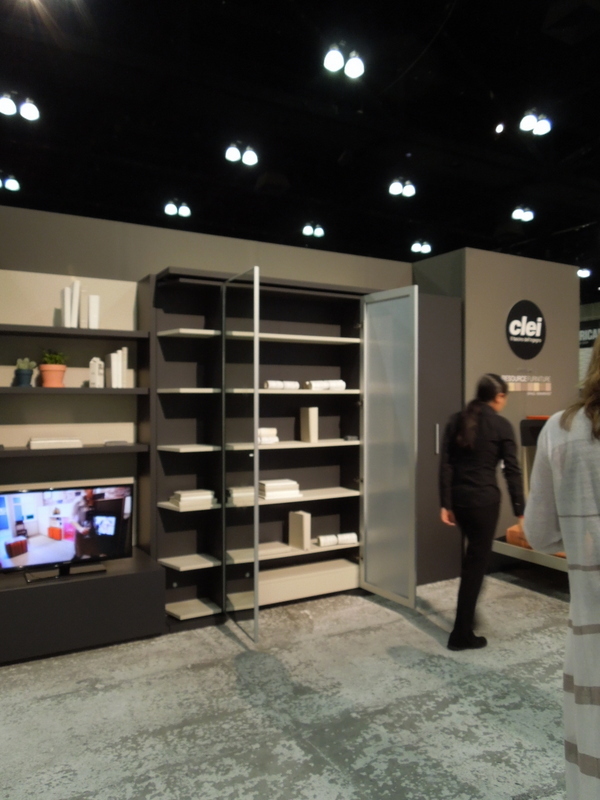 With our limited time there we had to be strategic and mainly focused on the vendors and manufacturers we use frequently, with the goal of seeing what’s new this year. 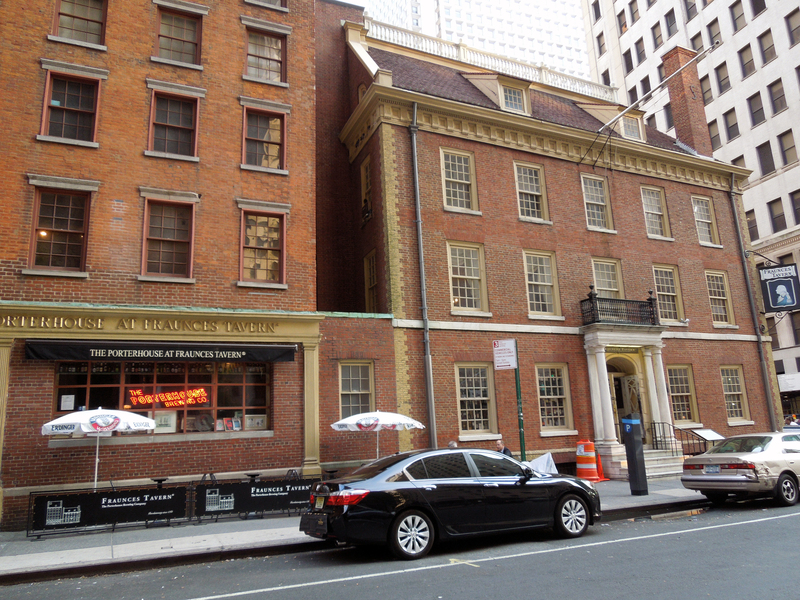 Since there was so much to see, and so much I want to share with you, I’ll spit it up into three posts. 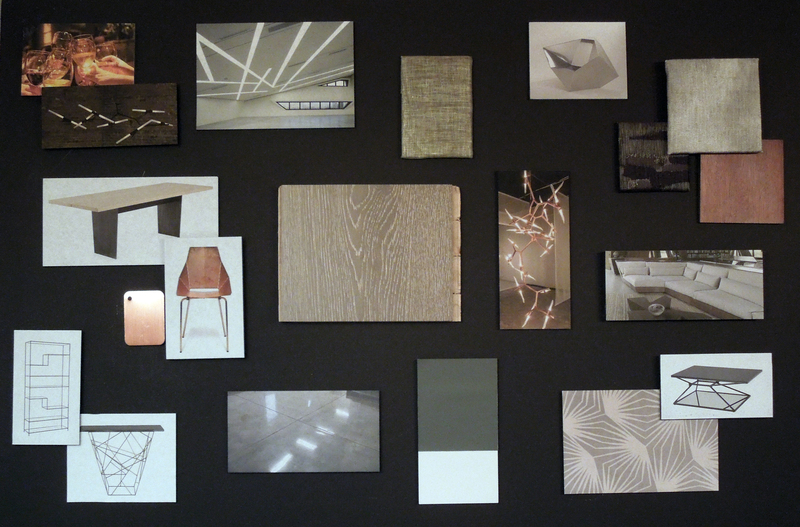 This week, the focus is on seating. Here are some pieces I found unique, interesting, or that I just really liked a lot (in no particular order). 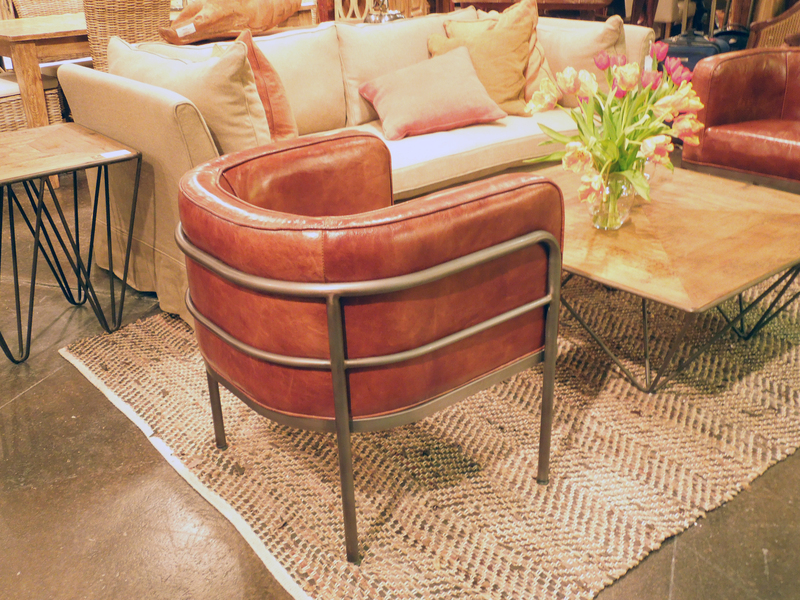 I like the wrap-around metal work on this cozy club chair. 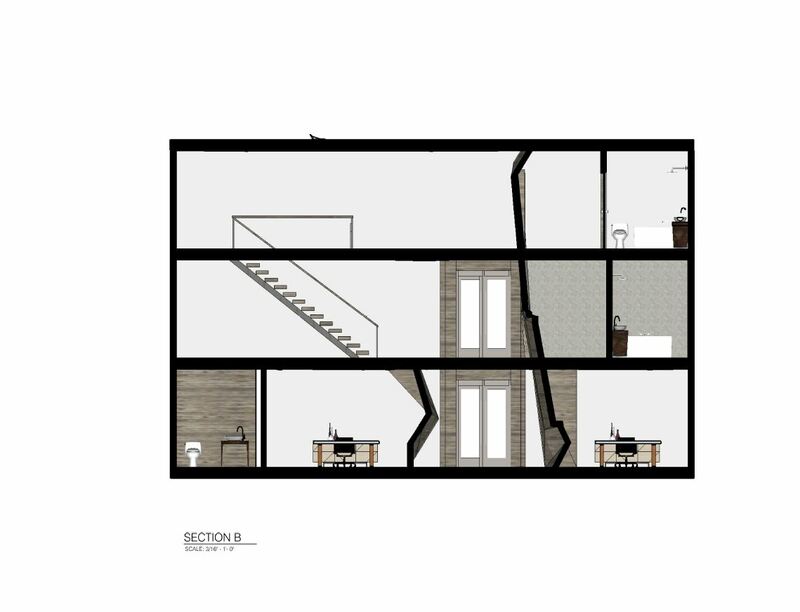 Plus, it’s not a huge chair, and since a big city like LA has plenty of small spaces, it’s the perfect size for a space like our little house, or really any of the apartments we’ve lived in here. 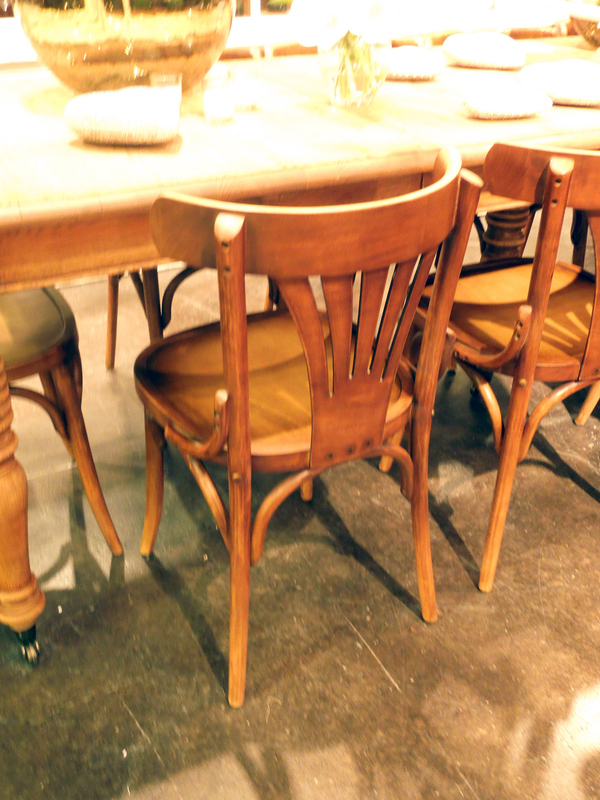 I love the design of the wood on the back of this dining chair, and combined with the exposed screws and bolts holding it together it feels a little like the arts and crafts movement and yet a little bit modern industrial. 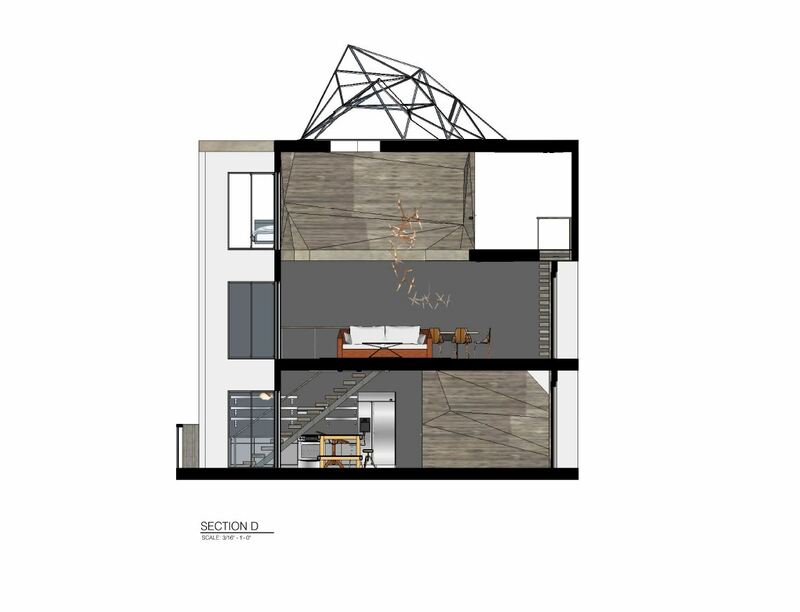 This is an industrial take on a mid-century modern classic. 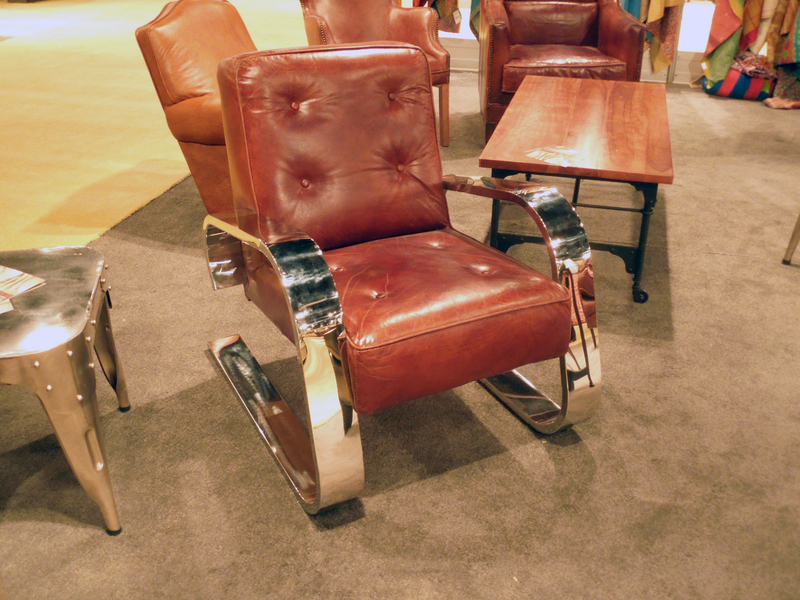 The metal prongs on the back of the chair remind me of leather belts. 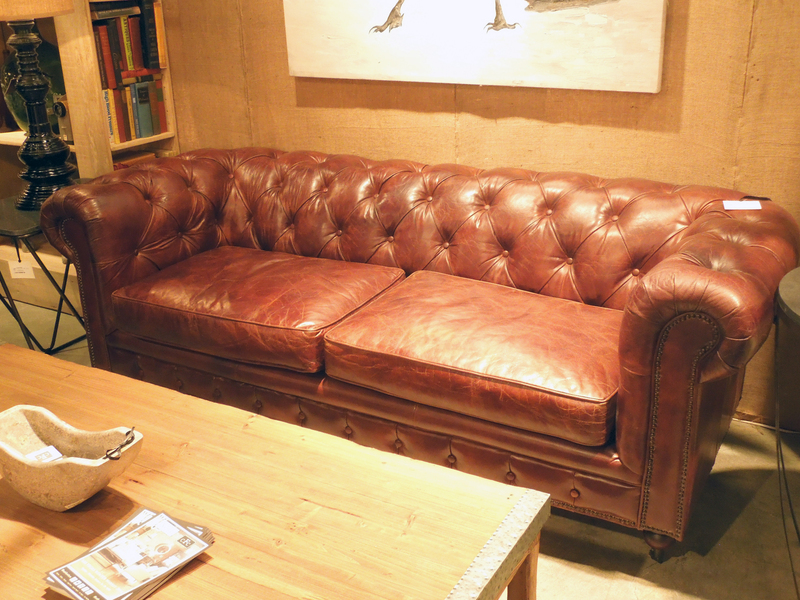 Who doesn’t love a good ol’ chesterfield sofa? The leather here looks a little pre-weathered, which I love. 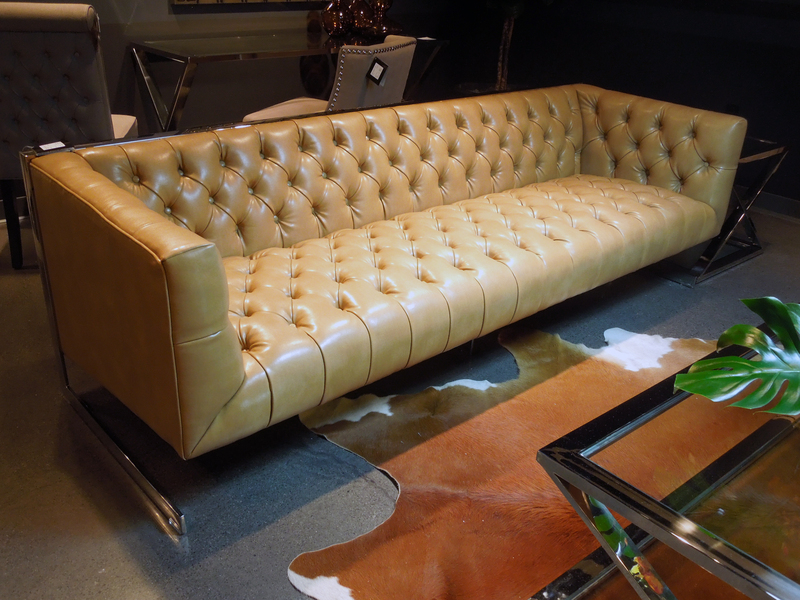 And speaking of chesterfield sofas, is this not a gorgeous interpretation of a classic? We were all dying over how beautiful this sofa is. The leather is gorgeous, the upholstery is perfect, and the lines of the sofa are accented with chrome from one front corner, all along the top of the sofa, and back to the front corner on the other side.The sofa is basically cantilevered over it’s base! I am often a sucker for burlap (despite a mild allergy to it that I discovered after making burlap pillow covers) so I appreciate this combination of a modern wing chair with an upholstered burlap back. 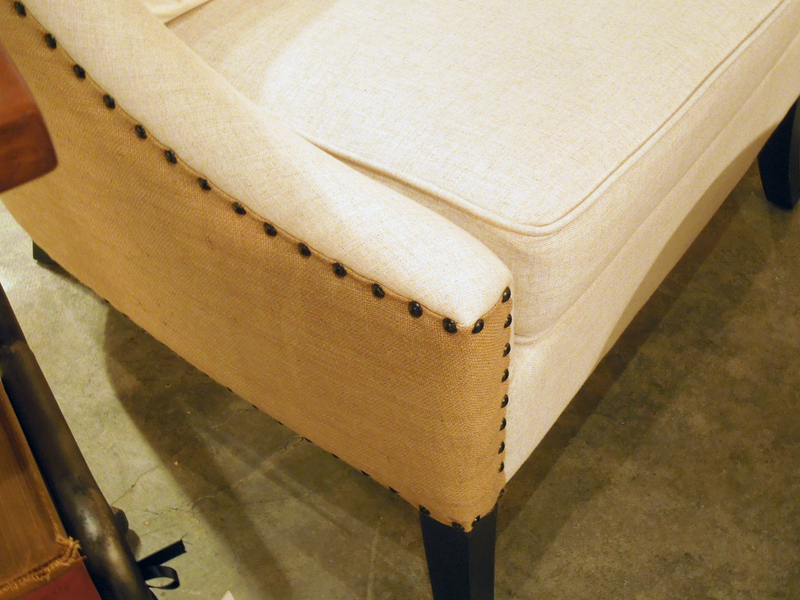 And look at how pretty the linen-look of the white fabric on the front is next to the burlap and nail heads! 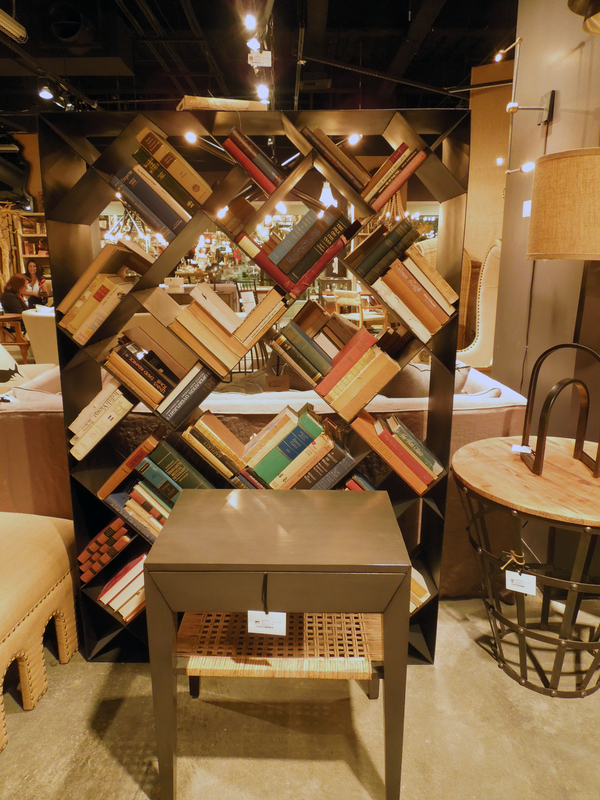 Ok, so maybe I wouldn’t put this in my house, and it might not be the coziest chair to curl up with a book on, but isn’t it interesting? A very art-house club chair, deconstructed, as though I’m looking at it with x-ray vision. 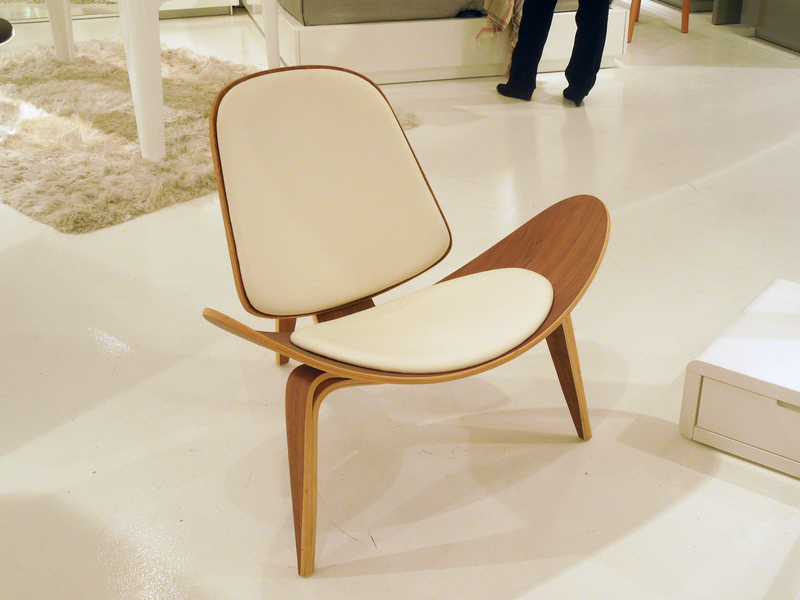 A little Danish modern, a little flying nun, there’s still something really appealing about the curves of this chair. And did you notice it only has 3 legs? 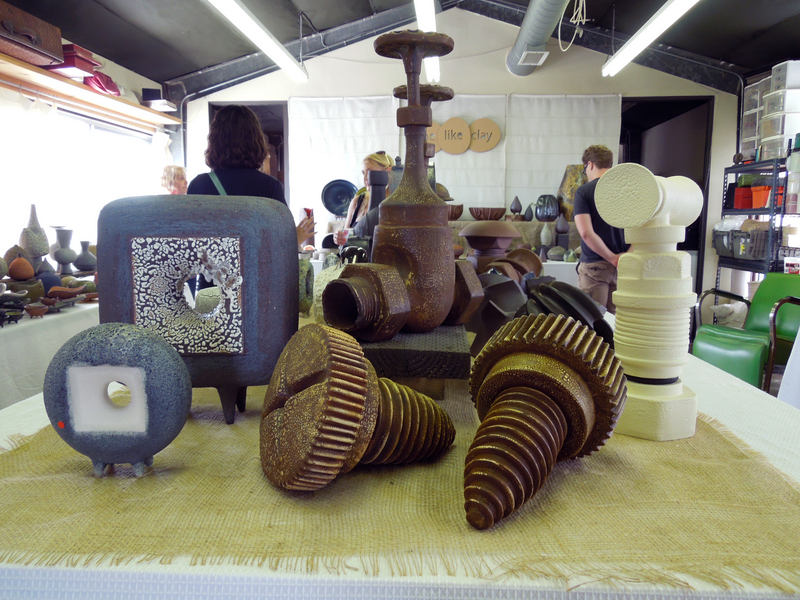 I noticed quite a few vendors at the market combining natural materials with really sleek, silvery modern elements. 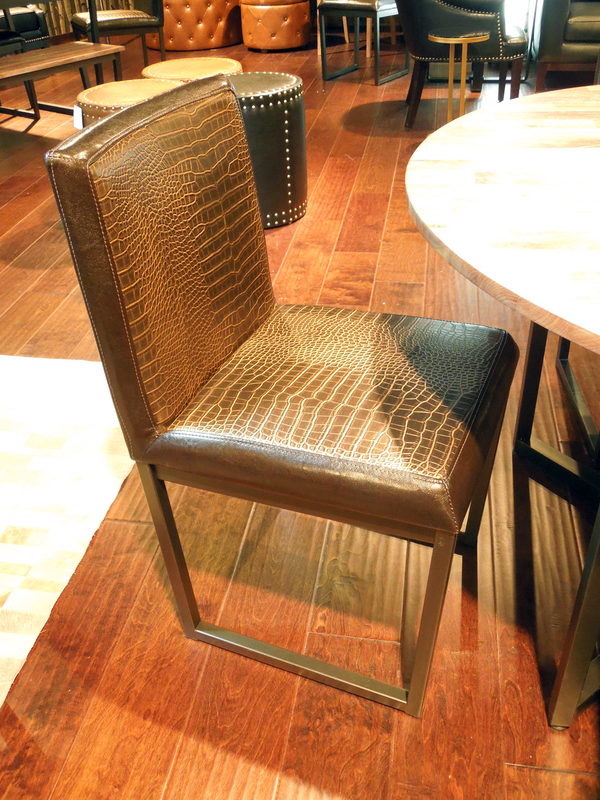 I think the alligator leather upholstery with the brushed nickel base on this chair is quite striking. 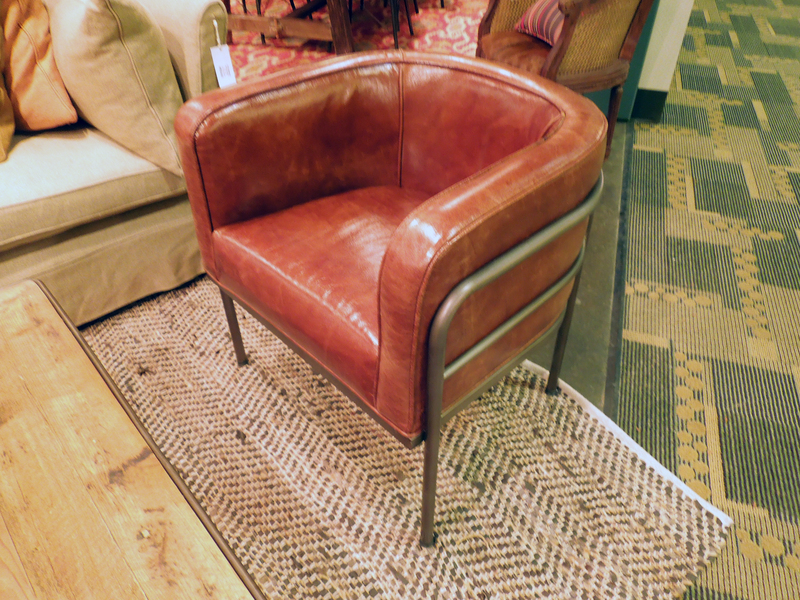 And how about the sweeping lines of chrome on this leather arm chair? 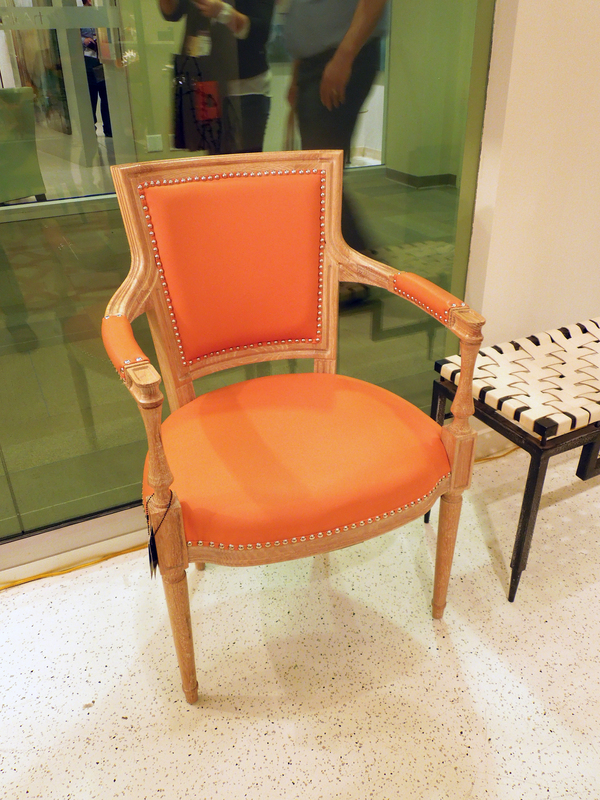 I also love the detail of the upholstery seams on the outside arms framed visually by the chrome frame of the chair. 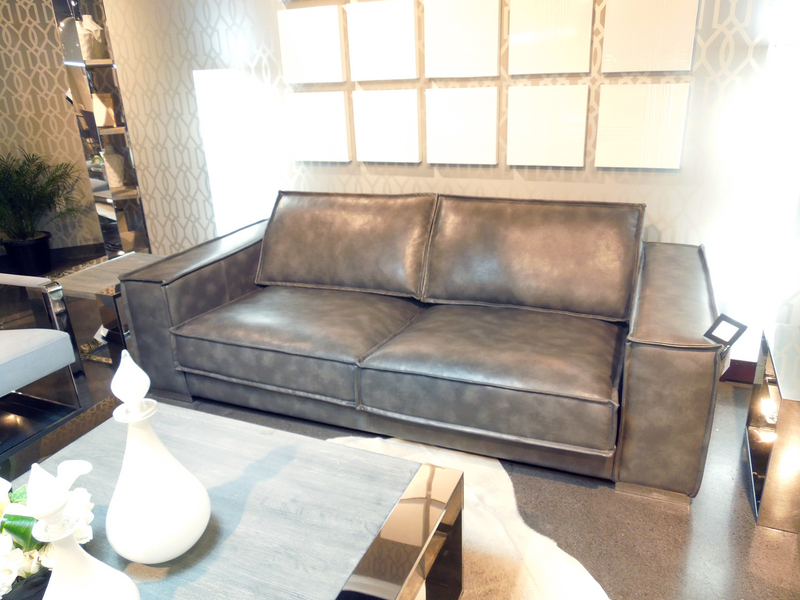 I saw a few sofas with flanges at the seams, like this one in a kind of foggy gray leather. It’s casual and interesting, but still makes quite a statement. 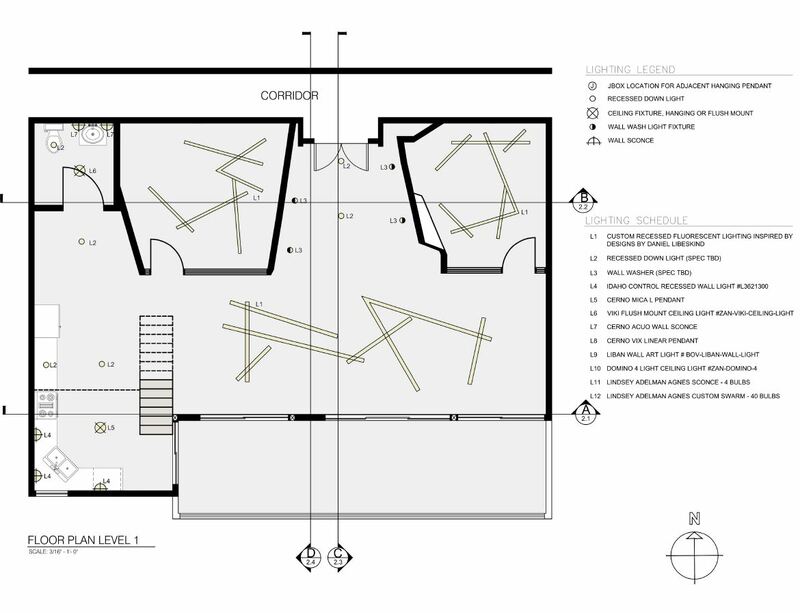 Even though it’s very masculine, I can still envision it in several different kinds of spaces. 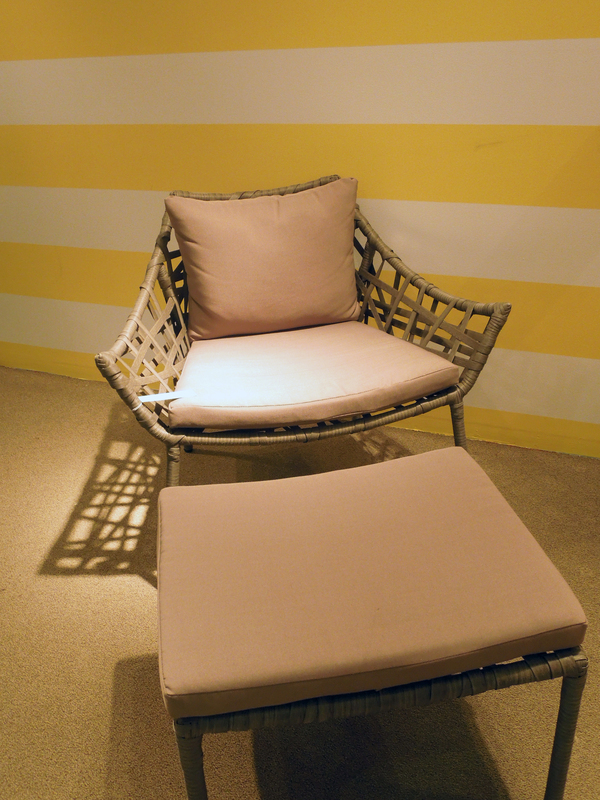 This outdoor lounge set has a unique, modern organic feel to it while still being suitable to outdoor wear and tear. 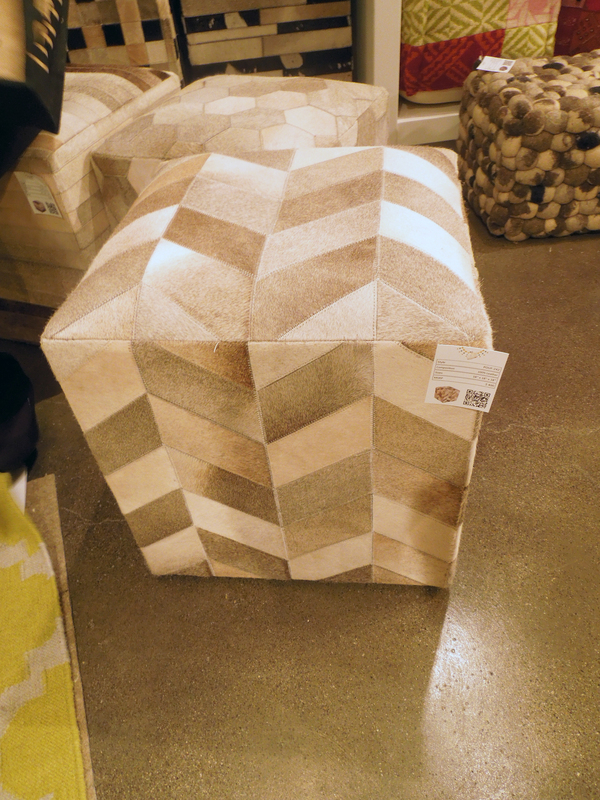 I thought this club chair was interesting. IAlittle industrial, a little art deco. As you can see, this was not the first time I saw chrome being used to make a statement at the Market. 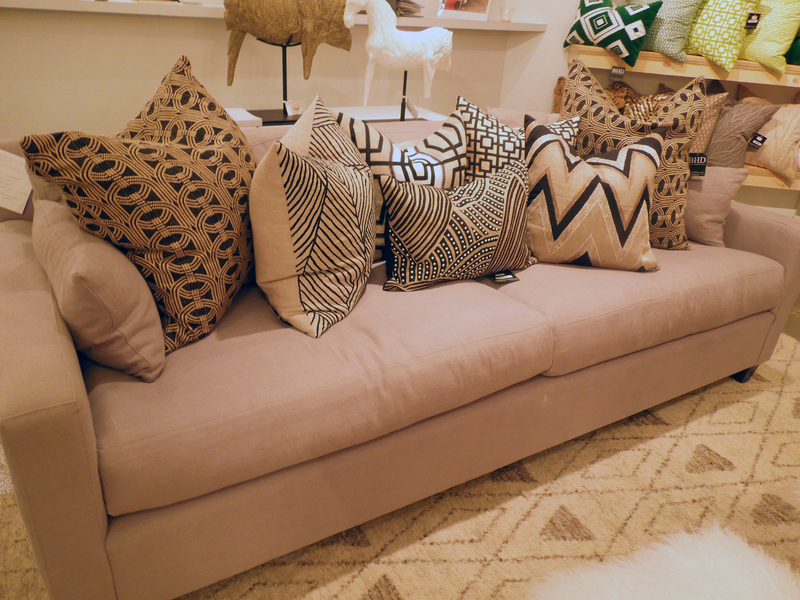 Sometimes it’s the simple things… I thought these patterned cow-hide ottomans were great! What can I say? 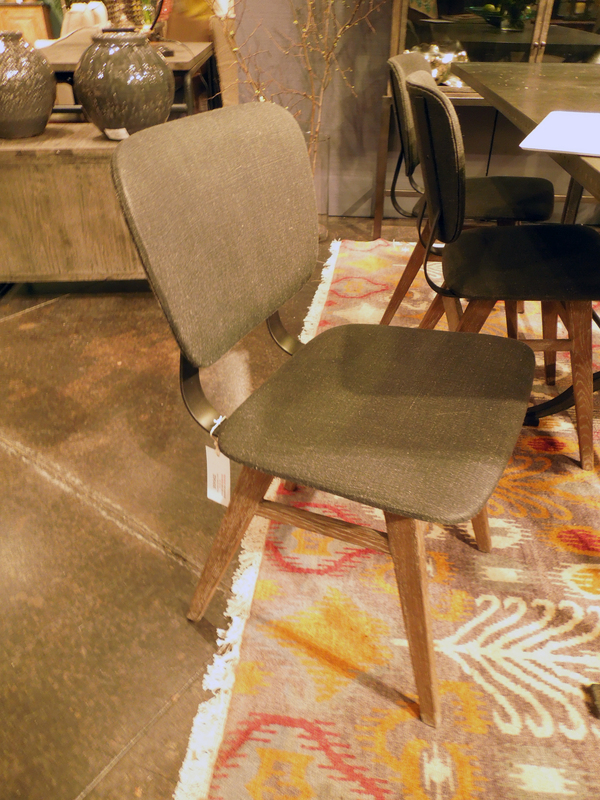 I’m a sucker for beautiful wood details, curves, and comfort, all three of which this chair has. 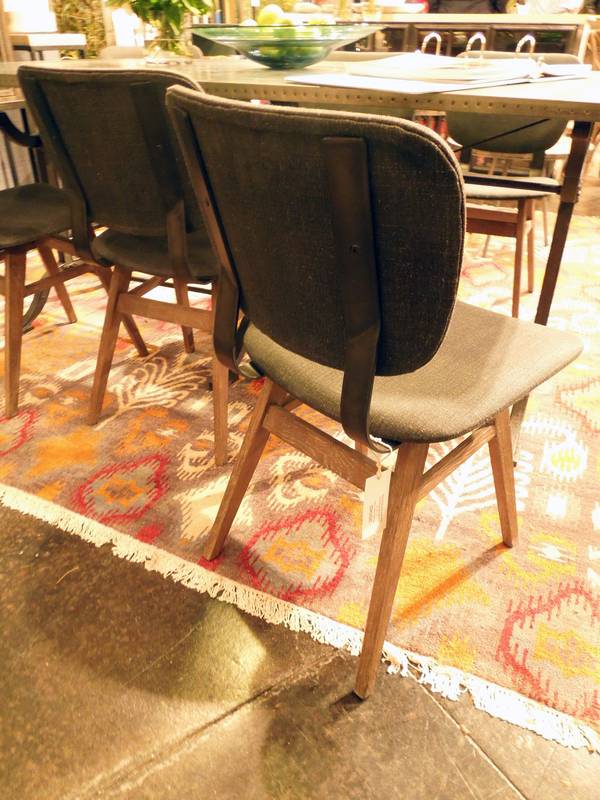 This side chair might not be the most unique in the world, but I loved the choice of pattern on the upholstery. 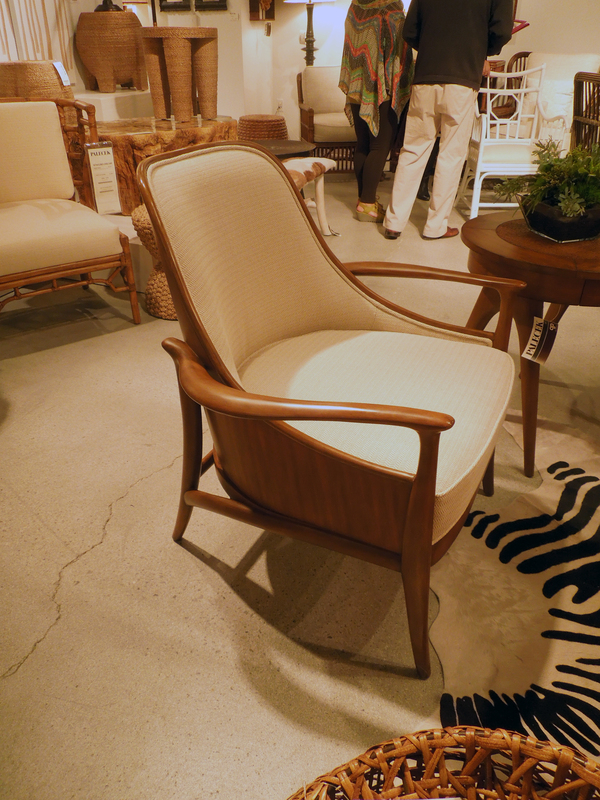 And in a complete style 180, I found this chair charming, especially with the great choice of color. I love coral. 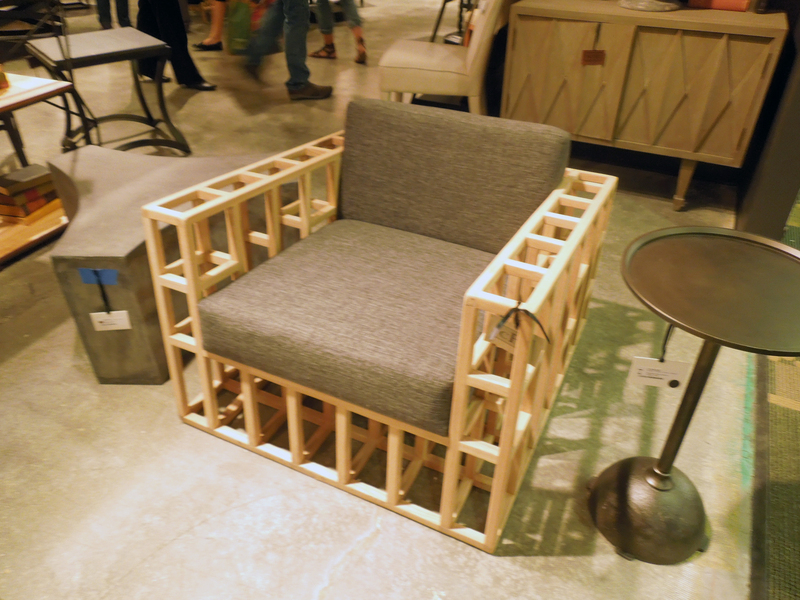 I feel like I see industrial drafting stools just about everywhere these days, so I found this geometric, modern take on them to be very refreshing, and much more unique. 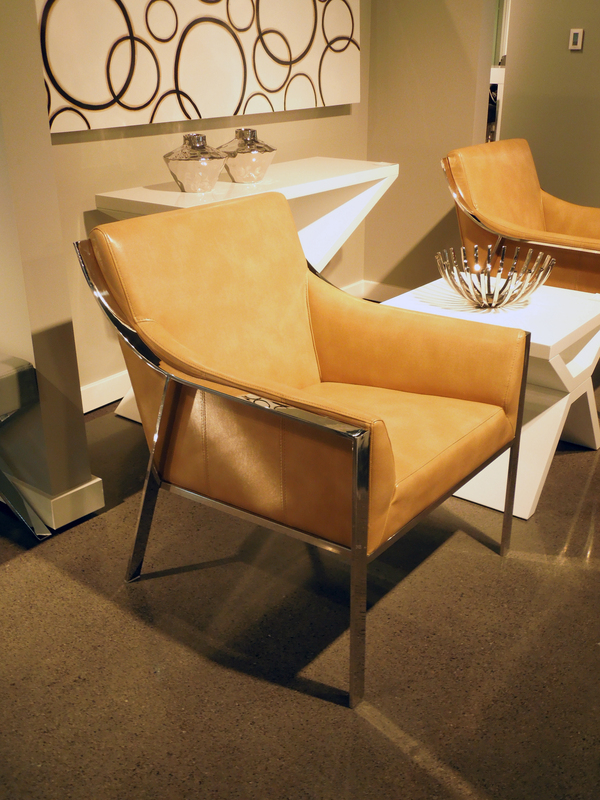 Stay tuned next week for more of my favorites from the Las Vegas Market! Which of these is your favorite? What do you love about it?